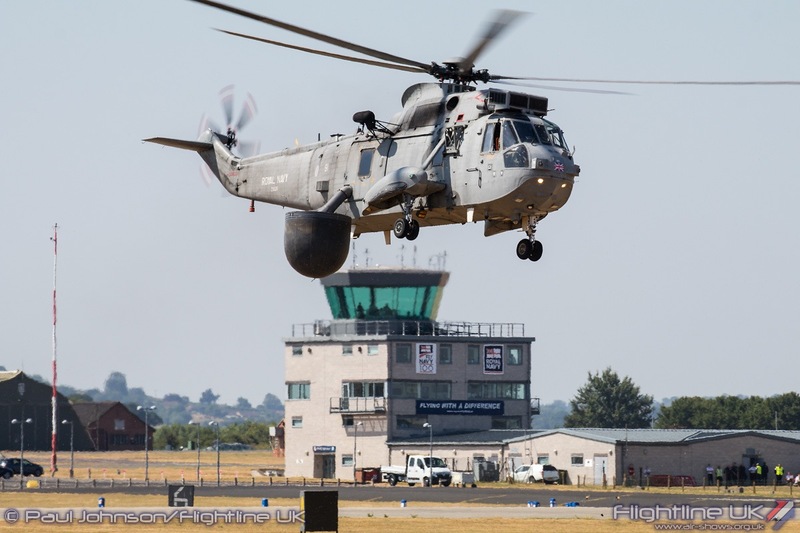 RNAS Yeovilton International Air Day opened the busy month of July. 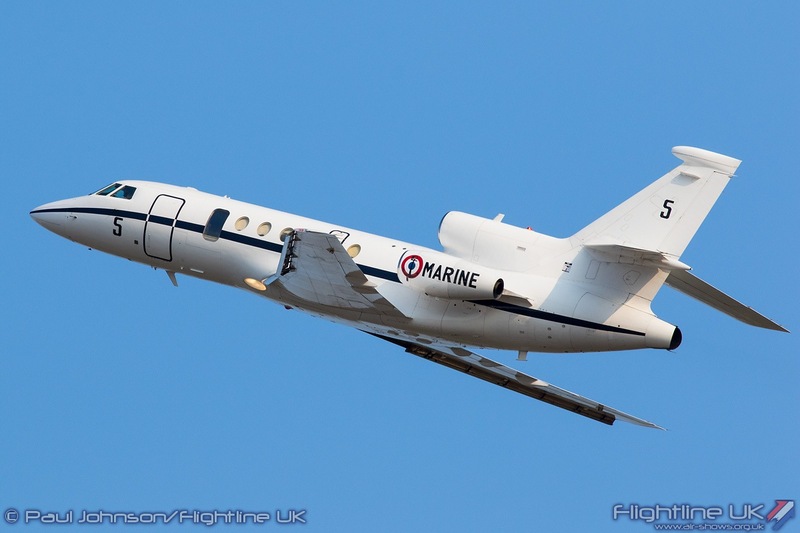 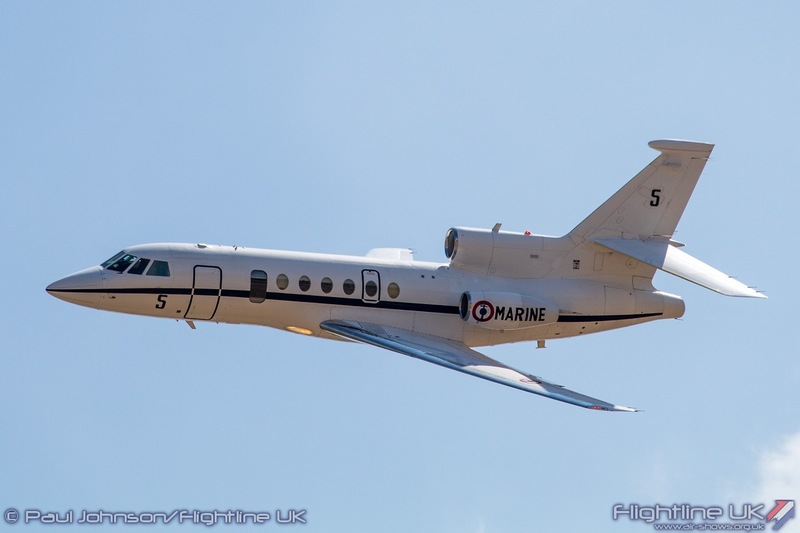 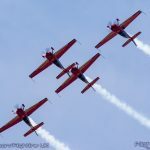 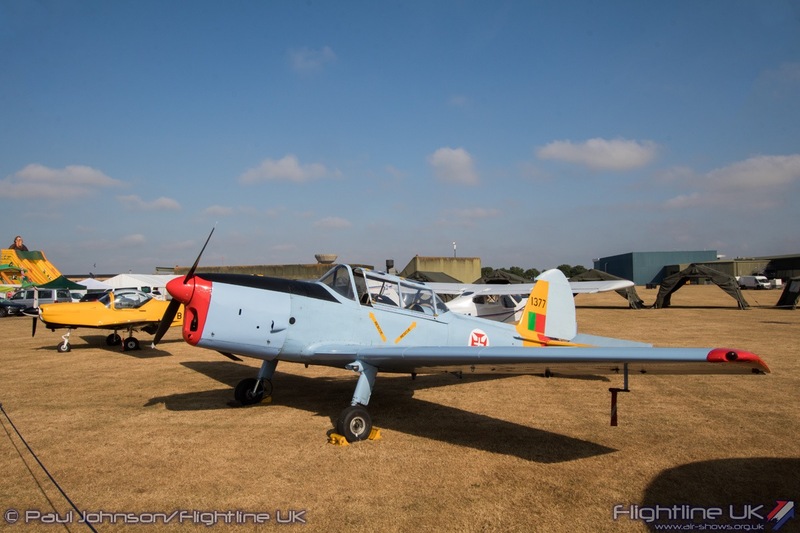 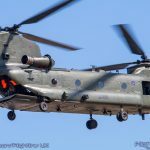 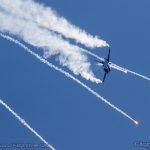 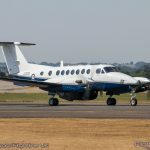 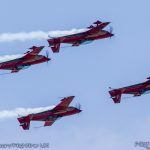 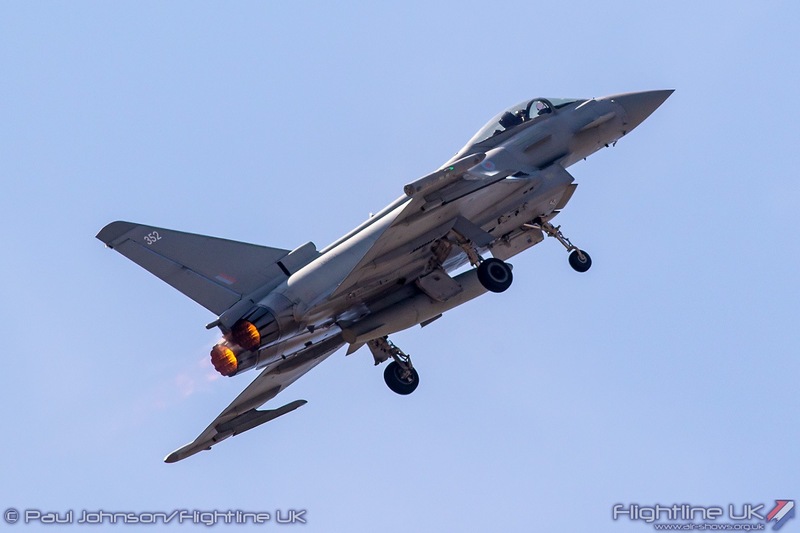 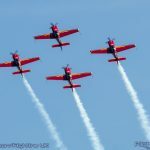 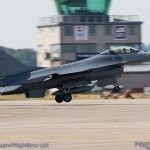 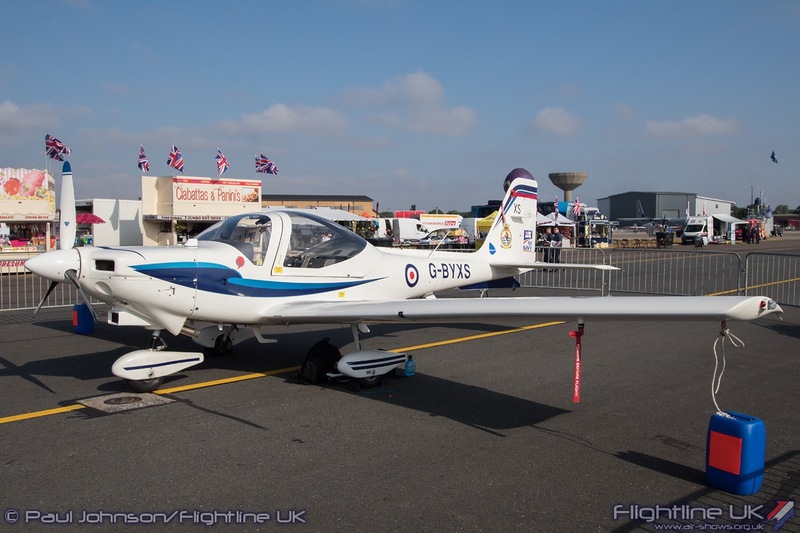 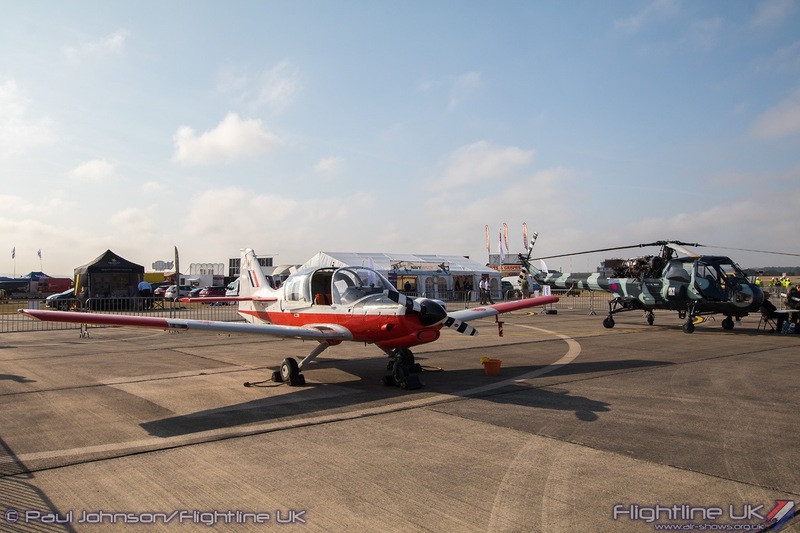 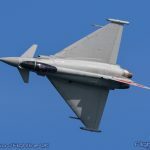 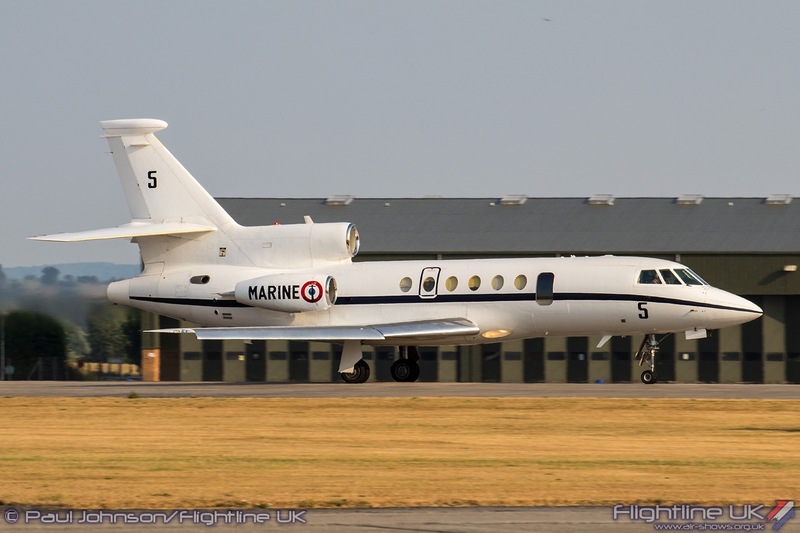 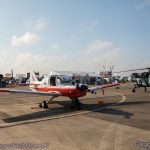 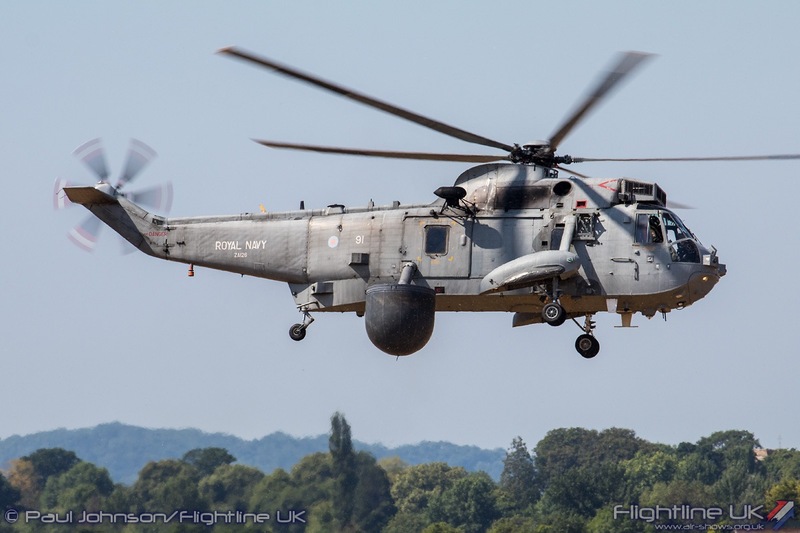 This year saw a very different Air Day with a very large collection of international military aircraft joining the Royal Navy’s showcase aviation event of the year both in the air and in the static displays. 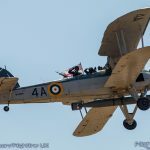 Unusually for a Royal Navy event, there was a significant nod to the junior service which was celebrating its 100th Anniversary in 2018. 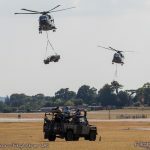 As ever the aviation was joined by many ground based attractions including some traditional Field Gun runs and music from the Band of the Royal Marines. 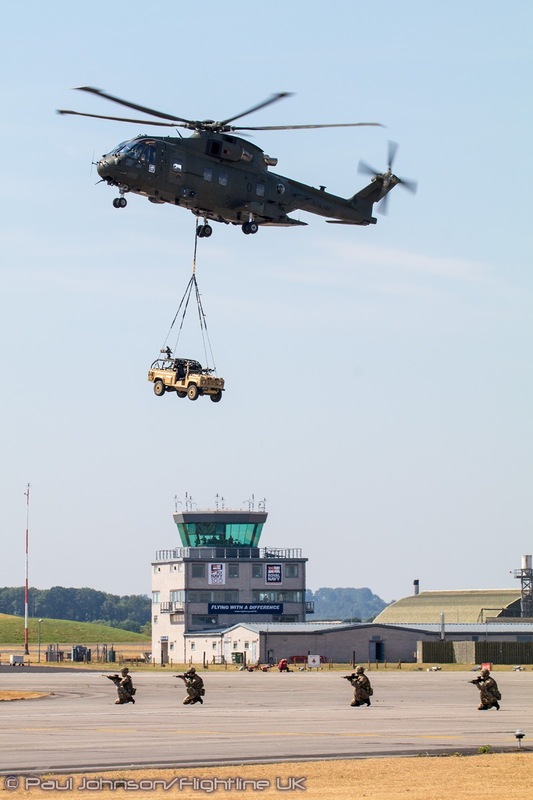 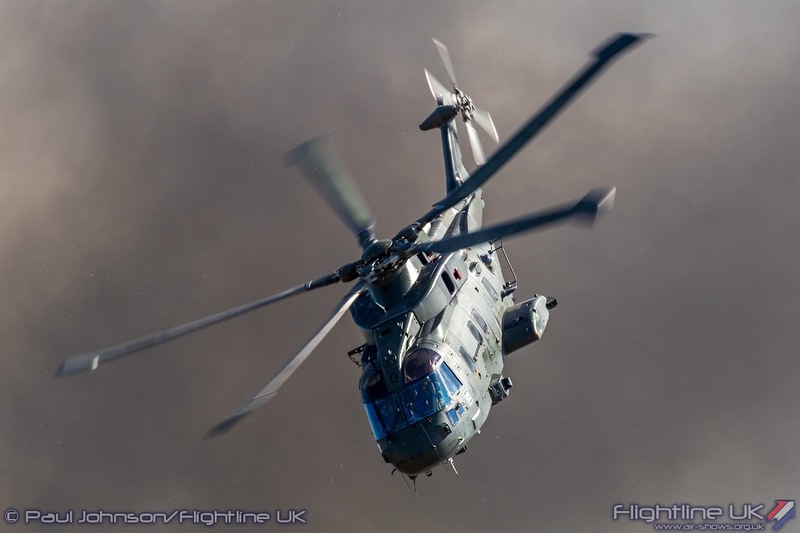 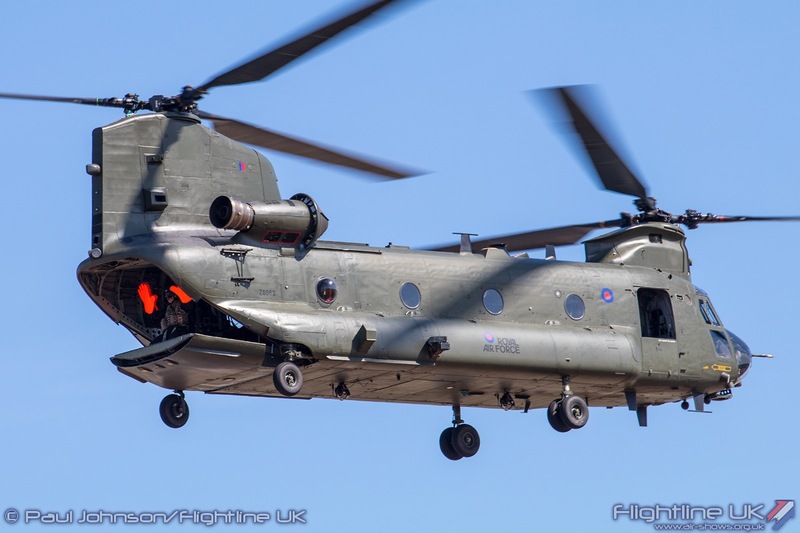 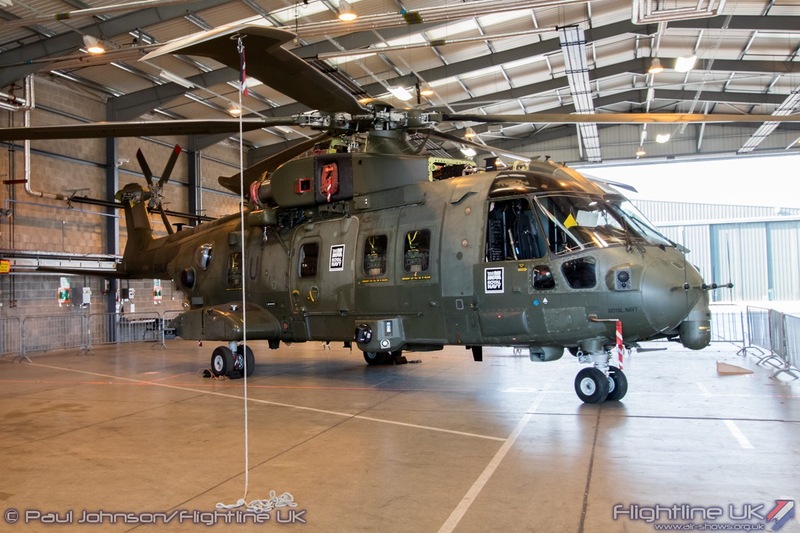 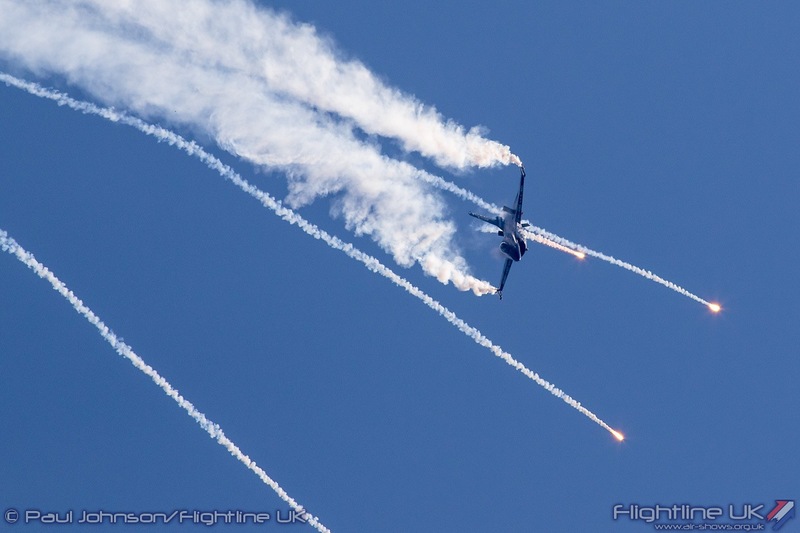 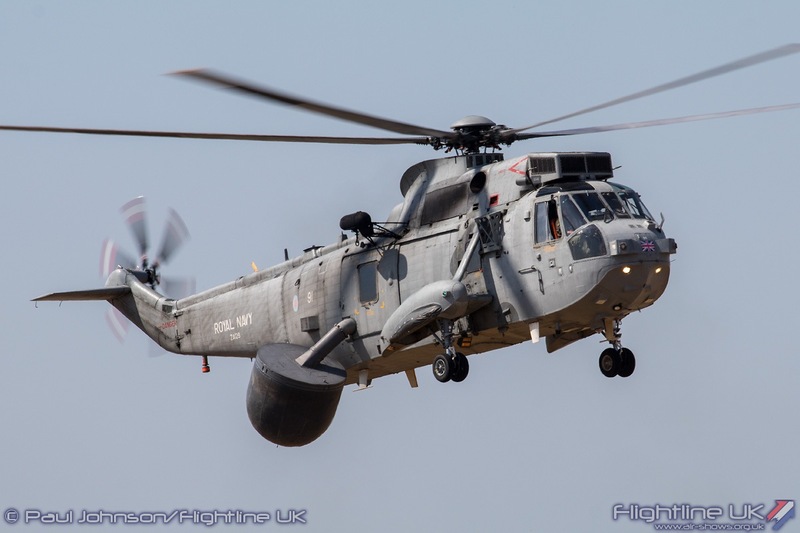 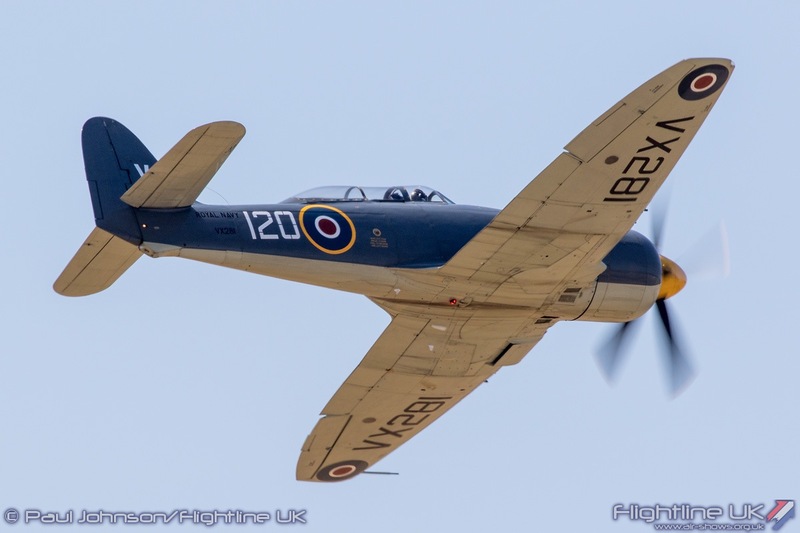 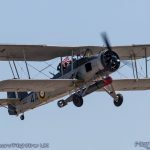 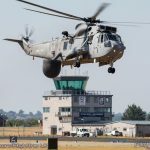 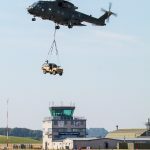 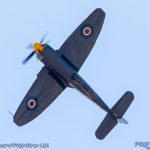 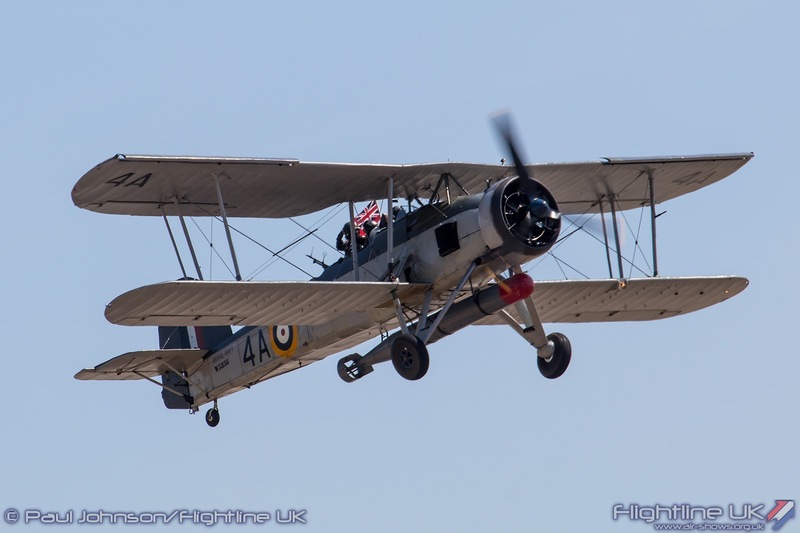 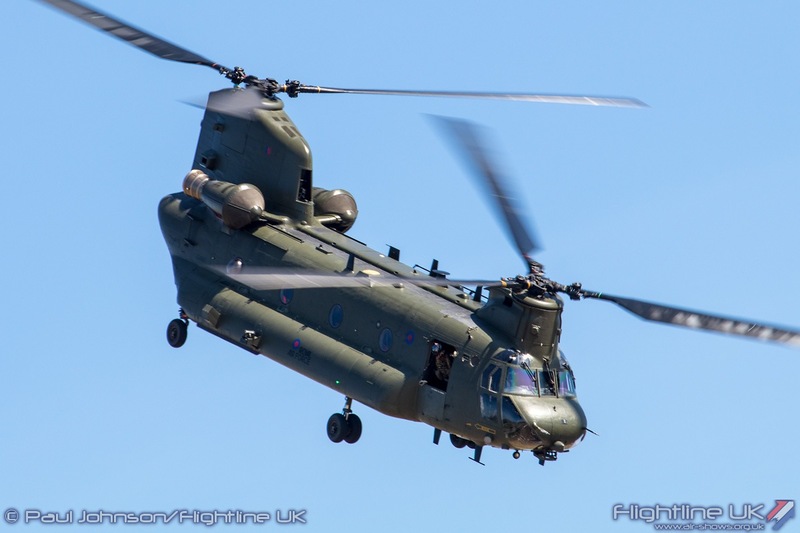 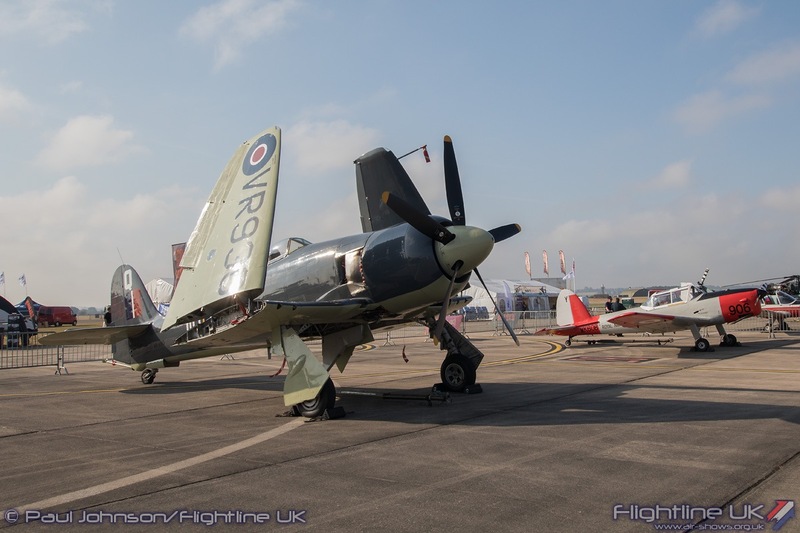 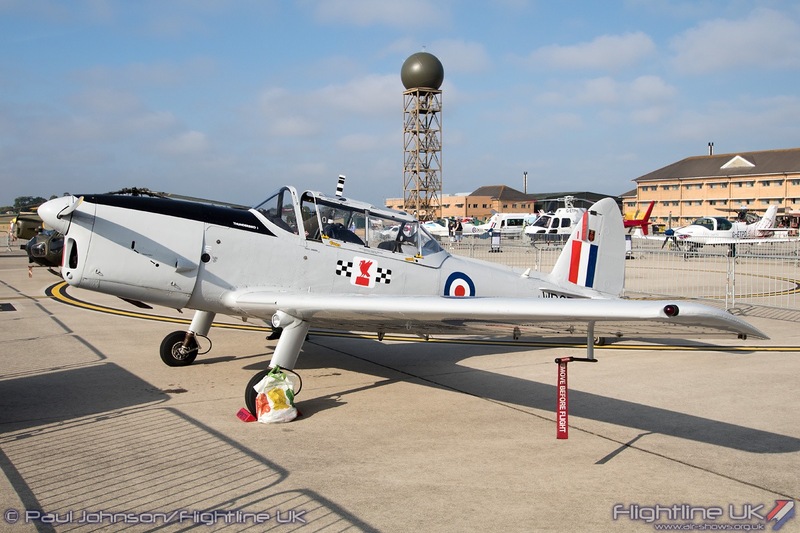 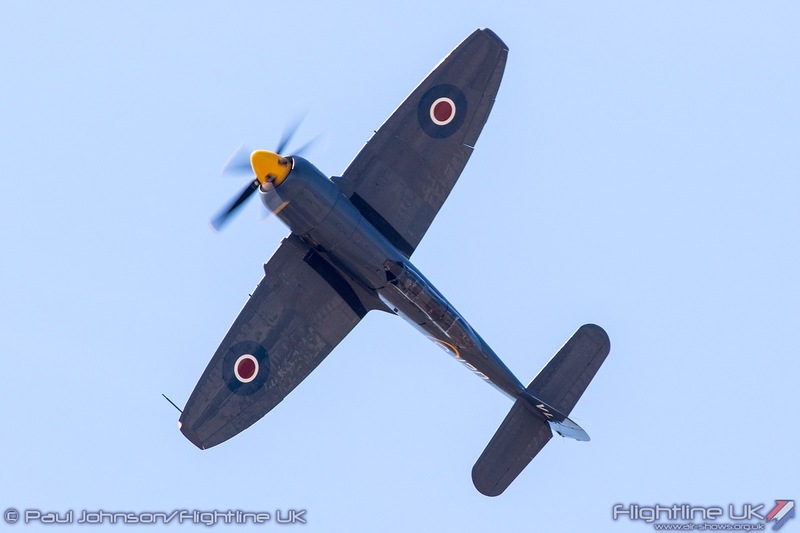 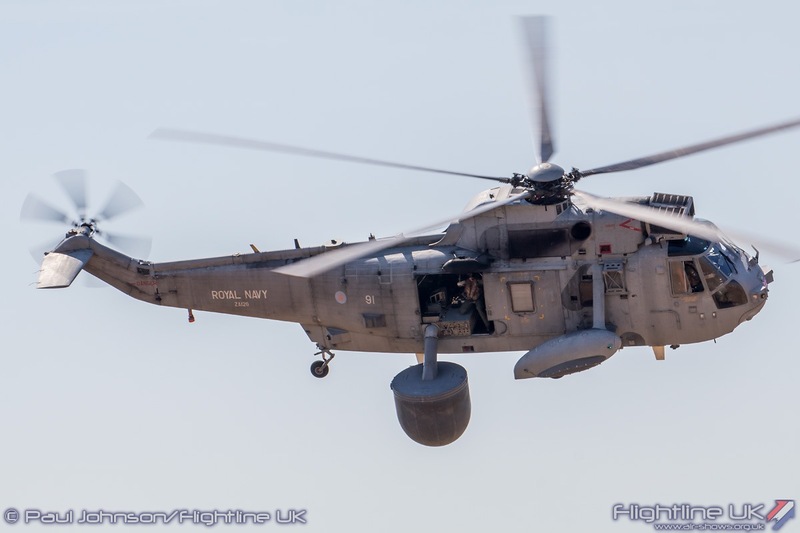 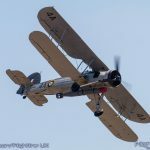 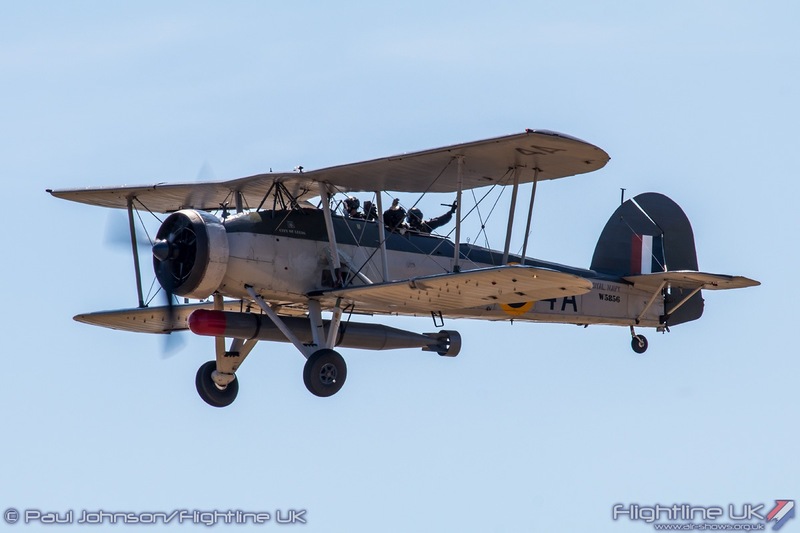 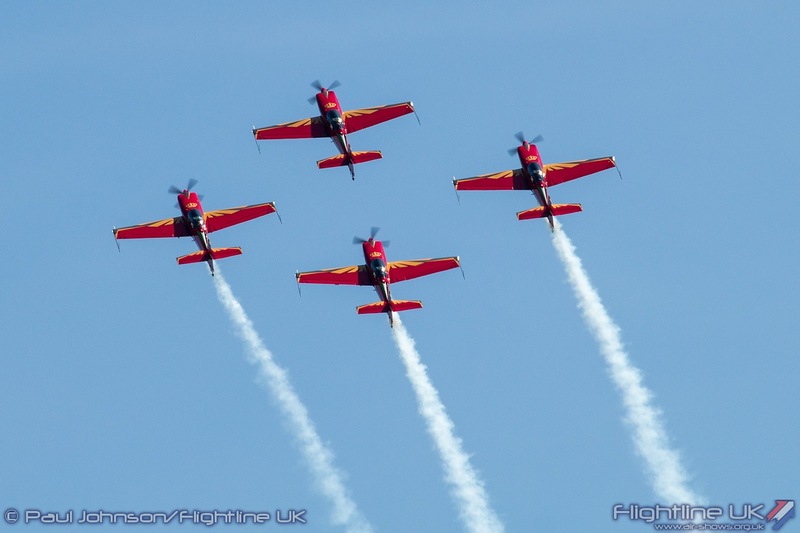 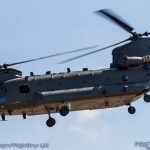 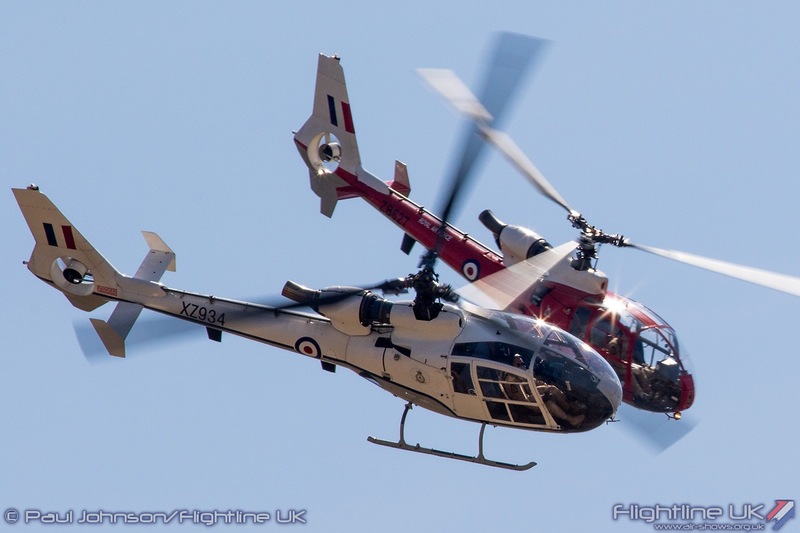 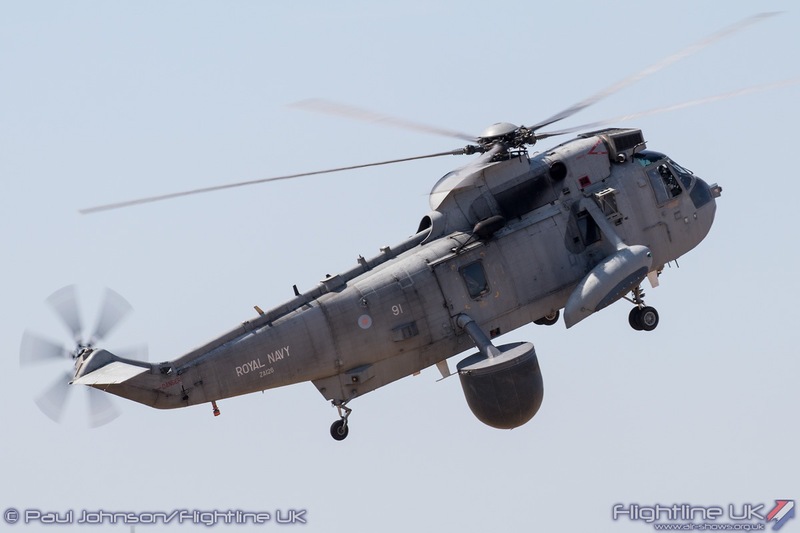 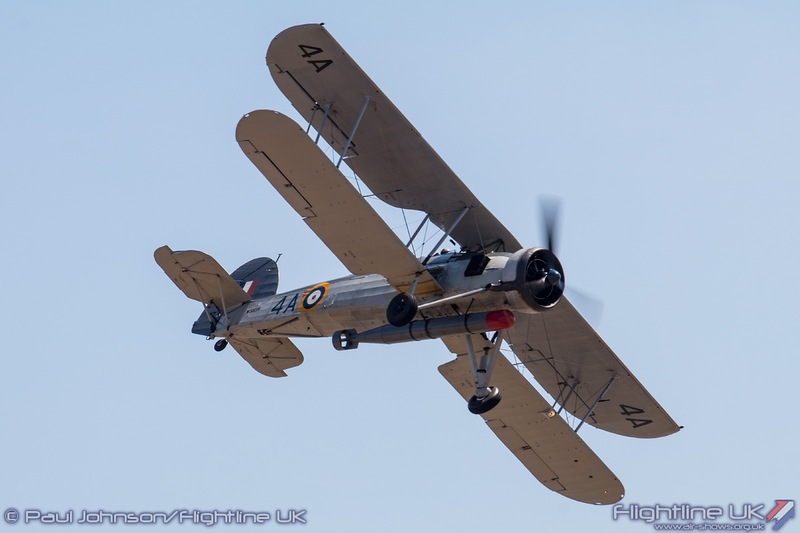 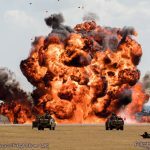 RNAS Yeovilton International Air Day is the Royal Navy’s main aviation showcase with the aim of showing off not only its own capabilities, but also those of the British Army, the Royal Air Force and international allies. 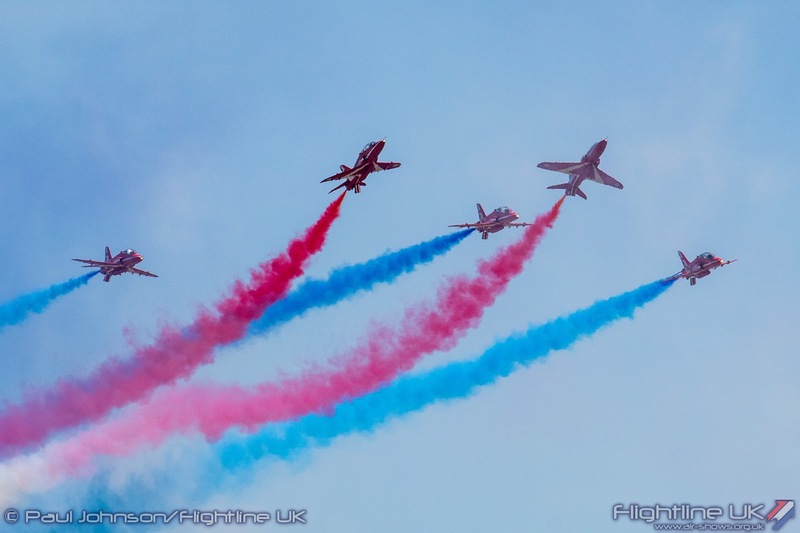 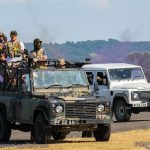 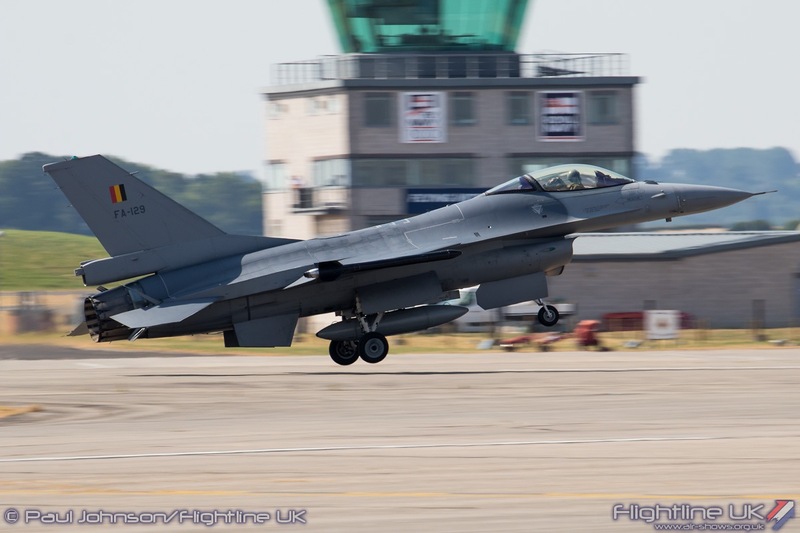 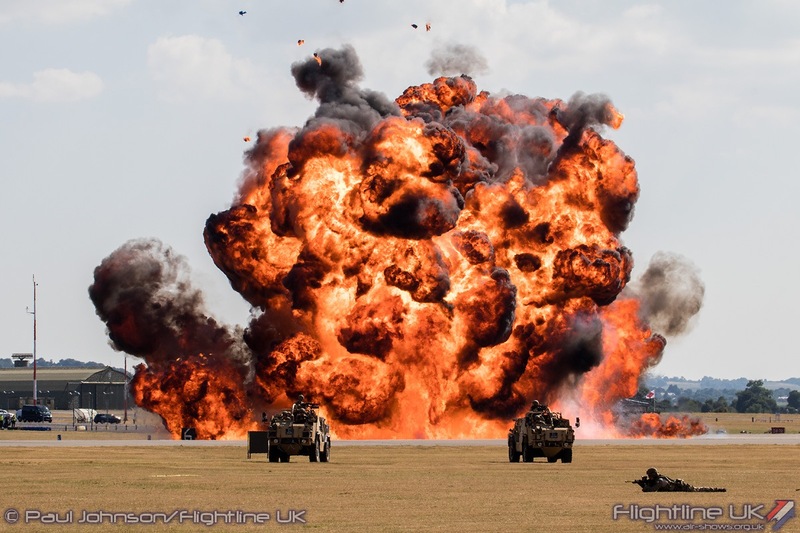 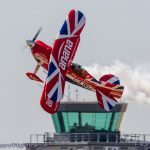 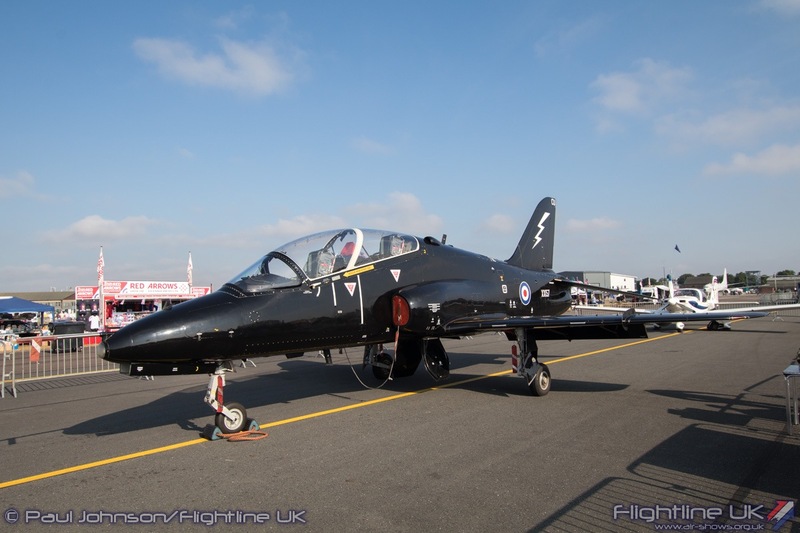 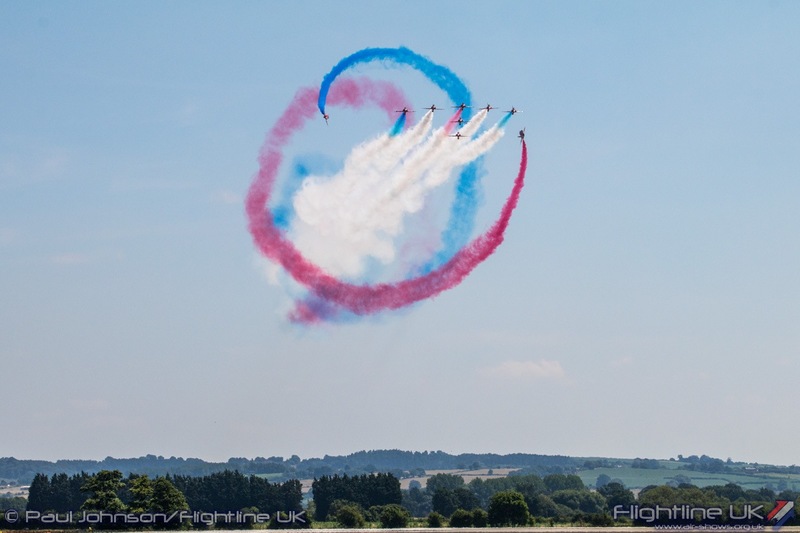 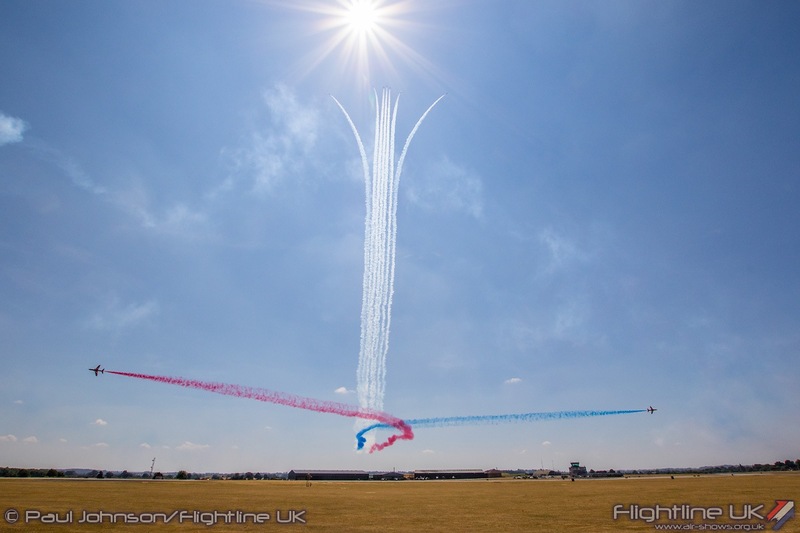 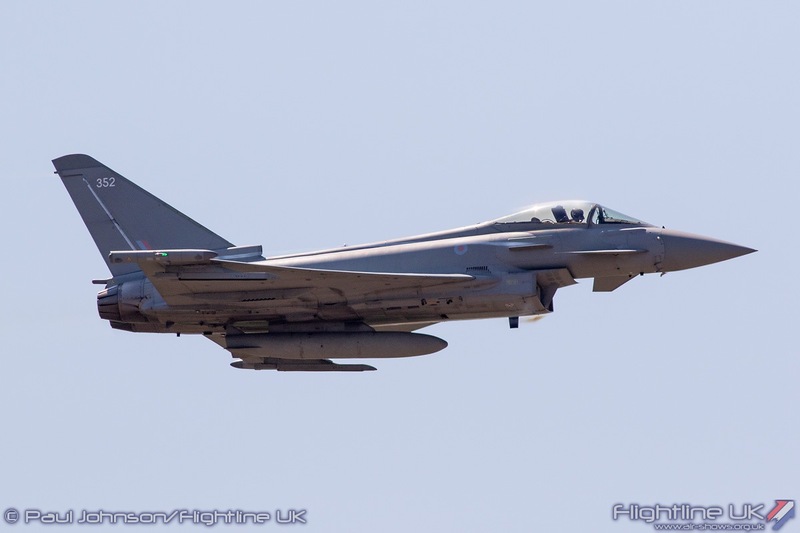 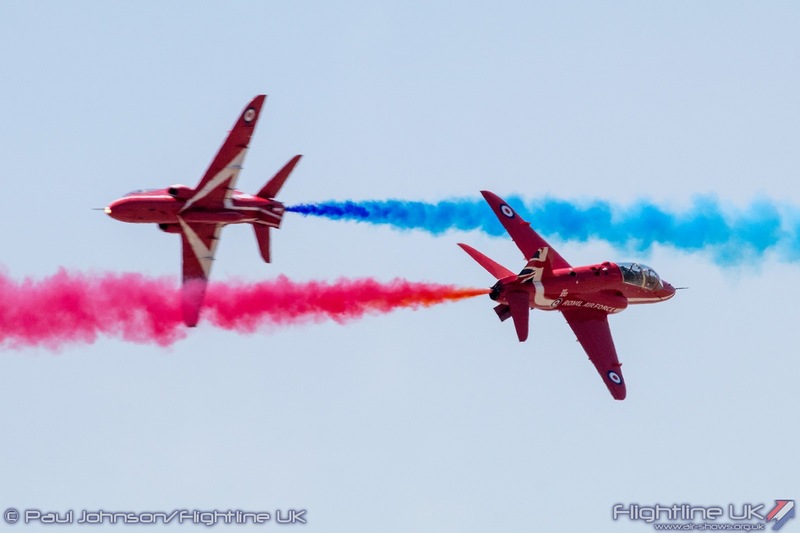 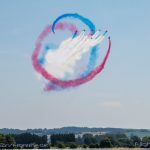 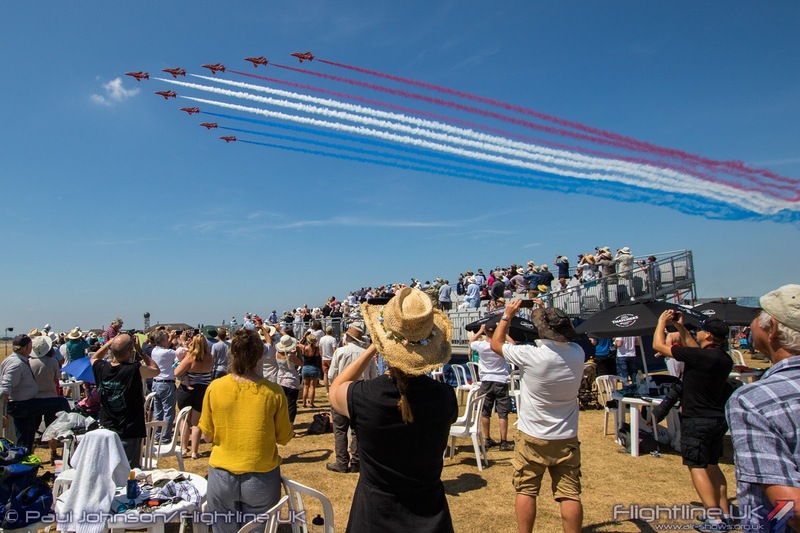 It is now one of just two military bases in the UK that hold a major international airshow allowing the public to experience a busy military airfield and to meet many serving personnel. 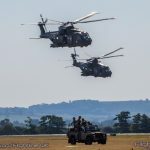 2018 did not really see a major theme to the event but as always, Yeovilton put on a great show on the ground with a static display of aircraft from around the world augmented with industry hangar exhibitions and various military displays. 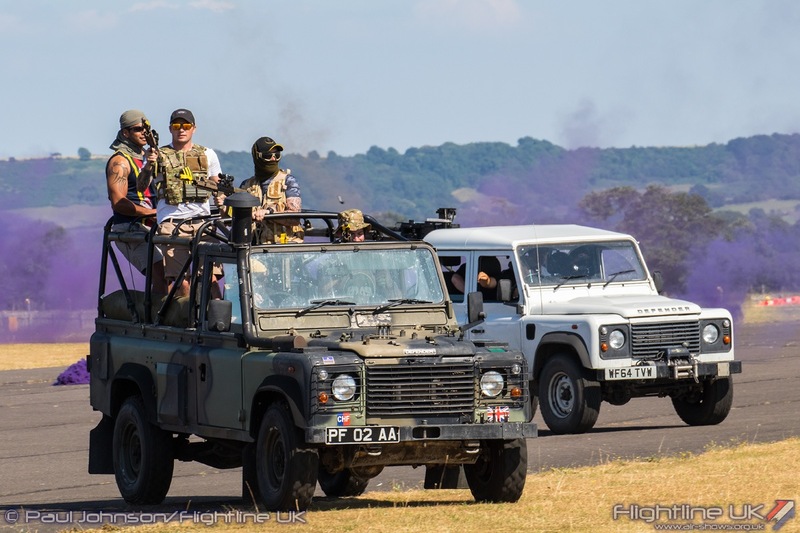 Naval heritage is very much to the fore with a Field Gun Run competition and also the Band of the Royal Marines. 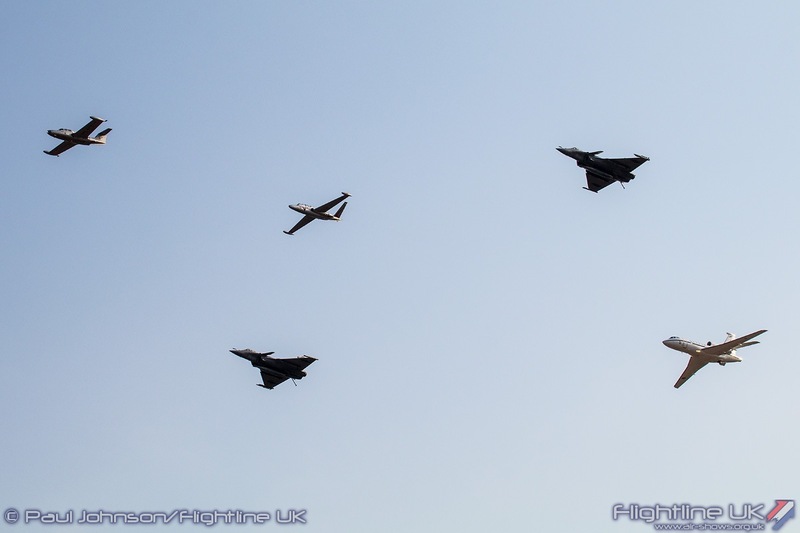 Air Day was a particularly international affair this year. 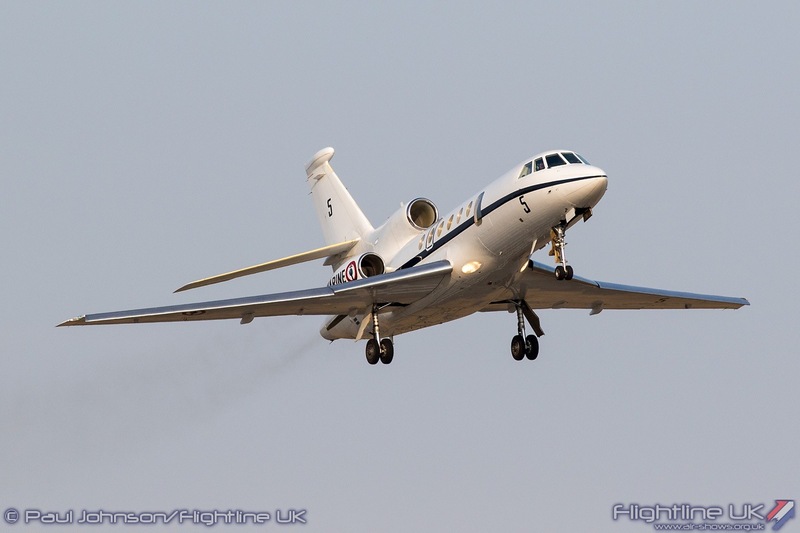 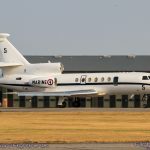 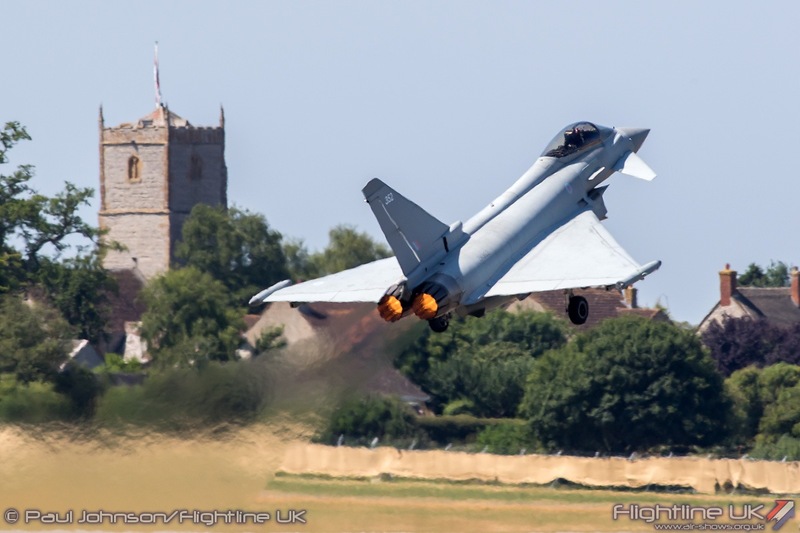 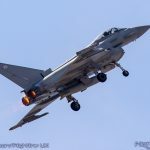 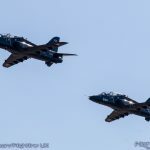 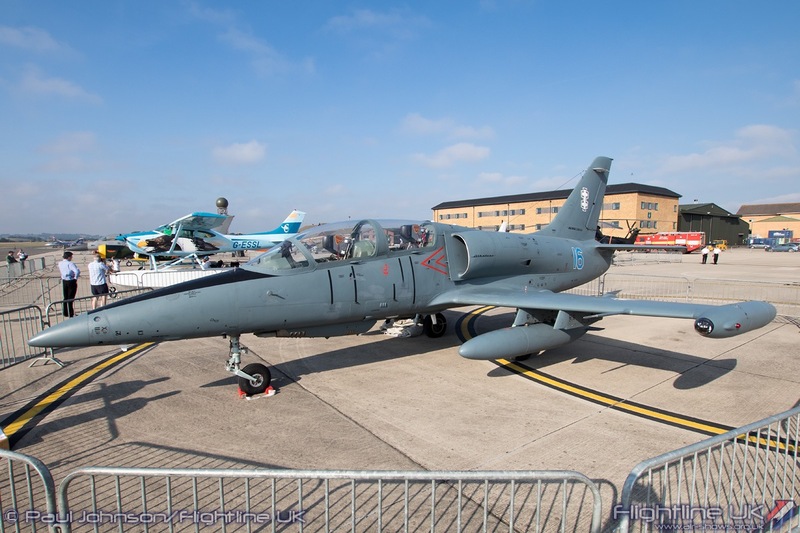 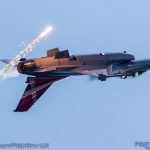 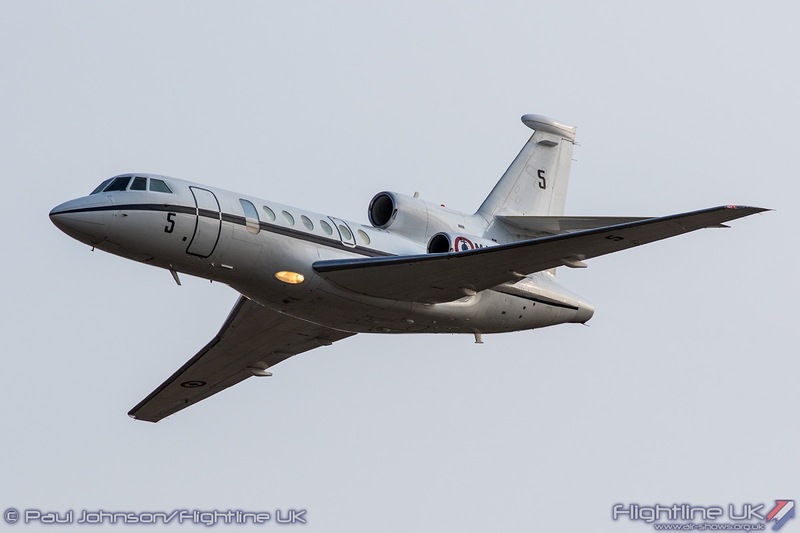 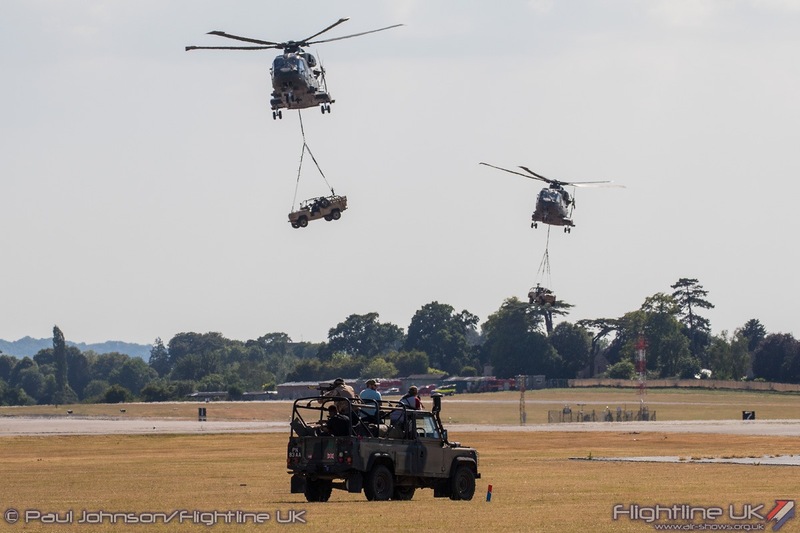 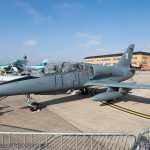 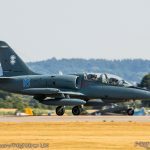 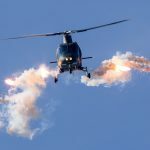 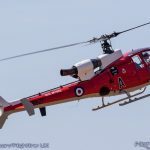 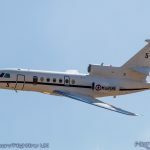 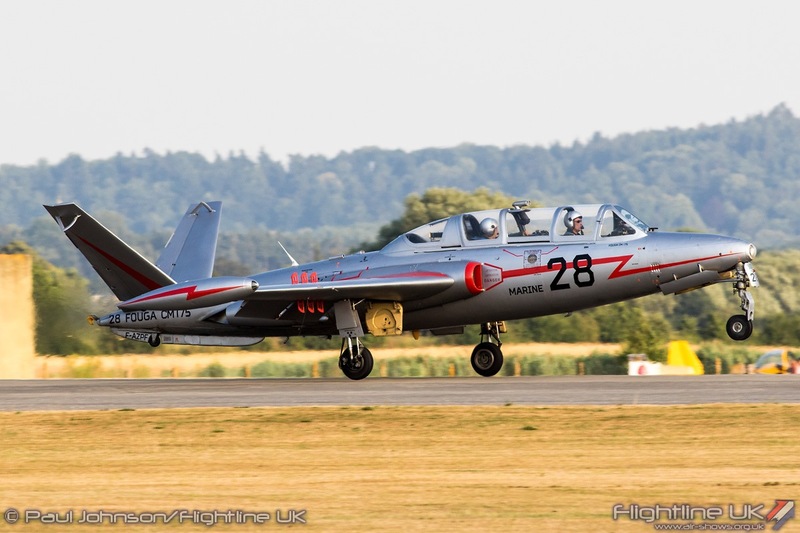 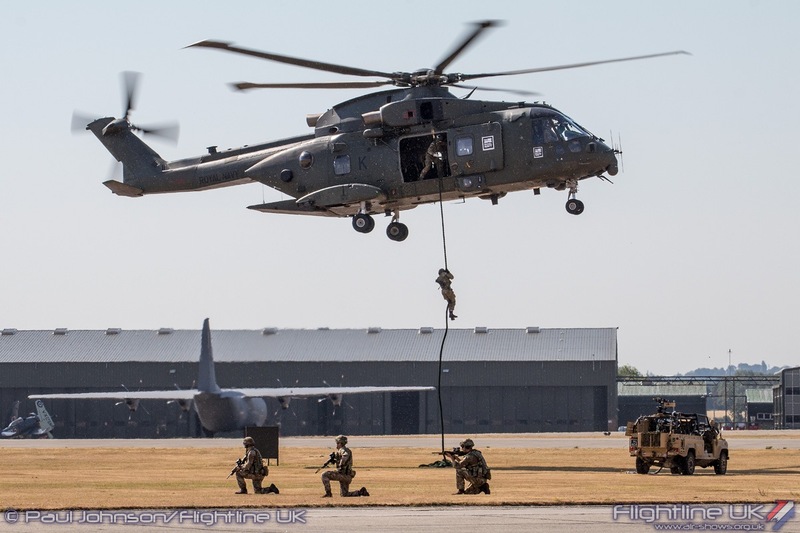 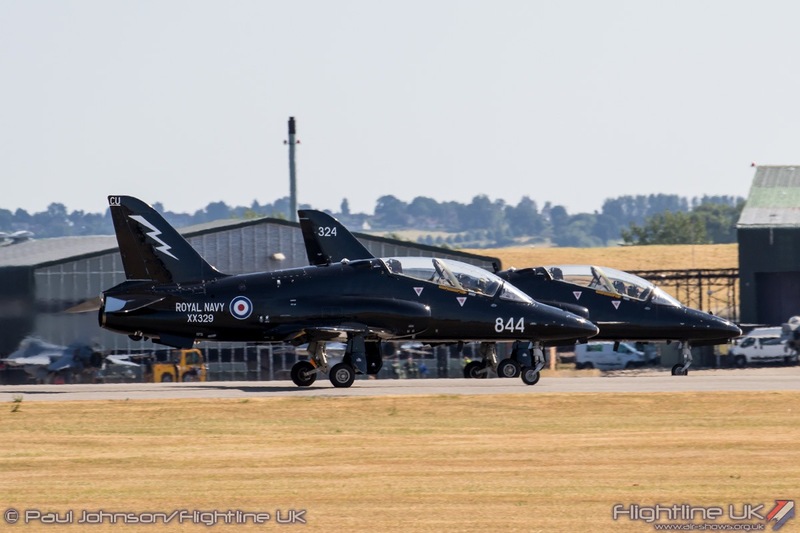 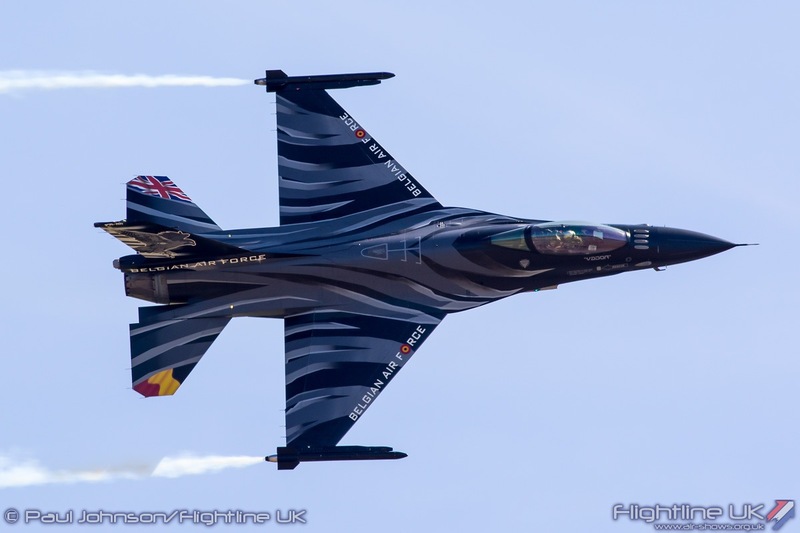 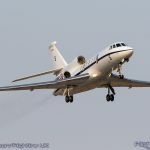 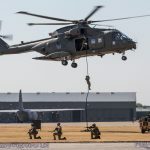 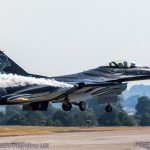 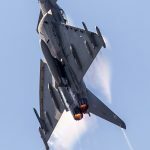 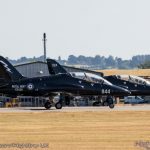 With the expanded RIAT getting underway on the following Tuesday, many air arms chose to extend their stay in the UK making an early public appearance at Yeovilton. 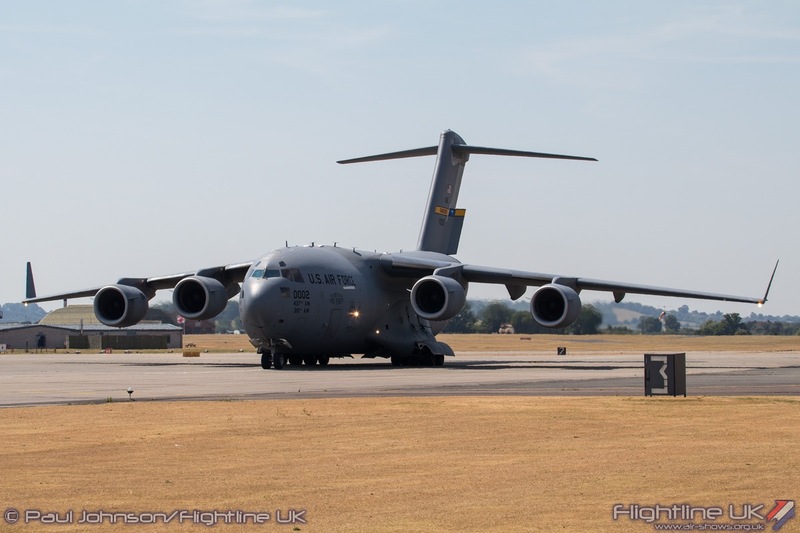 Perhaps most notable about this year’s static display were the large number of heavy aircraft. 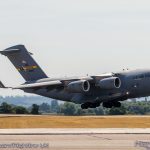 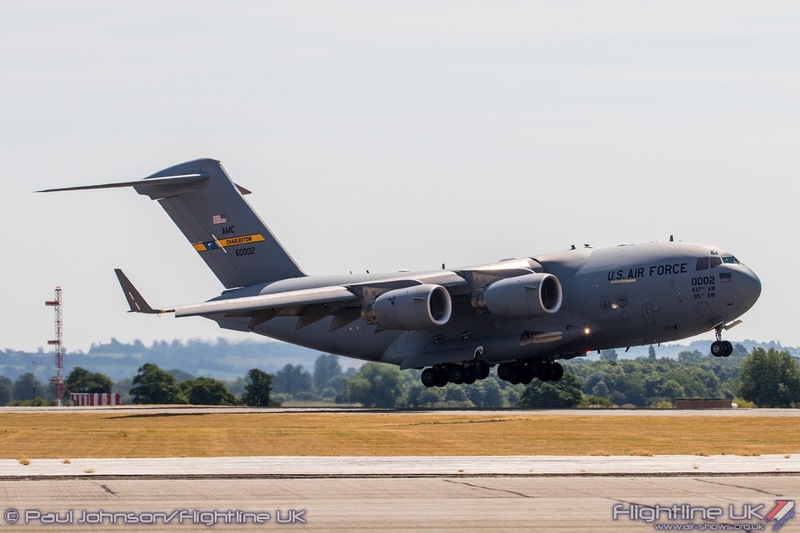 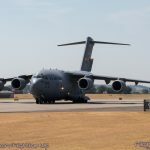 The United States Air Force 315th Airlift Wing have become Air Day regulars with their Boeing C-17A Globemaster III towering over the public area and proving a popular attraction for cabin tours. 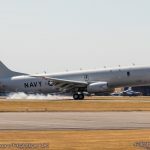 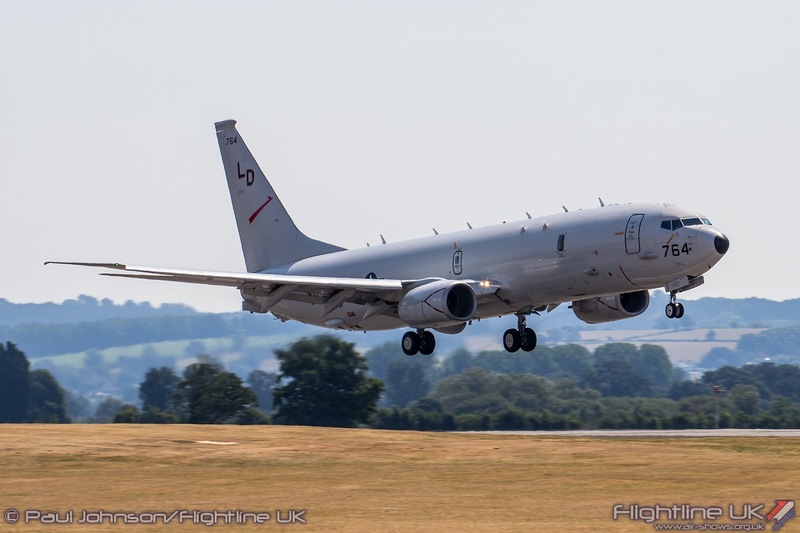 Further US participation came from the US Navy making their first Air Day appearance for many years with a Boeing P-8A Poseidon maritime patrol aircraft. 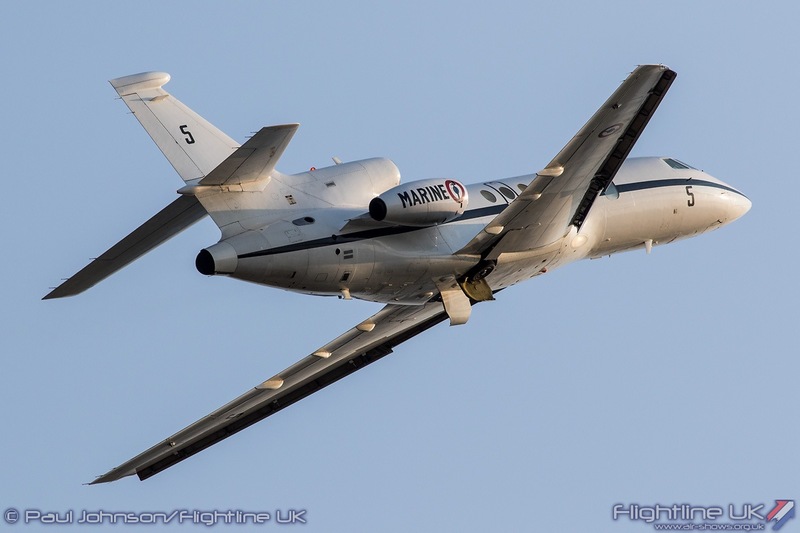 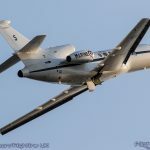 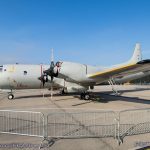 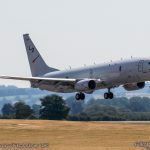 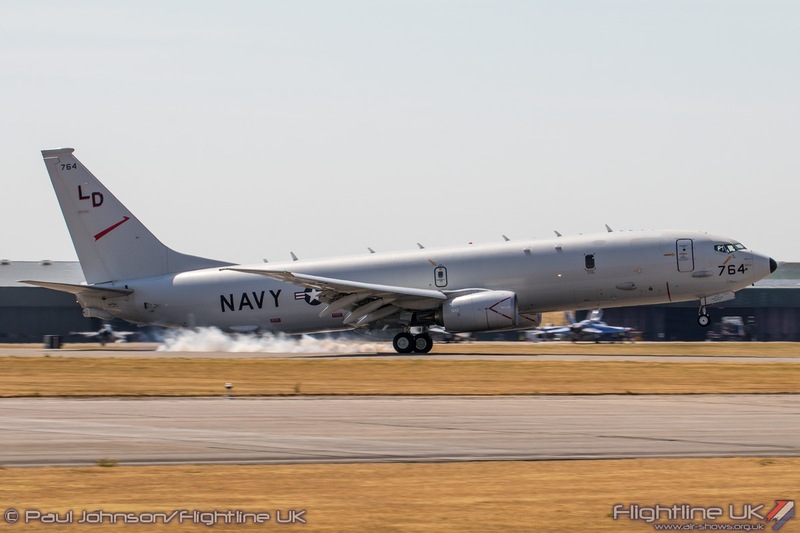 The P-8 will soon enter service with the Royal Air Force restoring the Maritime Patrol capability but is also in the running for a number of different MPA requirements around the world so was touring the major UK shows during July. 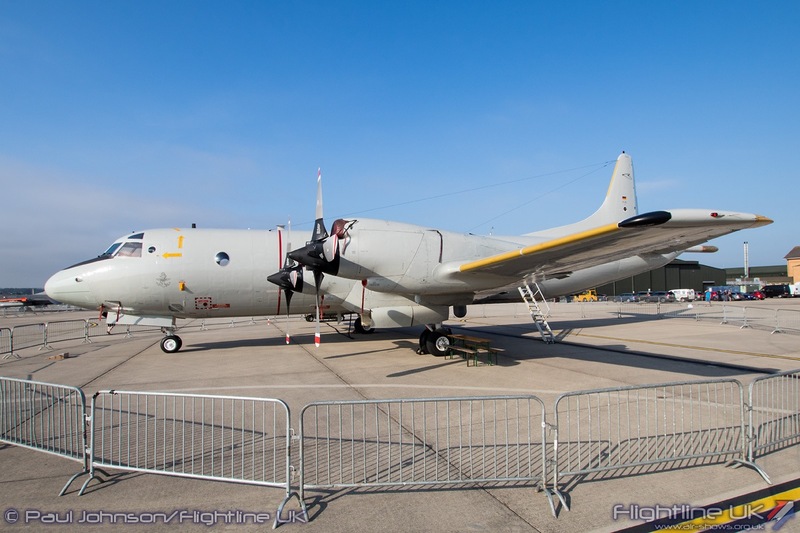 The P-8’s predecessor, the Lockheed P-3C Orion was also represented in the static display with an example from the German Navy. 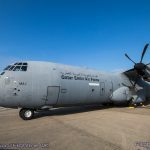 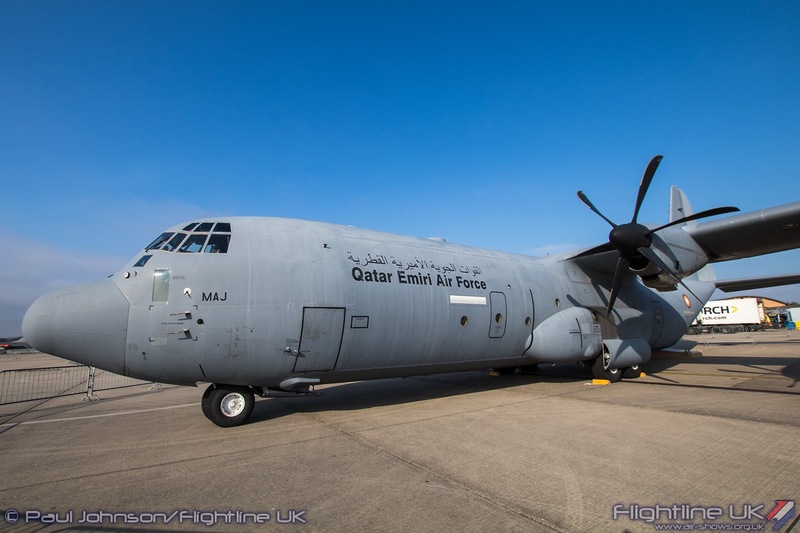 A late addition to the static display was a Lockheed Martin C-130J-30 Hercules II from the Qatari Emiri Air Force. 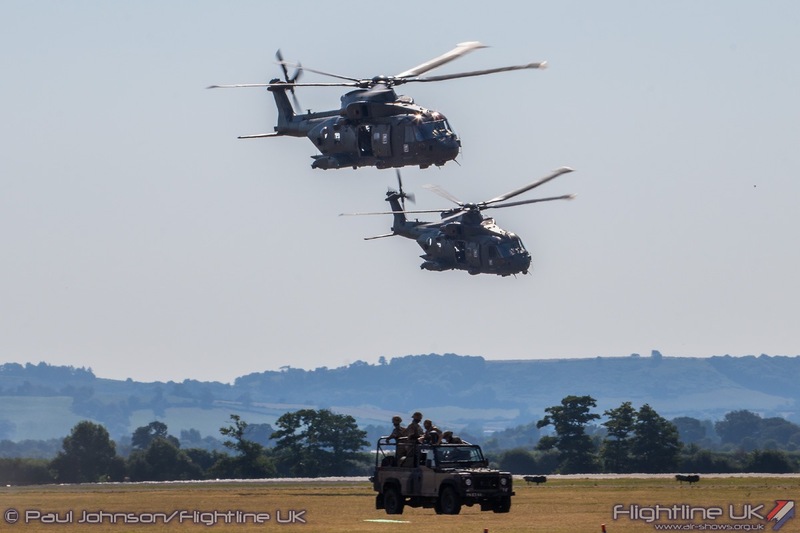 Though the QEAF have visited other UK shows before, this was their first time at Yeovilton. 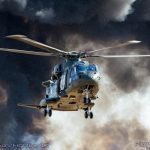 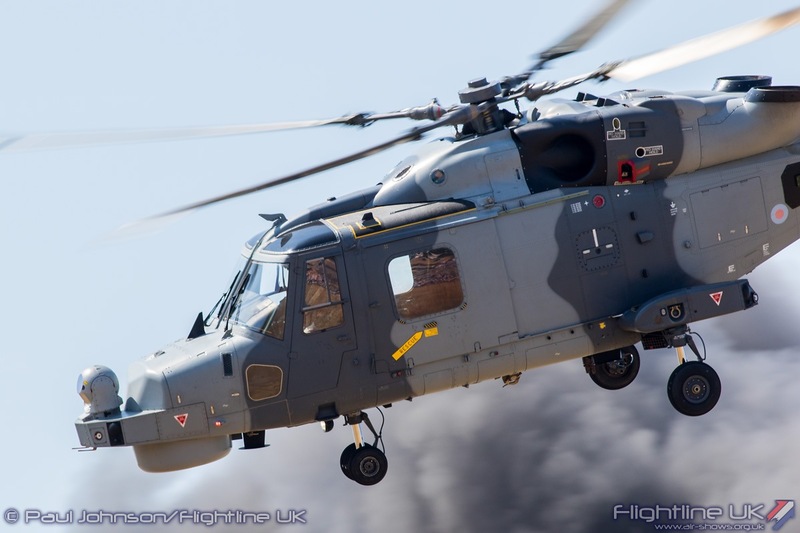 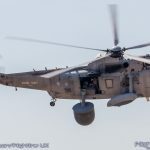 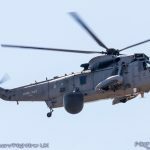 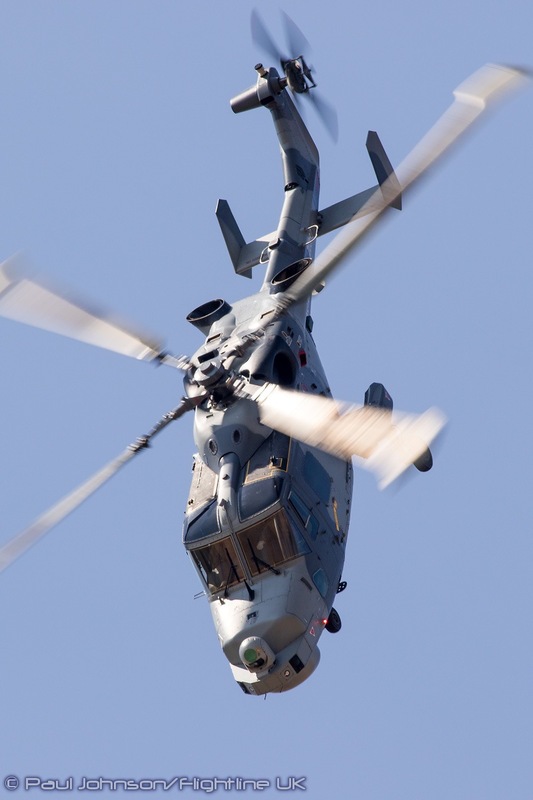 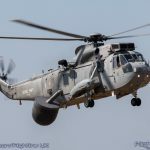 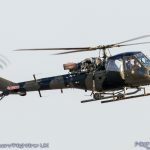 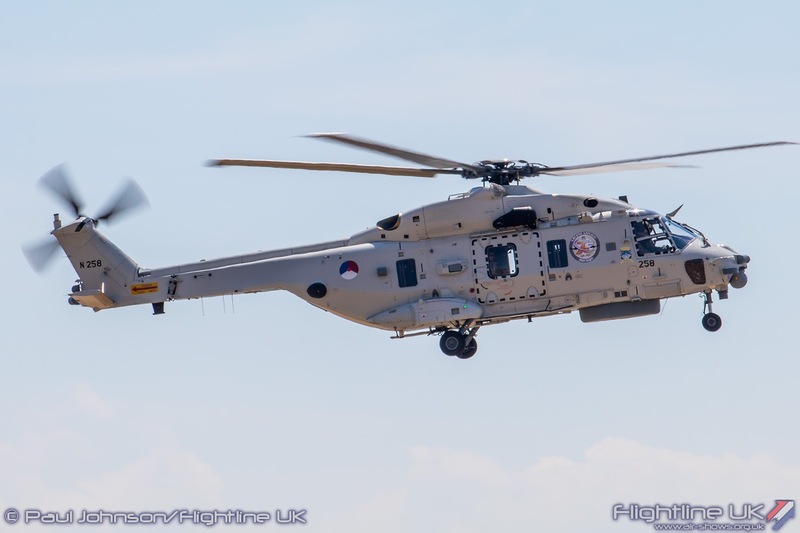 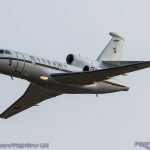 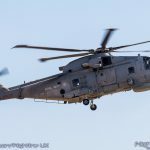 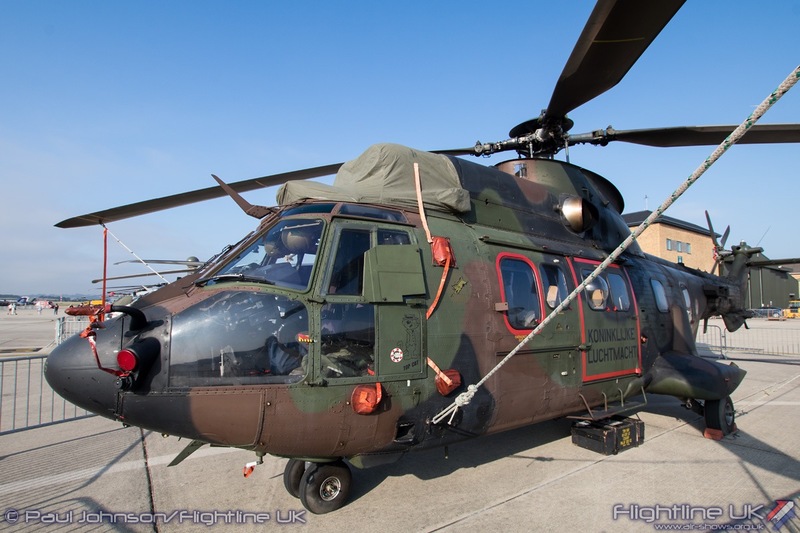 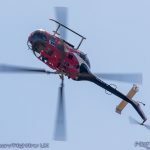 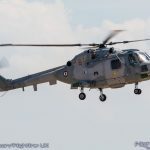 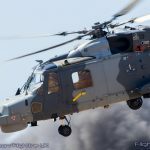 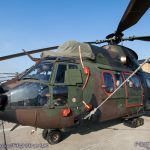 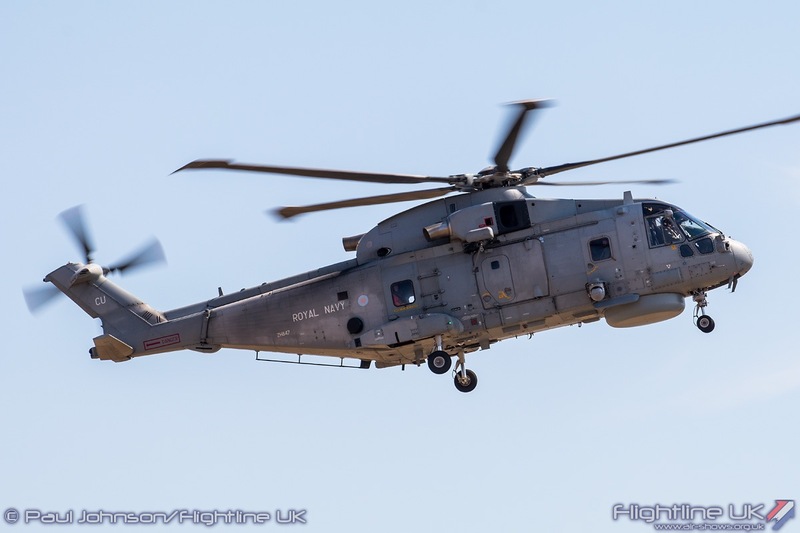 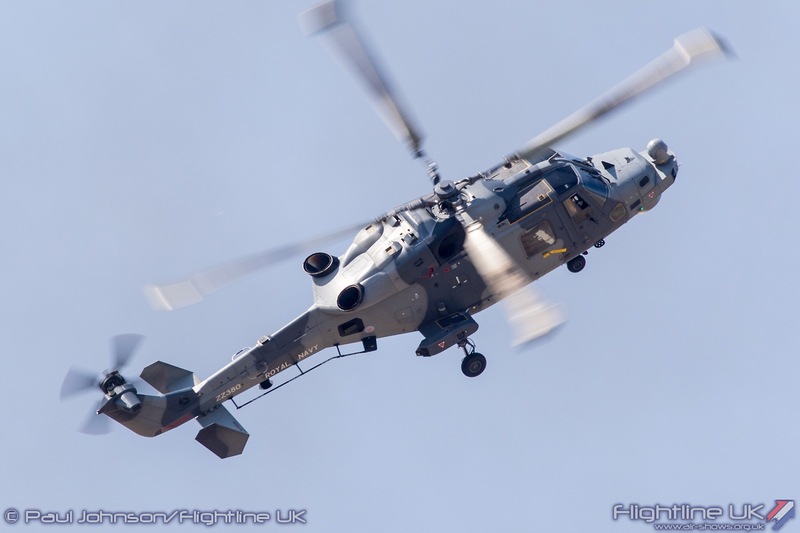 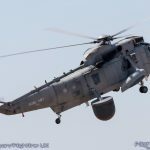 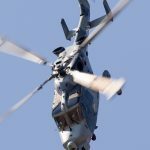 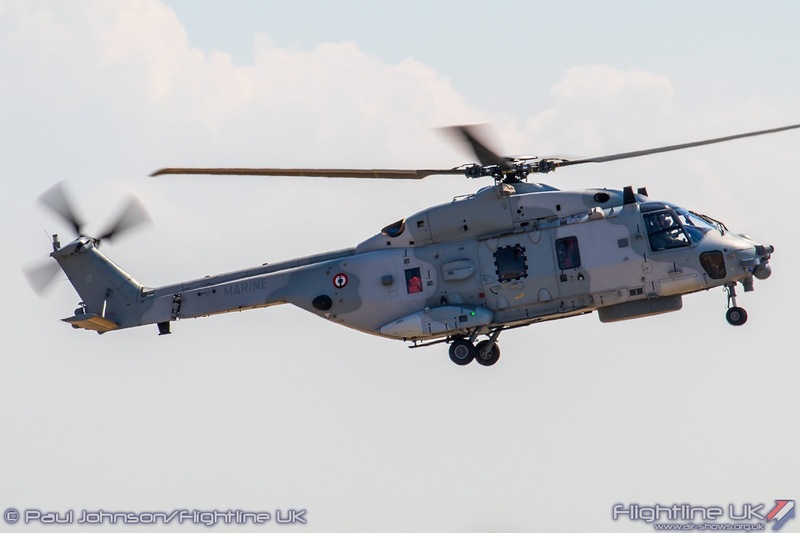 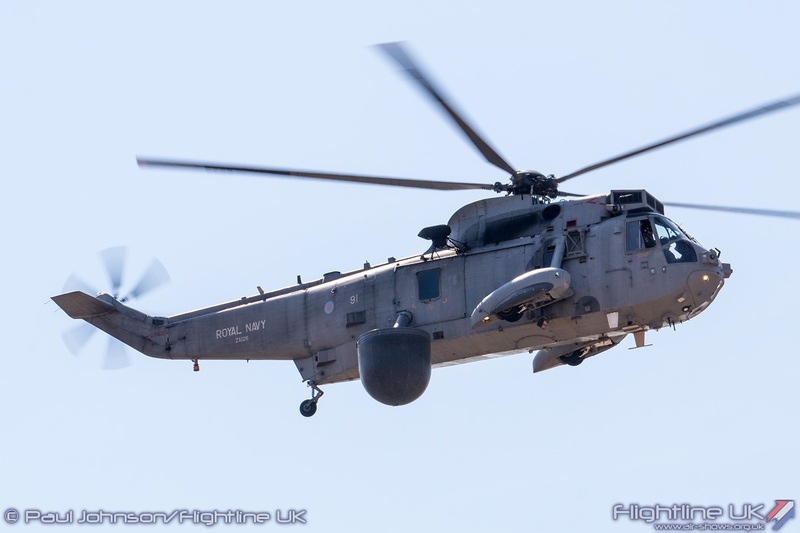 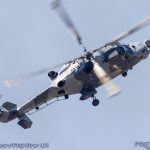 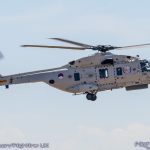 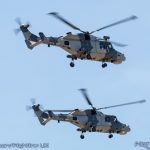 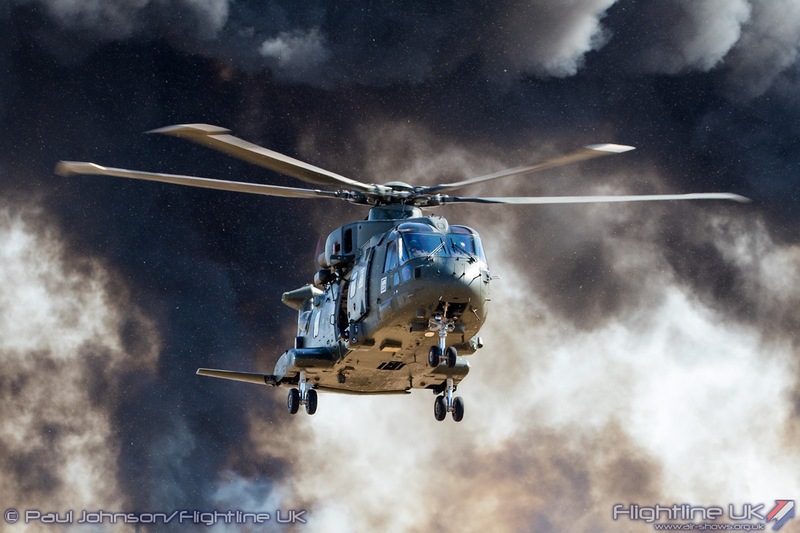 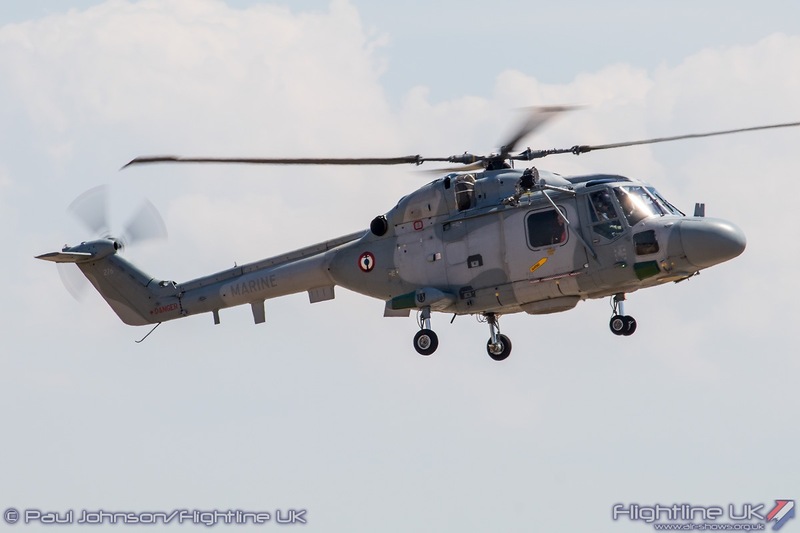 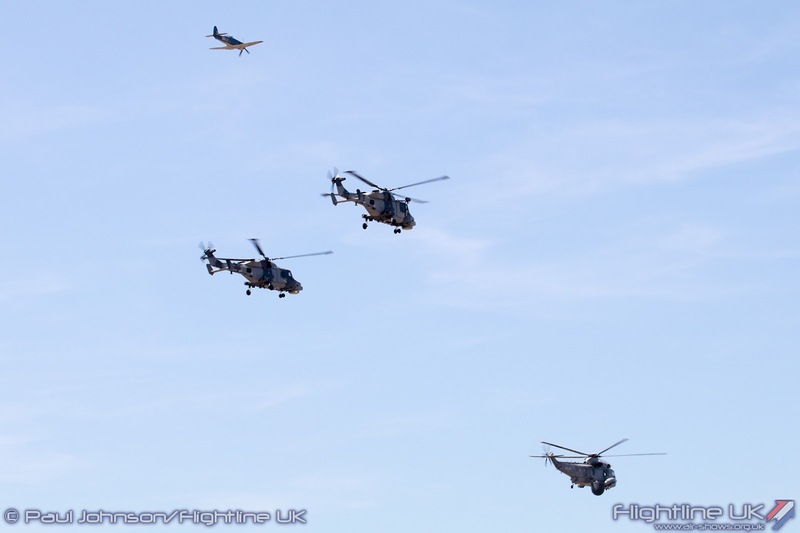 The Netherlands also contributed to an impressive show of military helicopters with a Royal Netherlands Air Force Airbus Helicopters AS532U2 Cougar and Royal Netherlands Navy NH Industries NH90NFH Caiman. 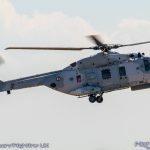 The French Navy also had one of the NH90NFH Caimans at the show alongside the older Aerospatiale/Westland Lynx HAS4. 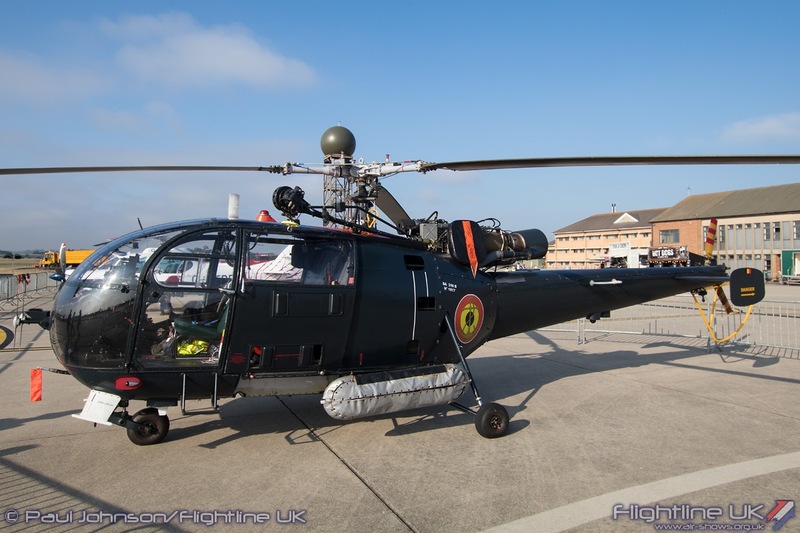 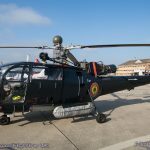 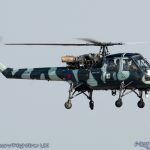 An even older helicopter came from the Belgian Air Force’s Sud-Aviation SA316B Alouette III from the Marine Flight based at Koksijde. 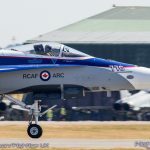 The Royal Canadian Air Force is making a very impressive contribution to UK airshows in 2018 helping to mark the 100th Anniversary of the Royal Air Force. 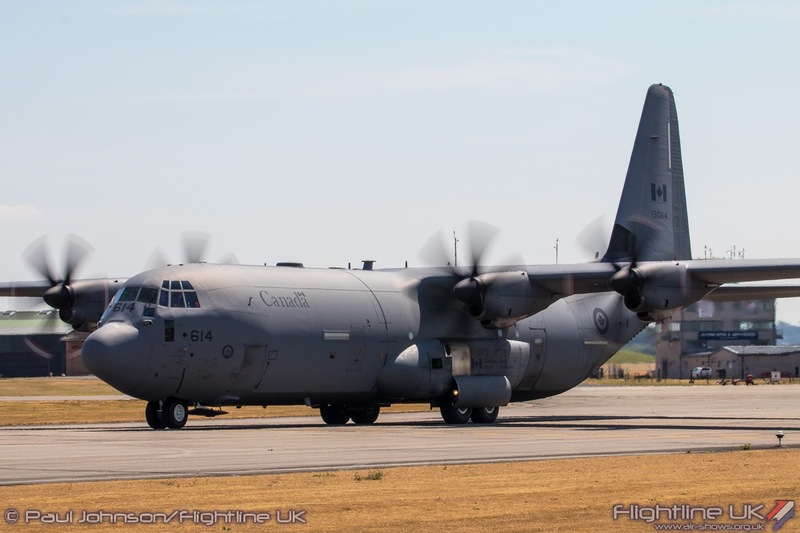 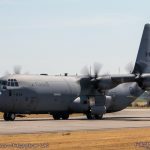 Spearheading their contribution is the CF-18 Demo Team but they were also represented in the static area with the Lockheed Martin CC-130J Hercules II which is supporting the display team. 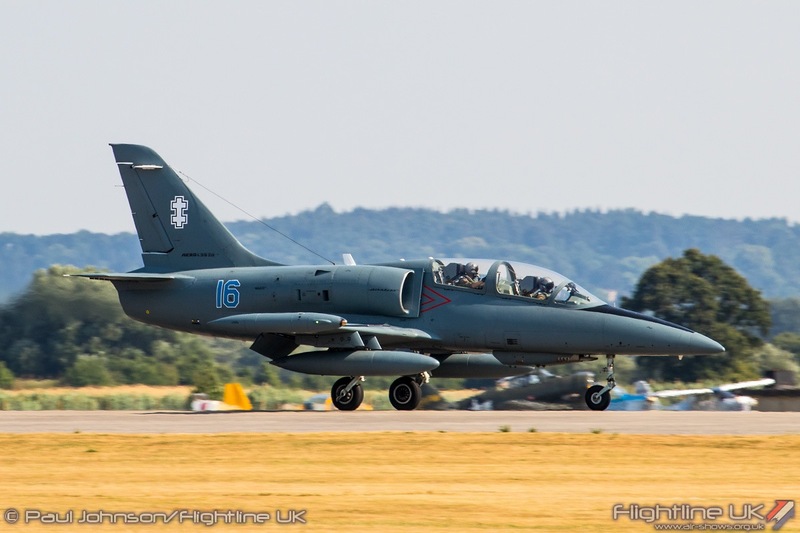 The Lithuanian Air Force was one of the star turns at Air Day and it was their first time at the event. 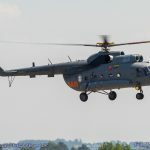 They brought three very different aircraft with an Alenia C-27J Spartan, Mil Mi-8UTV ‘Hip’ and an Aero Vodochody L-39C Albatross. 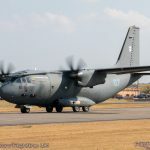 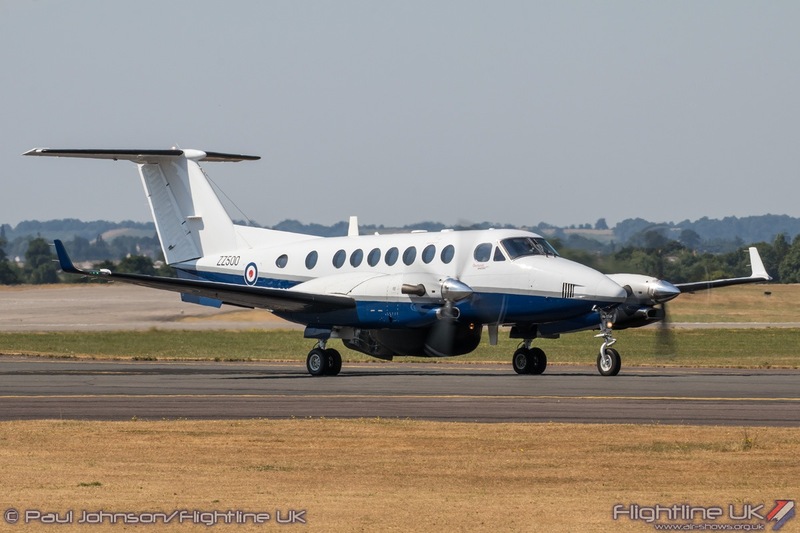 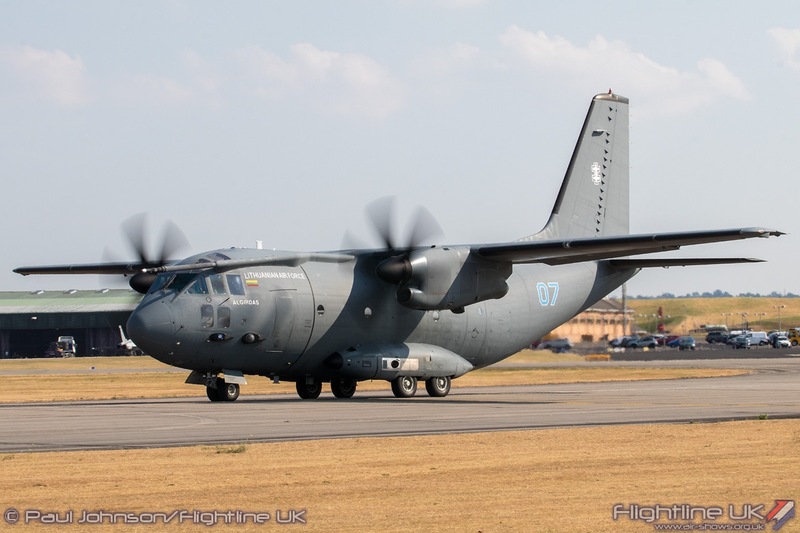 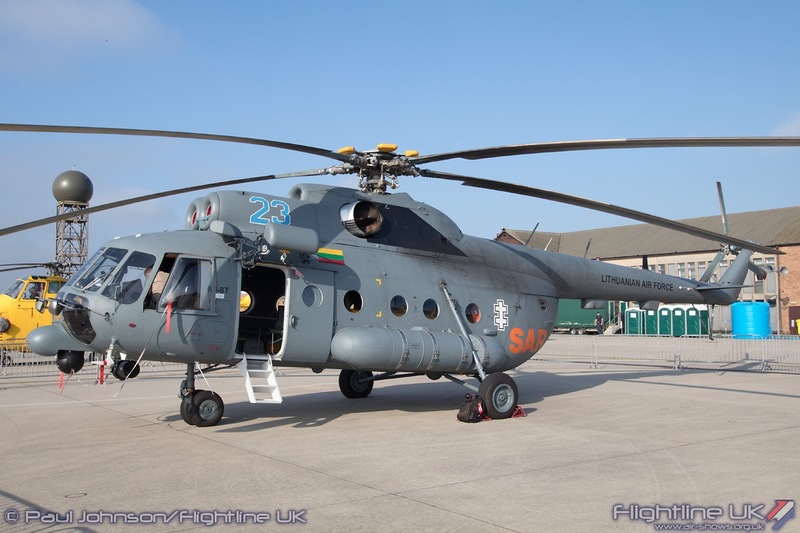 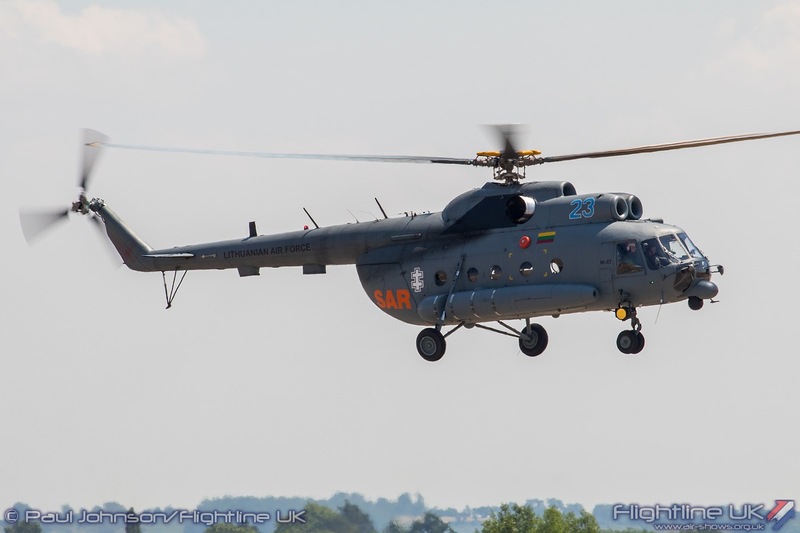 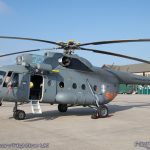 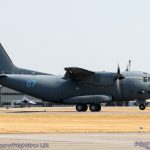 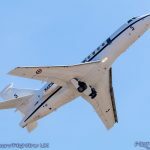 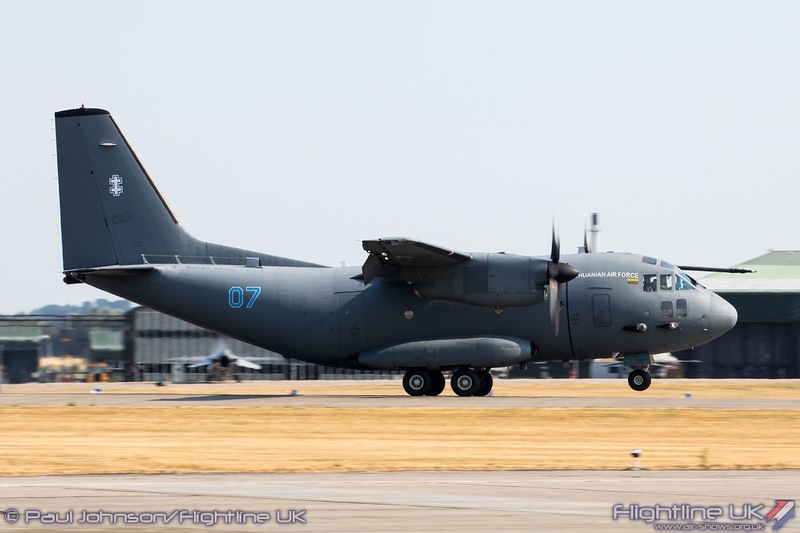 Visits to UK shows by Lithuanian Air Force aircraft are very rare and while both the C-27J and Mi-8 has been seen at RIAT before, the L-39 was making its UK debut at Yeovilton. 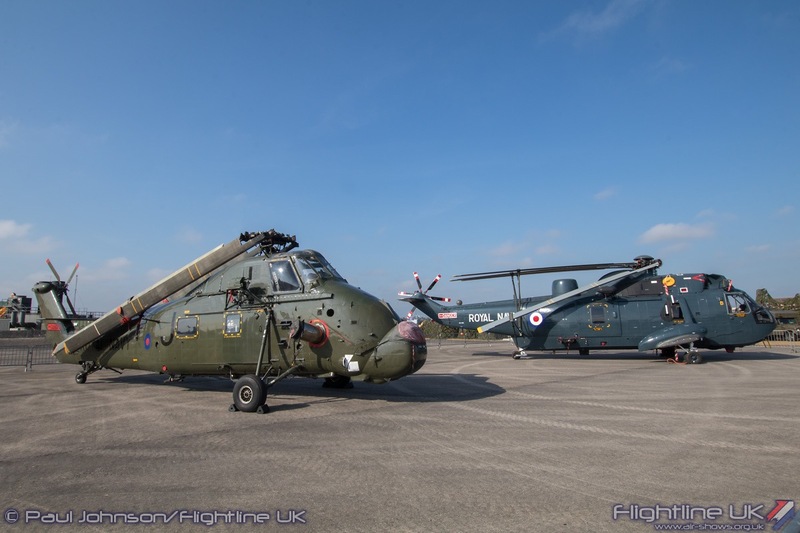 It was a real treat to have some eastern European hardware back in the Yeovilton line-up for such strong support from one of Europe’s smaller air arms. 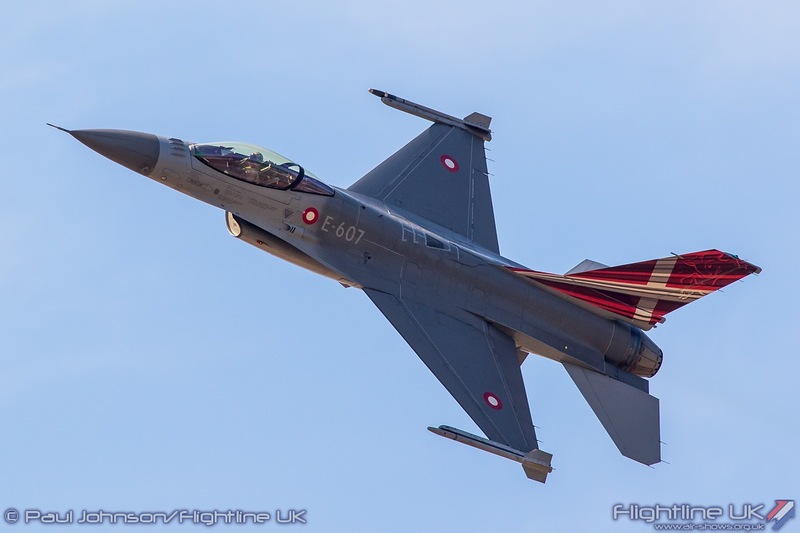 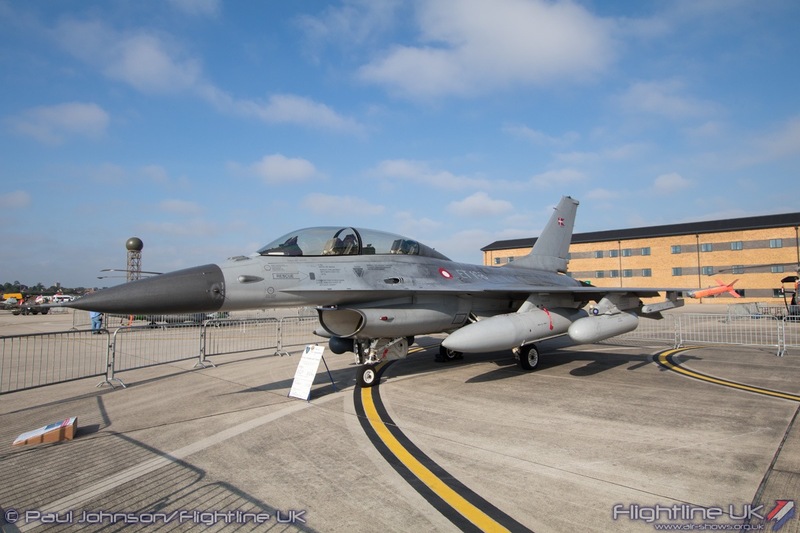 Modern fast jets were somewhat thin on the ground in the static area with just a single example of a Lockheed Martin F-16BM Fighting Falcon from the Royal Danish Air Force on display. 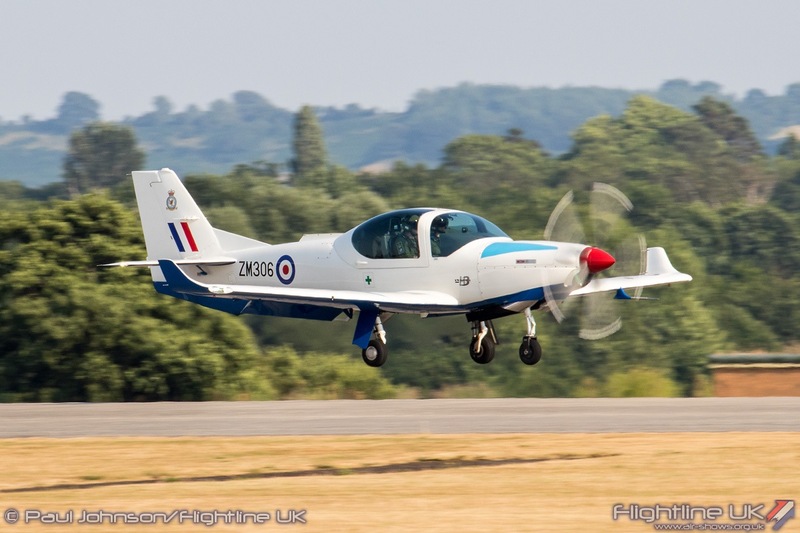 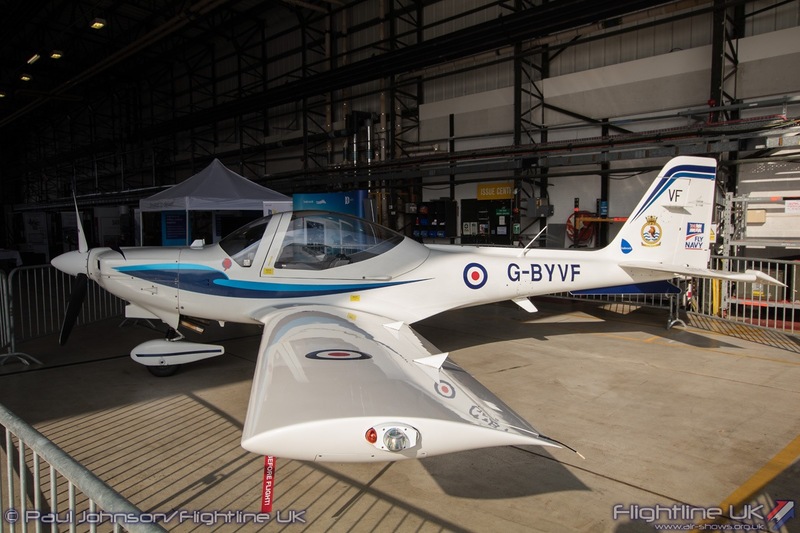 QinetiQ and the Empire Test Pilots School are based not too far away from Yeovilton at Boscombe Down in Wiltshire and are regular supporters of Air Day. 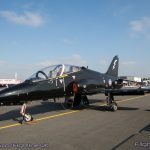 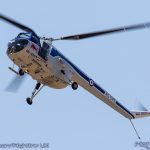 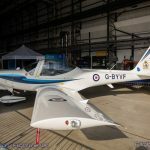 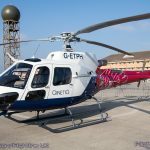 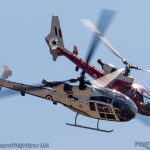 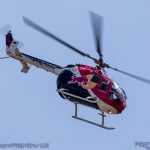 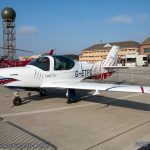 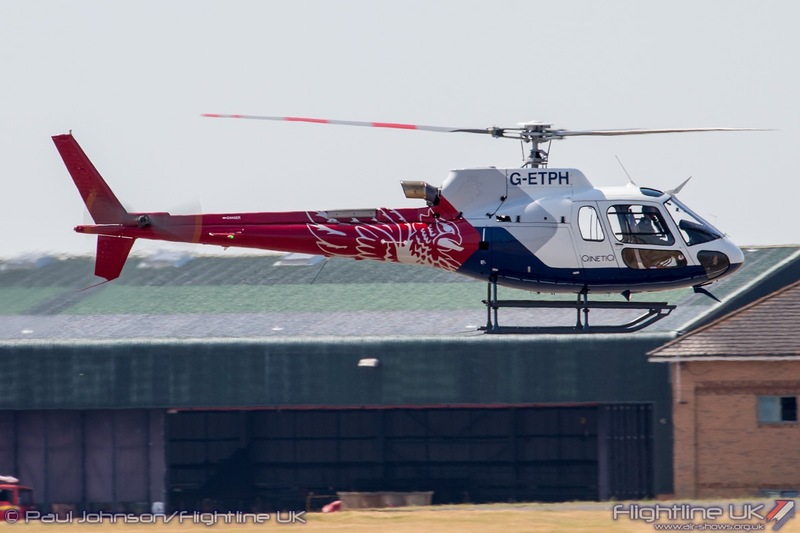 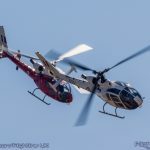 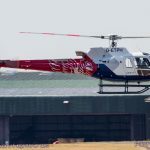 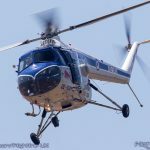 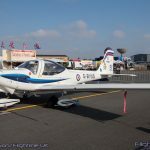 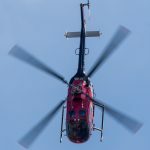 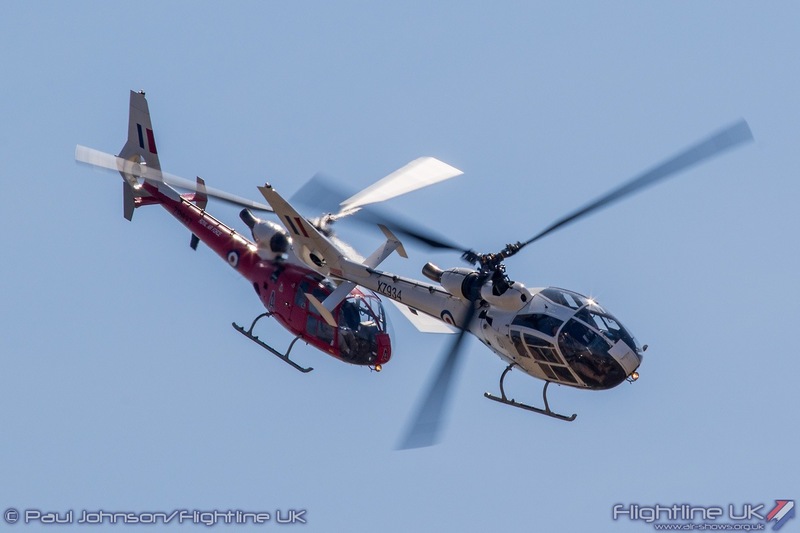 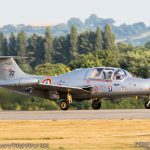 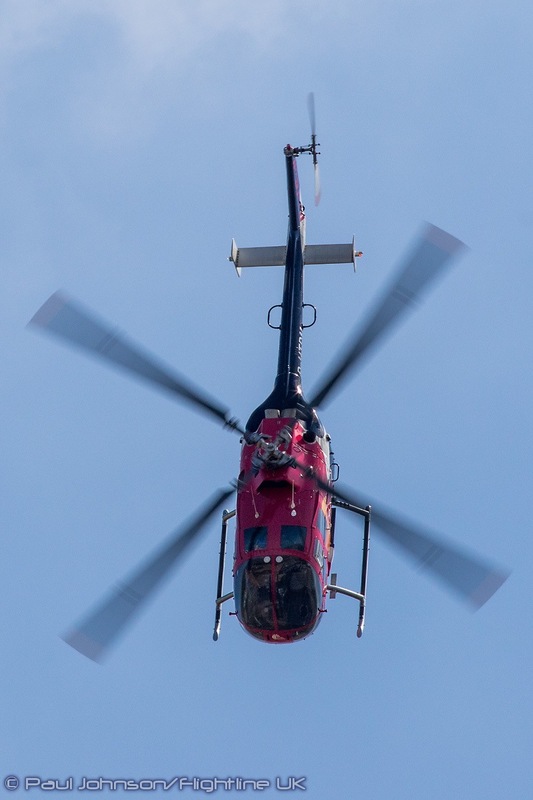 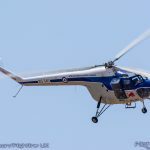 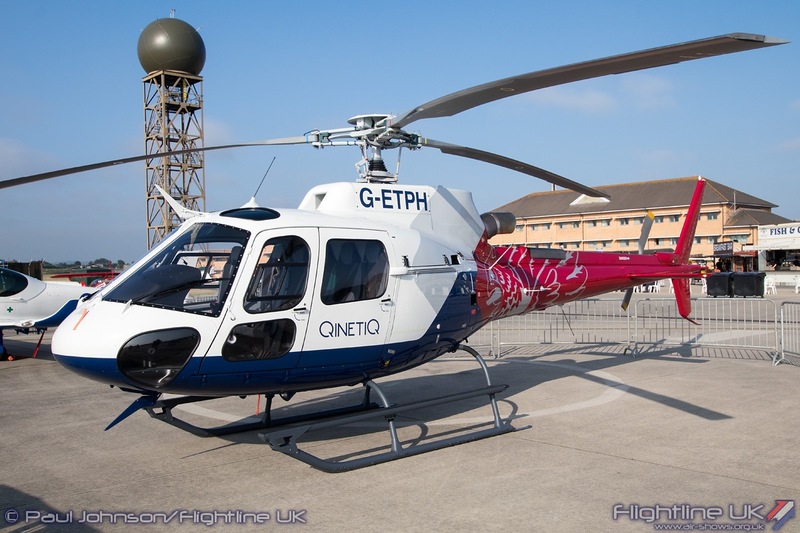 This year they sent two of their newest types both wearing new “corporate” colours with both the Airbus Helicopters H125 and the Grob G120TP making their first visits to Air Day. 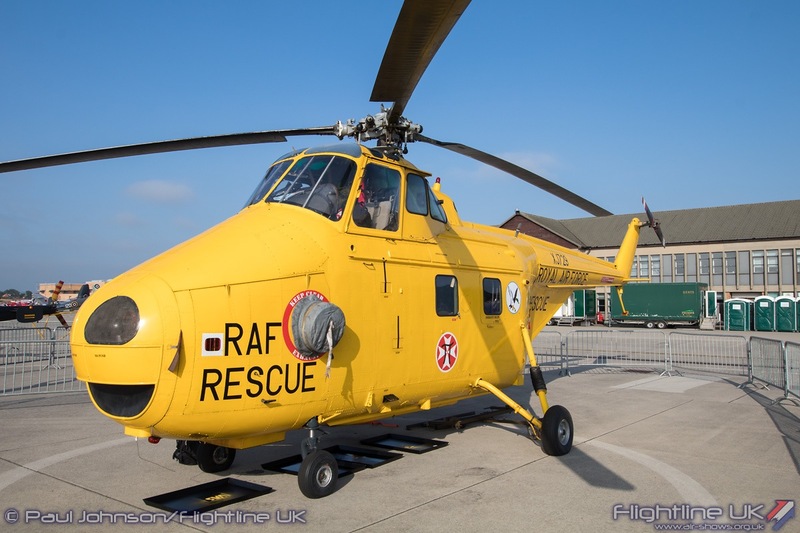 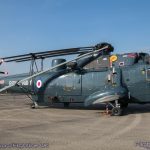 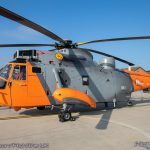 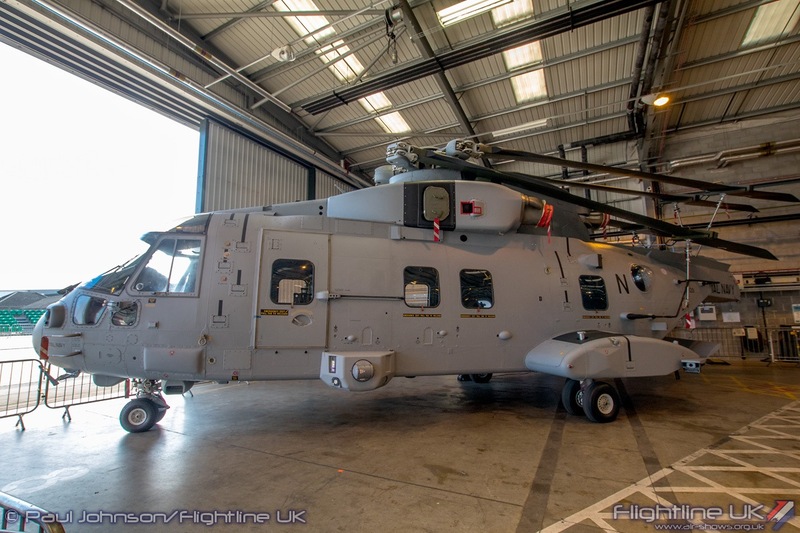 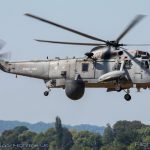 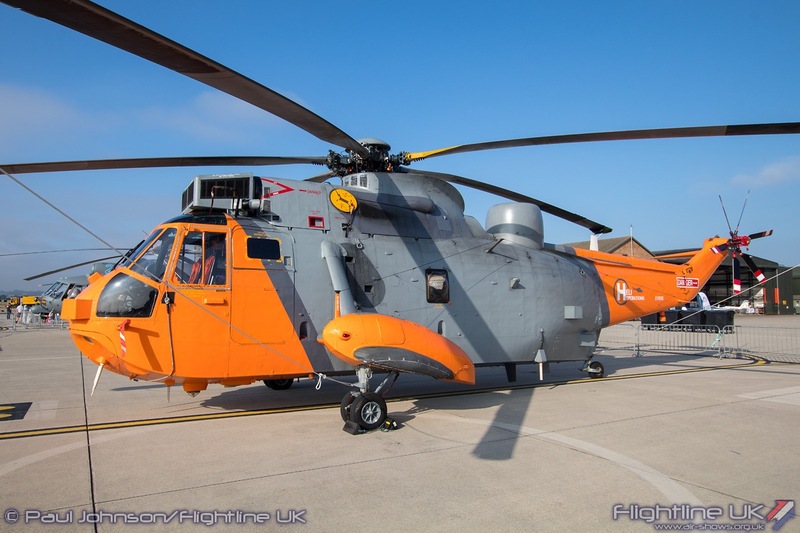 A recent bit of Fleet Air Arm history also returned to Yeovilton with a Heli Operations Westland Sea King HU5 making its first public airshow appearance in the static display. 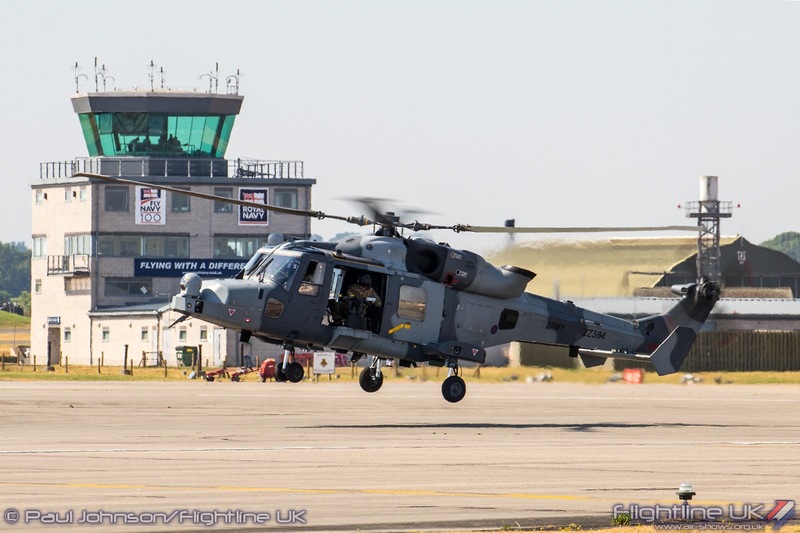 Heli Operations are using a small fleet of Sea Kings recently retired from Royal Navy service to train Search and Rescue techniques to German Navy Sea King crews out of Portland. 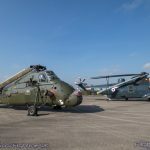 As always, Royal Navy types were on show around the showground and in the hangarswith an impressive line-up which included examples of the Leonardo AW159 Wildcat HMA2, Leonardo Merlin HM2, Merlin HC3 and Merlin HC4, Beechcraft Avenger T1, BAE Systems Hawk T1 and Grob Tutor T1. 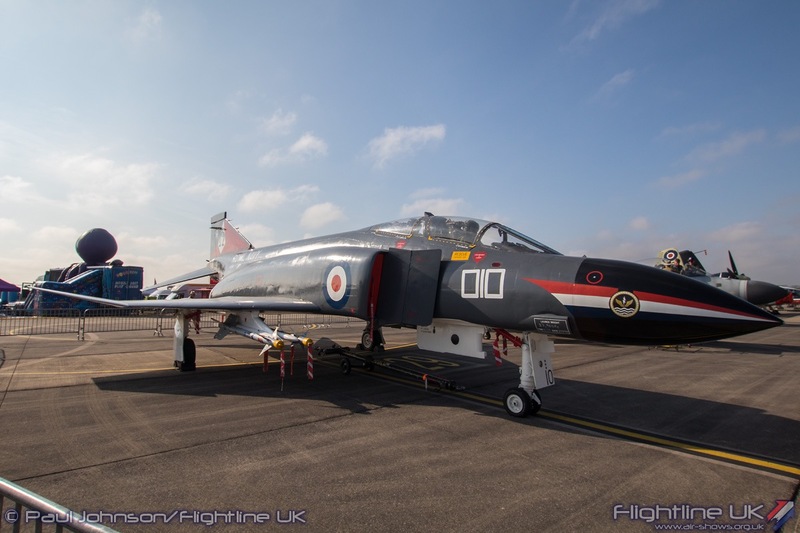 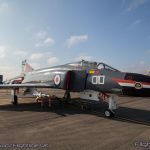 The Royal Navy’s proud heritage was also included in the static park with the based McDonnell Douglas F-4K Phantom FG1 joined by the BAE Systems Sea Harrier FA2 plus the Fairey Swordfish II from the Royal Navy Historic Flight. 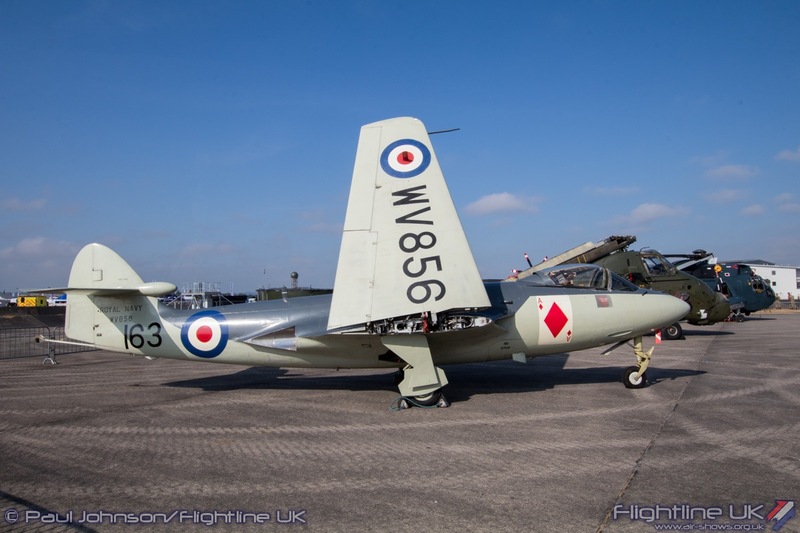 The co-located Fleet Air Arm Museum also added to the heritage line-up with their Hawker Sea Hawk FB6, Westland Sea King HAS5, Westland Wessex HU5 and Westland Wasp HAS1. 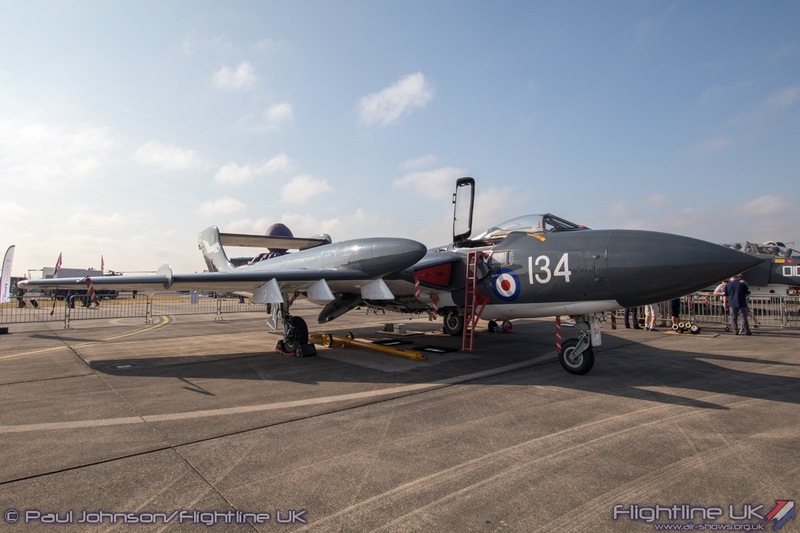 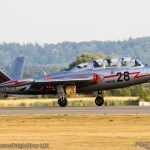 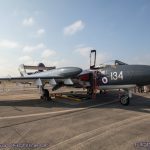 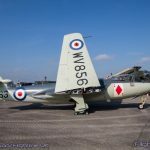 The NavyWings Charity which supports a number of different historic aircraft associated with the Fleet Air Arm also brought together an impressive collection of historic types headed up by their de Havilland Sea Vixen FAW2. 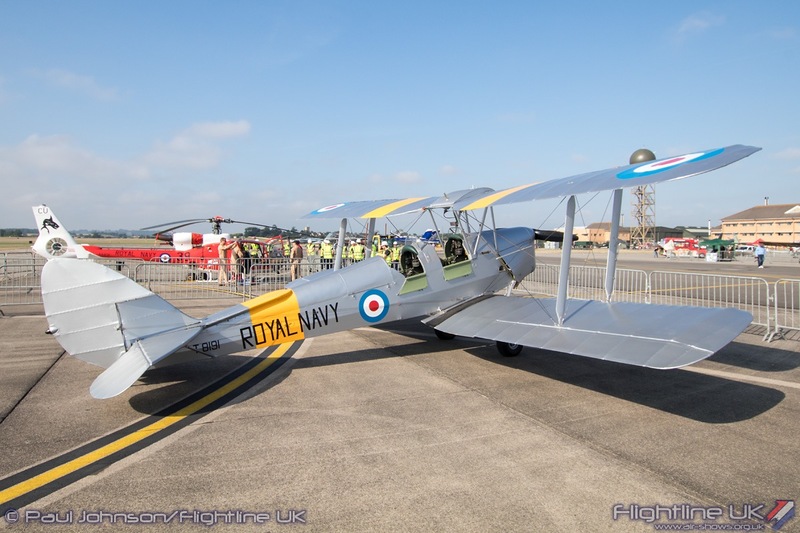 These included David Bremner’s Bristol Scout, Terry Martin’s Westland Wasp HAS1, a de Havilland DH82a Tiger Moth and the Gazelle Squadron’s Westland Gazelle HT2. 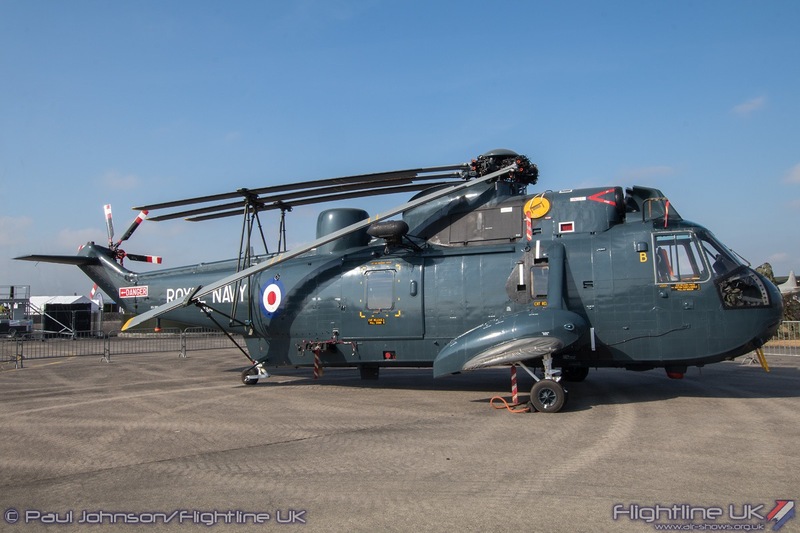 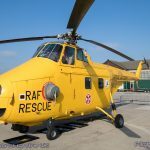 A further example of Westland’s heritage also returned to Yeovilton in the form of LiftWest’s Westland Whirlwind HAR10. 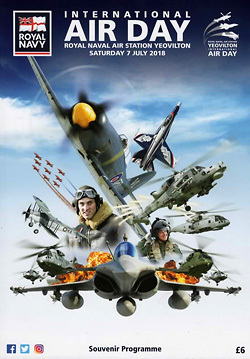 Much of the historic line-up was themed around army co-operation types. 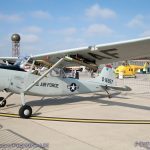 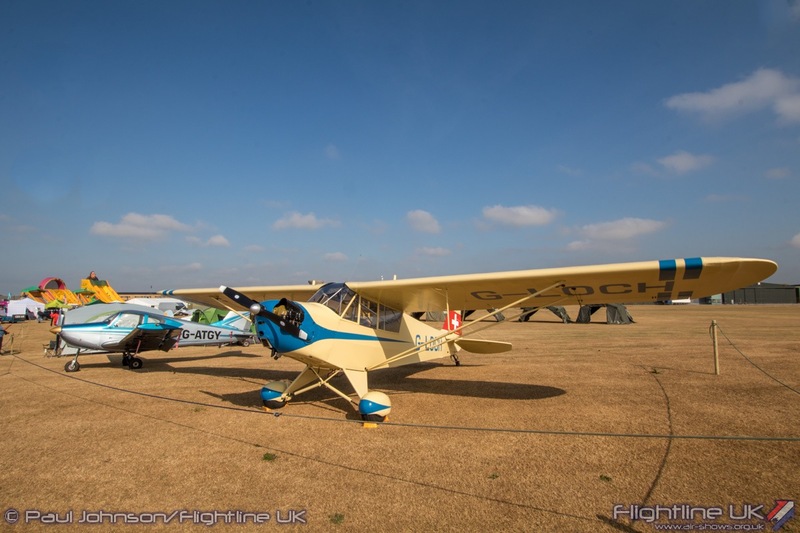 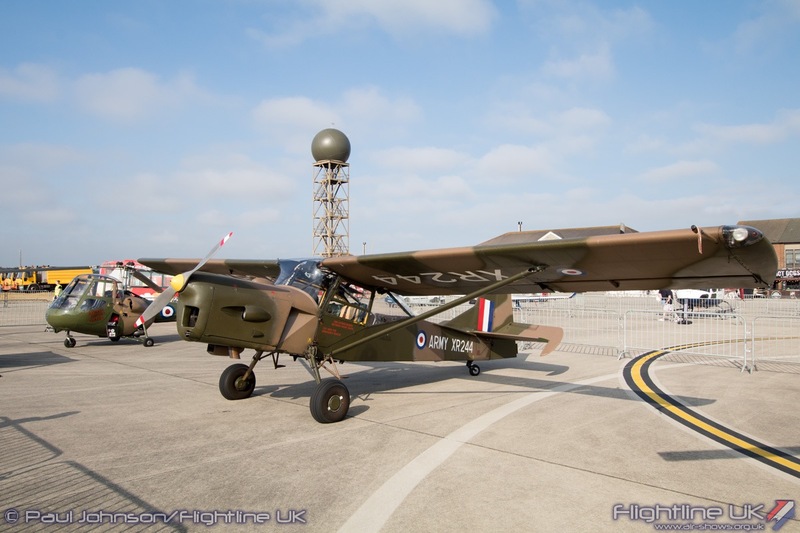 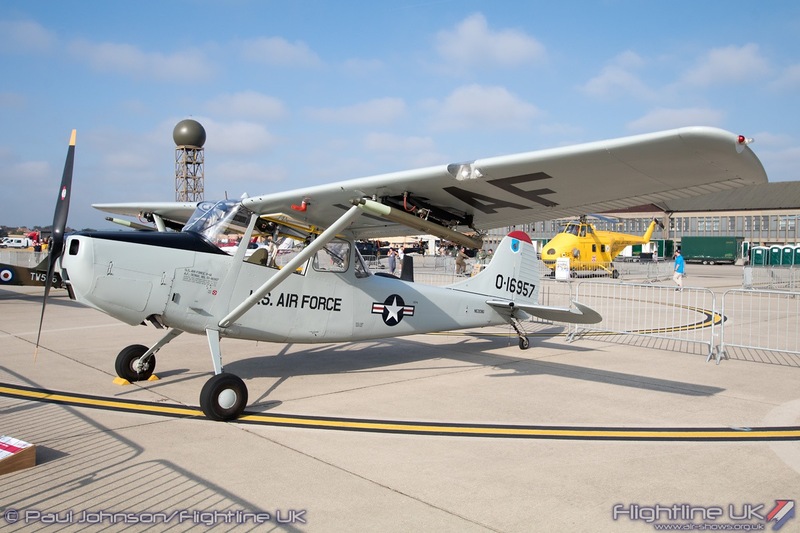 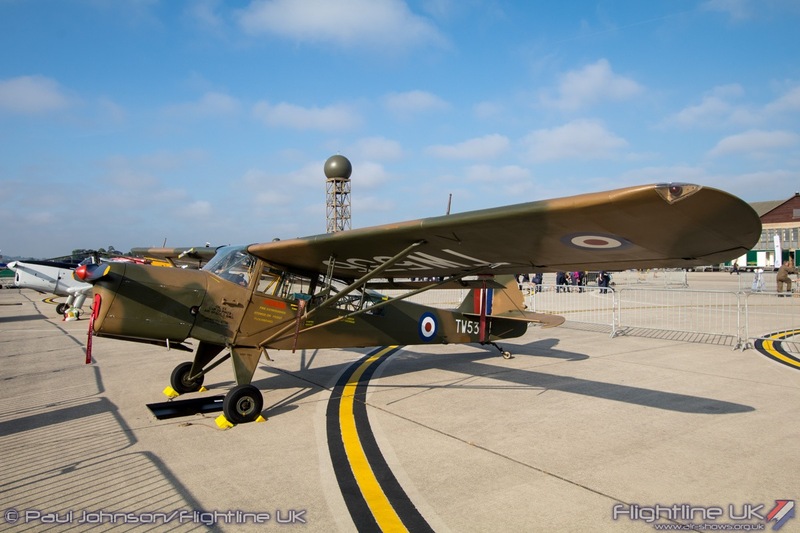 Taylorcraft Auster AOP6 and AOP9s from Kevin Hale and Peter Gill were joined by a Cessna O-1 Bird Dog to represent some of the final fixed wing types used in the Air Observation Post role. 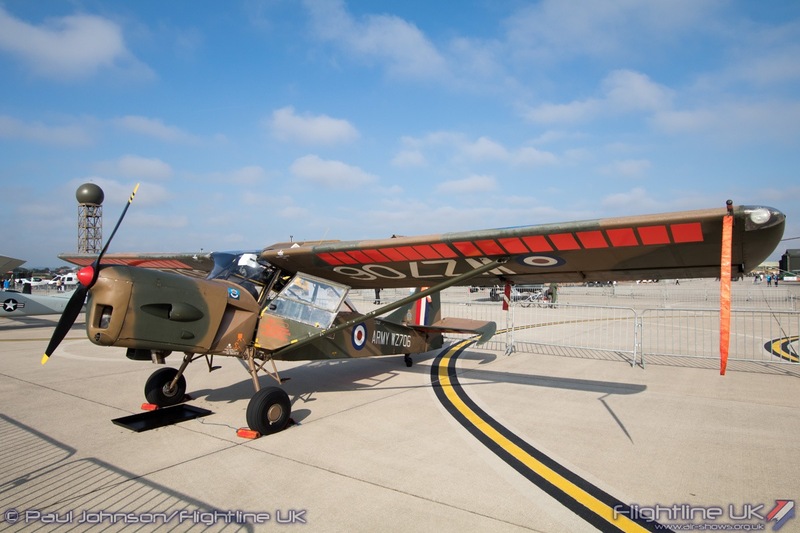 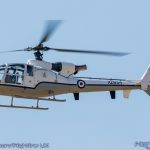 The Army Historic Flight Trust displayed their rotary successors with their SARO Skeeter AOP12 and Westland Scout AH1 making the short trip (by road in the case of the Skeeter) from their base at Middle Wallop. 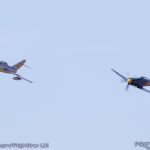 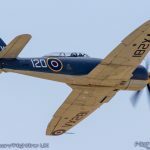 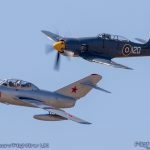 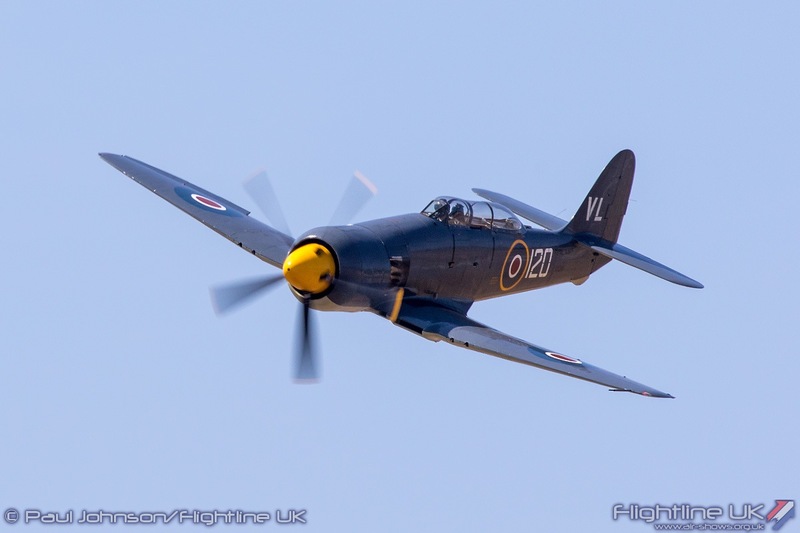 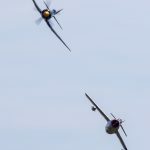 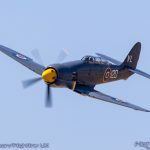 The flying display was opened with a naval ‘balbo’ which was led by Westland Sea King ASaC7 joined by a pair of Leonardo Wildcat HMA2s and the Fly Navy Heritage Trust’s Hawker Sea Fury T20 for a memorable opening to Air Day. 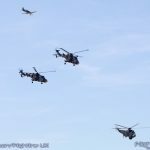 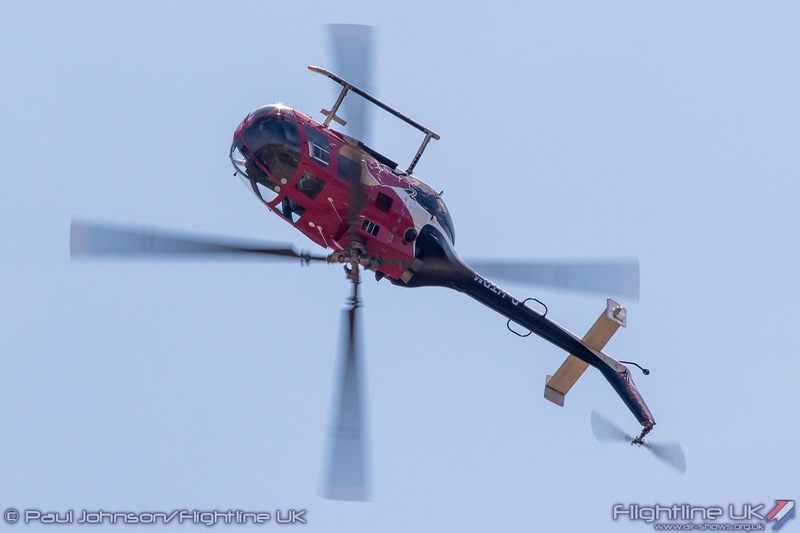 Following the flypast, the Sea King gave what was the final ever in-service display by a Sea King and the crew from RNAS Culdrose put the ‘bagger’ through a very spirited routine for a very fitting send-off. 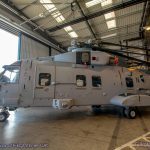 The type will retire in September and its replacement is the Merlin HM2 equipped with the “CrowsNest” Airborne Early Warning system. 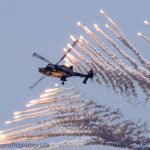 A solo Wildcat HMA2 gave an impressive role demonstration of its capabilities which was accompanied by some spectacular pyrotechnics. 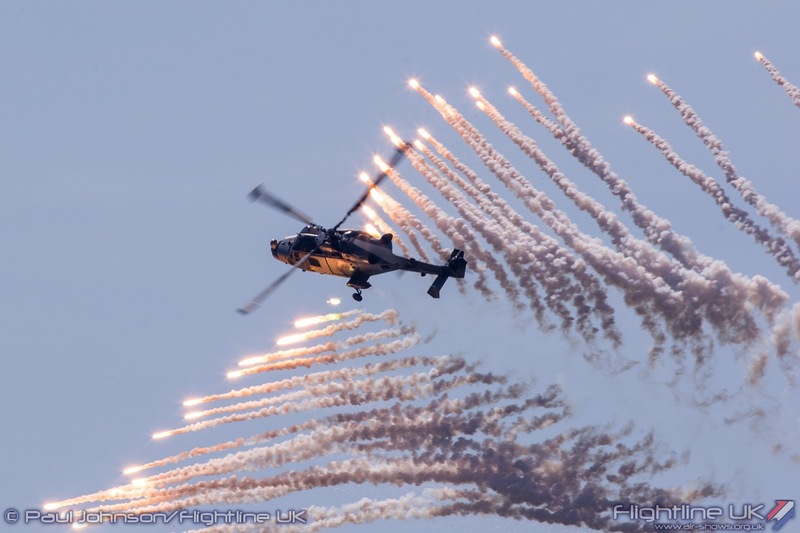 The display included close air support and the evasion of surface-to-air missiles through the use of flares! 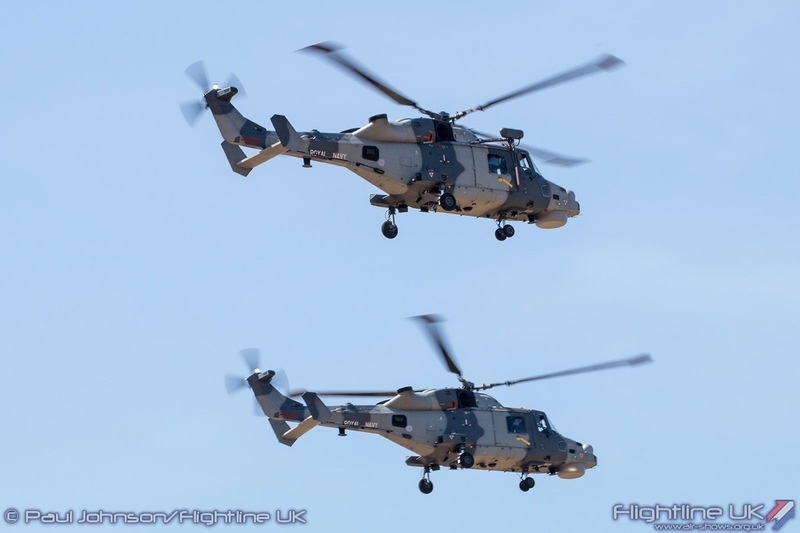 The Wildcat role demo also demonstrated how the Royal Navy works will allied as forces as it was captained by an exchange officer from the Royal Australian Navy, Lt Matt Hudson. 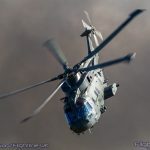 By far one of the best loved elements of previous Air Days has been the Commando Assault finale. 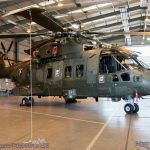 Sadly, the modernisation of the Commando Helicopter Force with the remanufacture of Merlin HC3 to HC4 standards has meant it has become more difficult to support and in 2017 was missing for the Air Day programme. 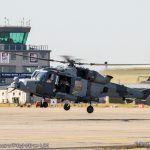 Happily it was back for 2018, though in a smaller form with two Leonardo Merlin HC3is joined by a pair of Wildcat AH1s from 847NAS and two BAE Systems Hawk T1s from 736NAS. 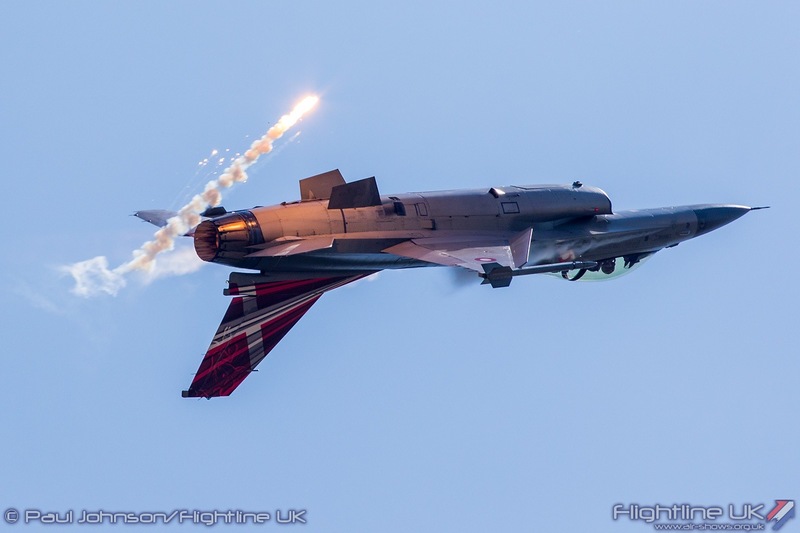 Though slimmed down, it was still an impressive and engaging display involving ground elements as well as the aircraft plus the traditional pyrotechnics. 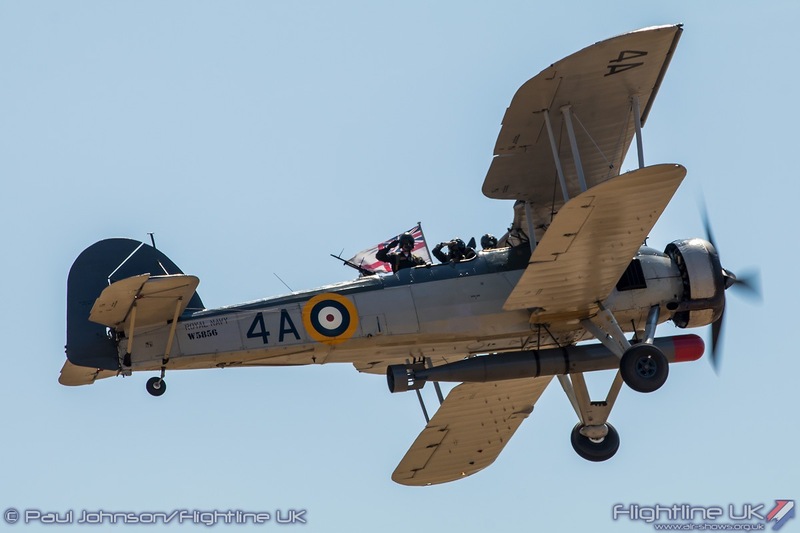 Naval Heritage is always an important part of an Air Day flying display so it was great to see the Royal Navy Historic Flight back with their own Fairey Swordfish I and the Fly Navy Heritage Trust’s Hawker Sea Fury T20. 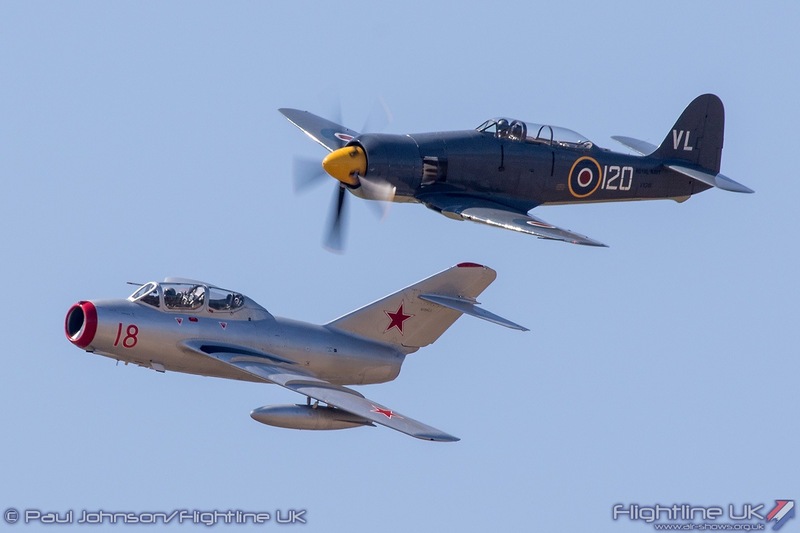 The latter appeared alongside the Norwegian Air Force Historical Squadron’s Mikoyan-Gurevich MiG-15UTi to mark the famous 1952 encounter during the Korean War when Commander Peter ‘Hoagy’ Carmichael alongside Sub-Lieutenant Carl Haines, Sub-Lieutenant Peter Davis and Sub-Lieutenant Brian Ellis downed a Communist MiG and damaged two or three more. 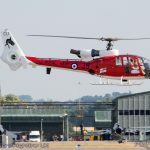 More recent Fleet Air Arm and local history was also marked by a pair of Westland Gazelle HT3s from the Gazelle Squadron. 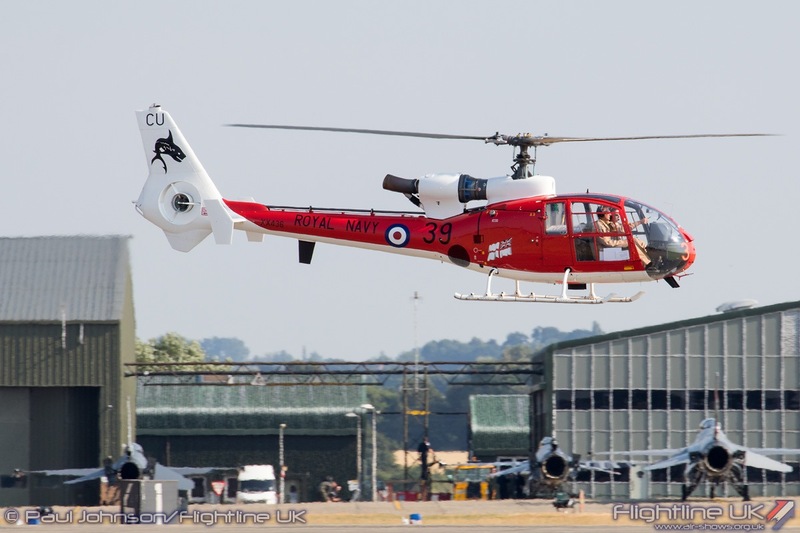 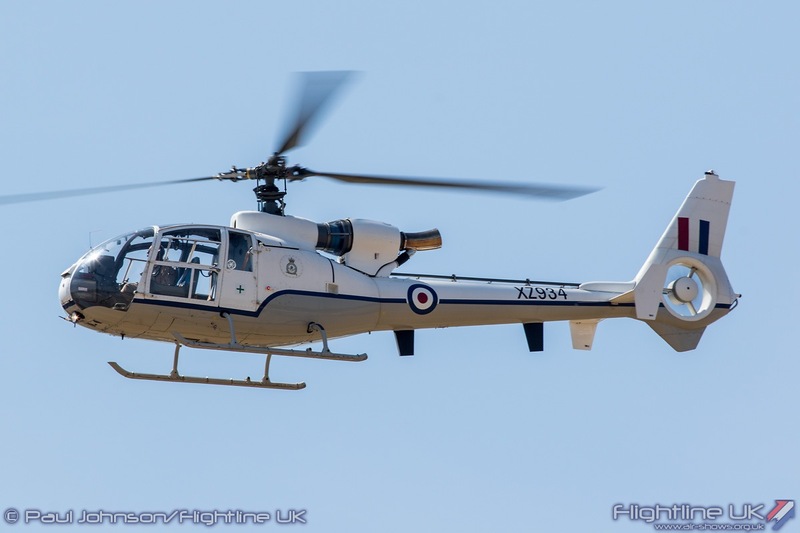 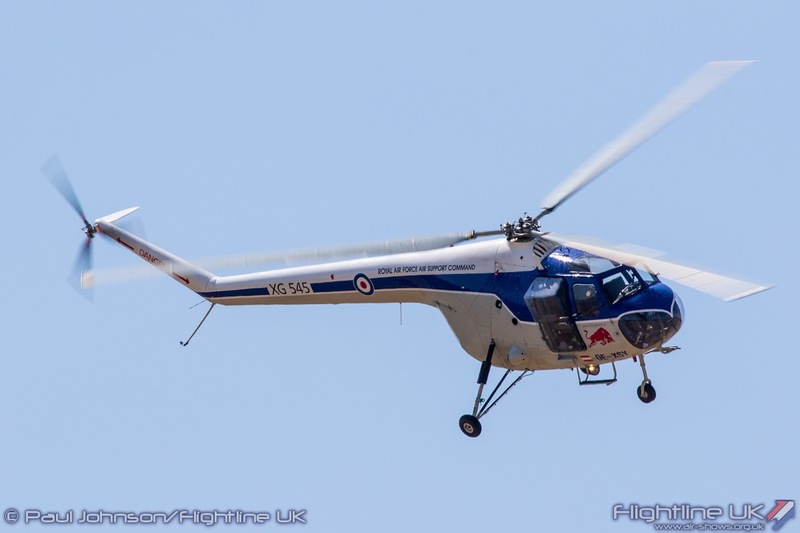 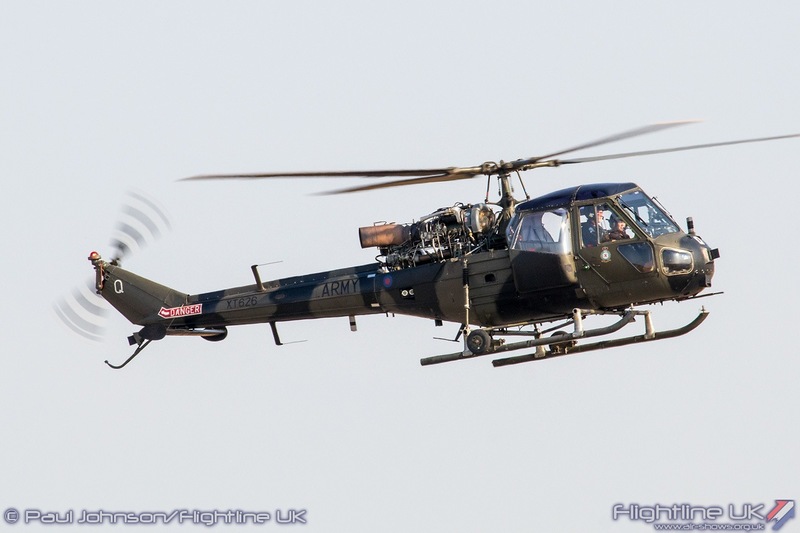 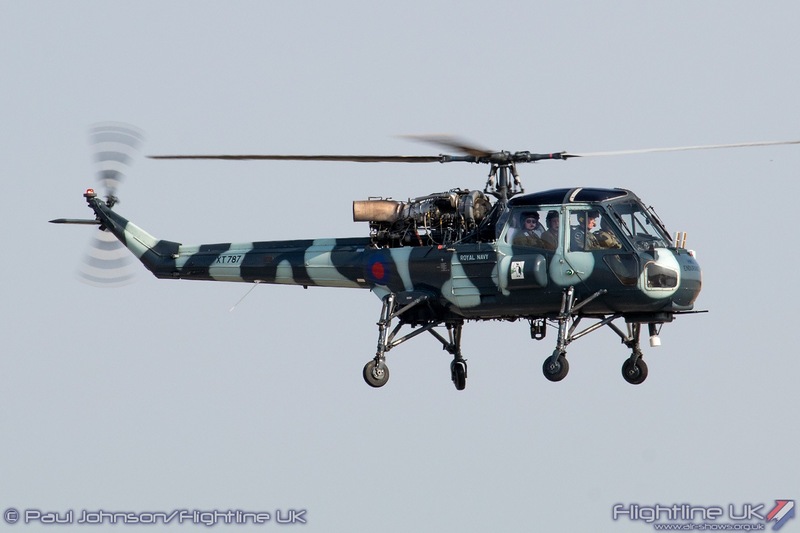 Westland built the Gazelle for the UK armed forces and the Royal Navy used the type as a training helicopter. 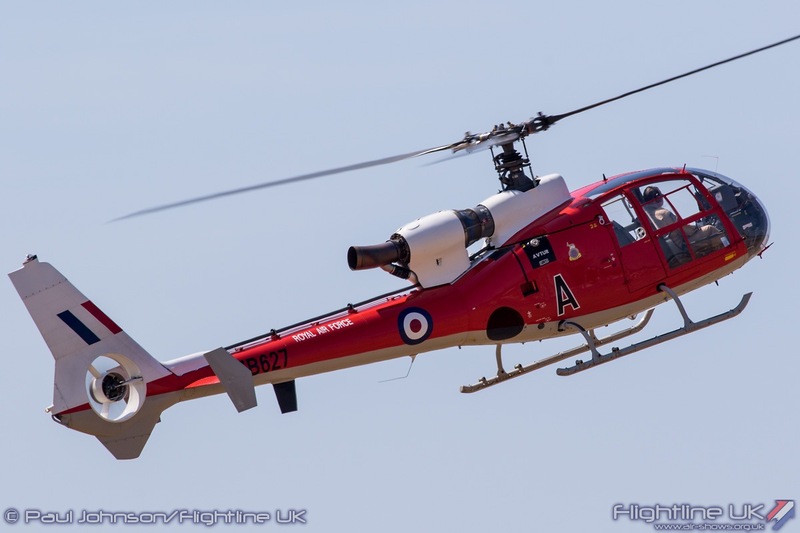 While in service with the Royal Navy, the Gazelle was the mount of a number of famous display teams including Pussers Pair and The Sharks. 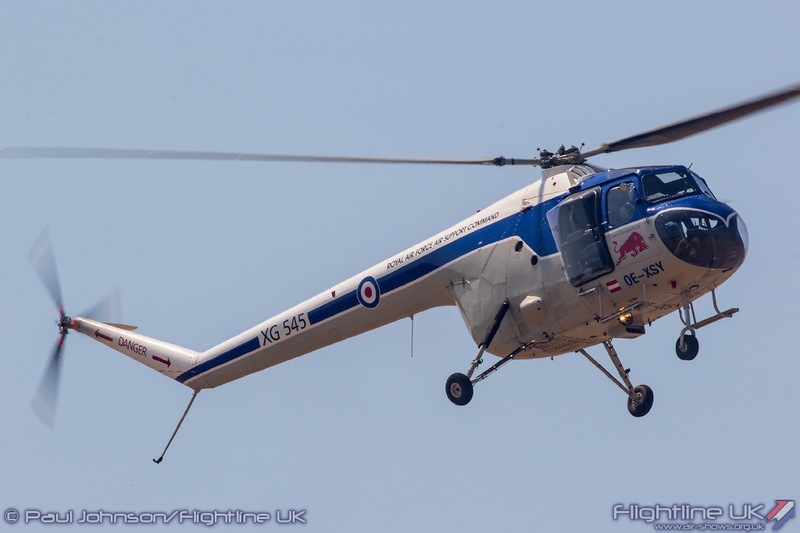 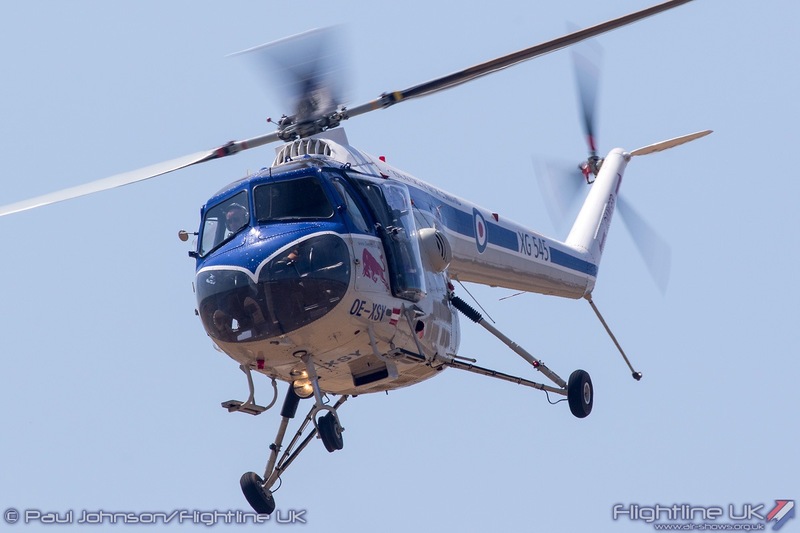 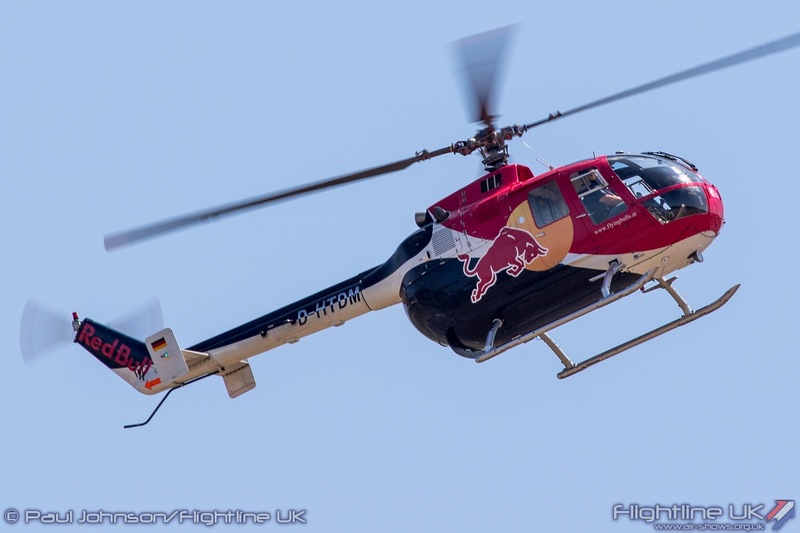 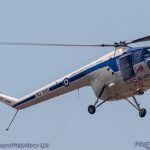 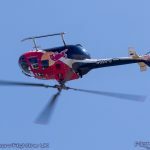 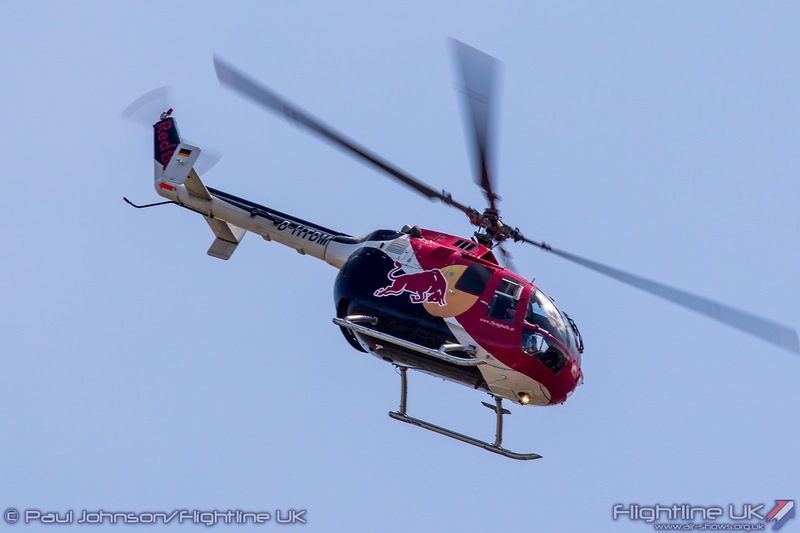 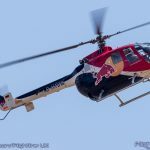 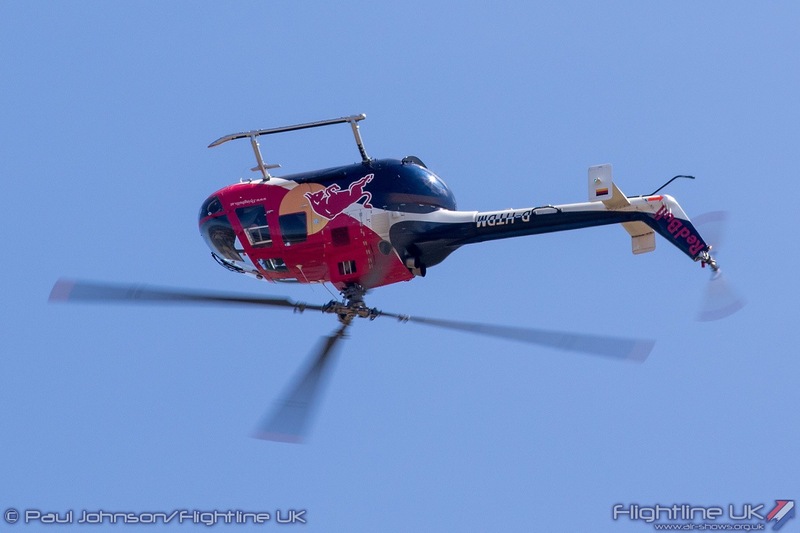 Another colourful helicopter was the MBB Bo-105C of the Flying Bulls. 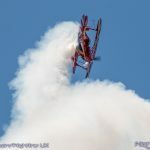 Siegfried “Blacky” Schwarz gave an incredible aerobatic routine in the Bo-105C with loops, rolls and some incredible end-over-end tumbles. 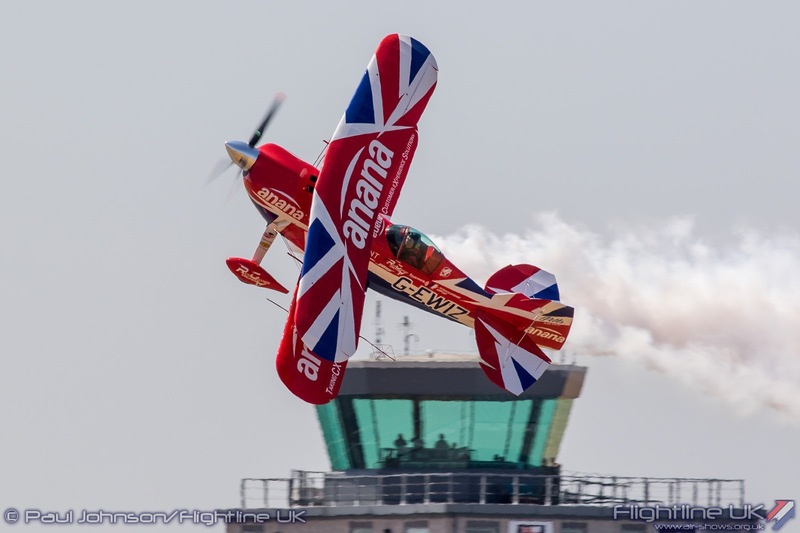 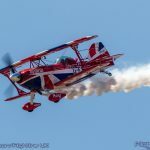 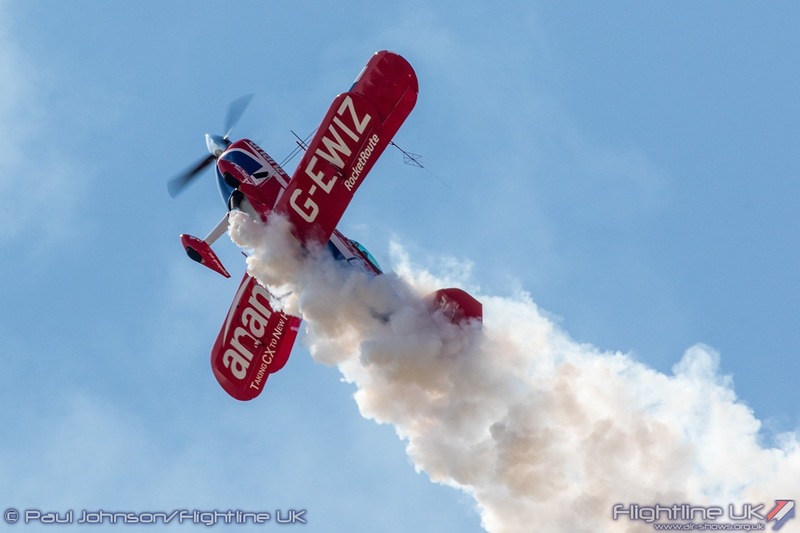 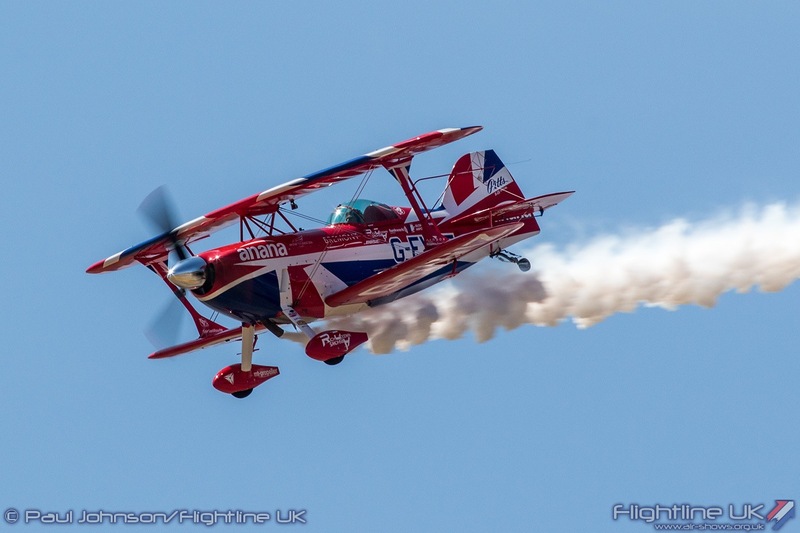 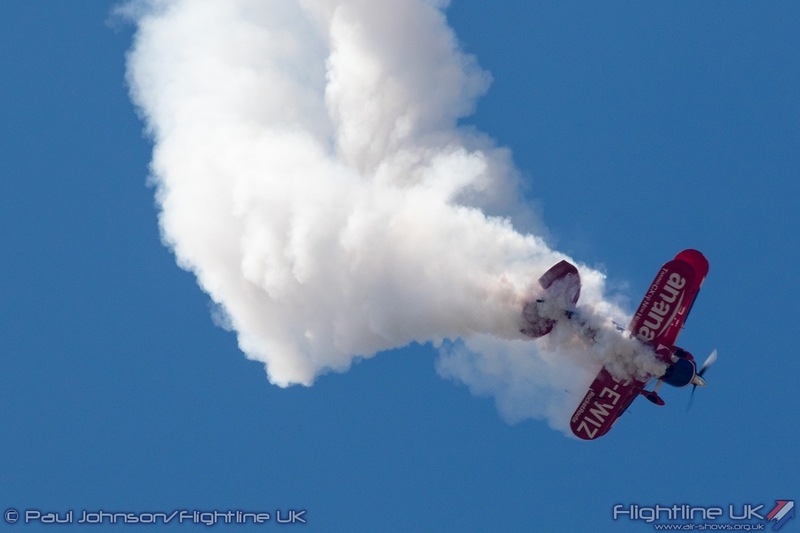 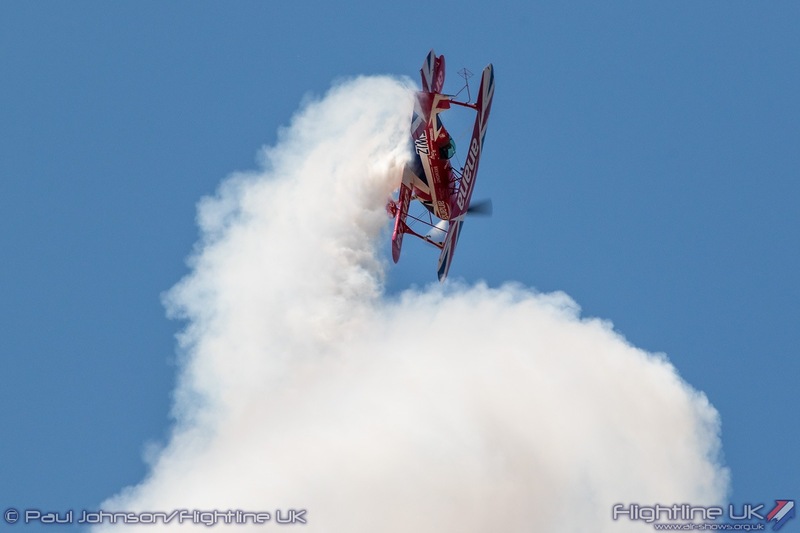 The high-octane aerobatics theme was continued in the fixed wing world by Rich Goodwin and his heavily modified Pitts S-2S Special which is a firm Yeovilton favourite. 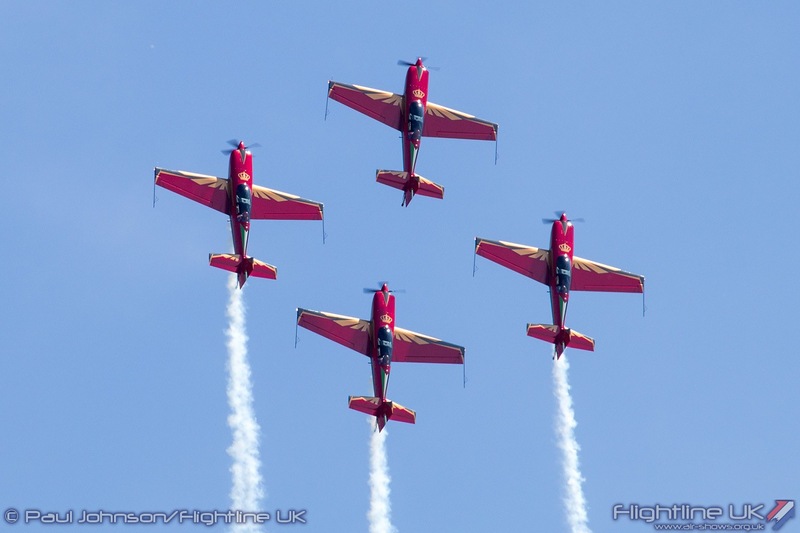 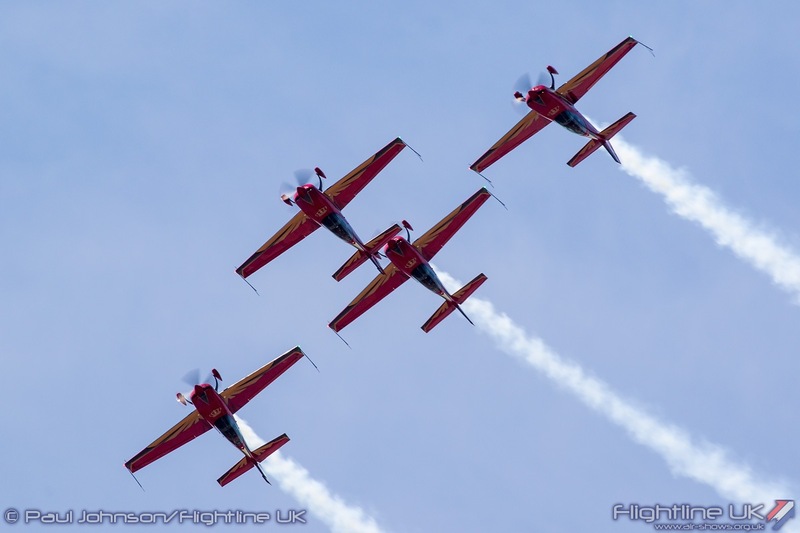 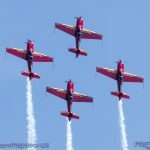 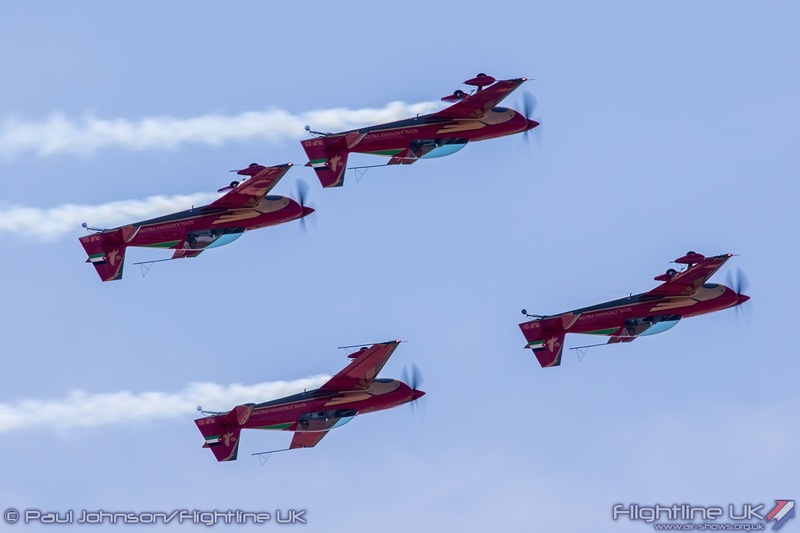 Formation aerobatics were also on the menu with the Royal Jordanian Falcons opening their European tour at Air Day. 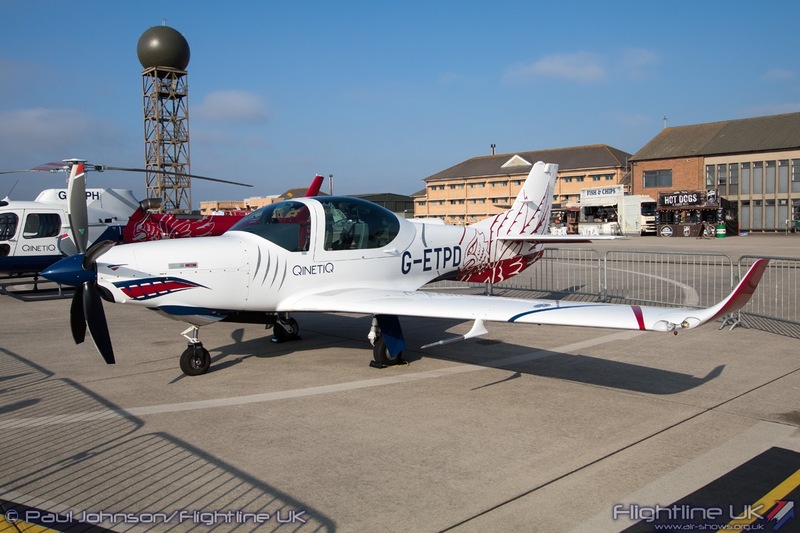 The team have recently transitioned to the more powerful Extra 330LX aircraft which appear in a brand new ‘falcon’ inspired colour scheme. 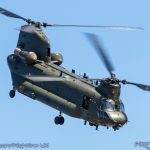 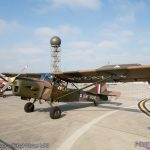 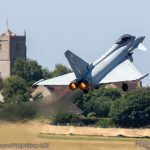 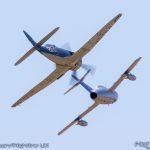 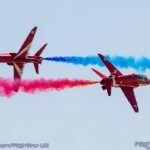 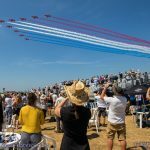 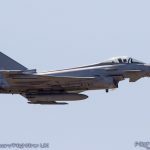 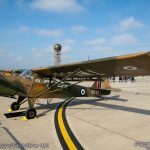 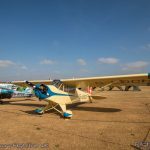 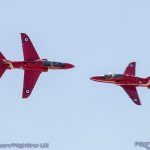 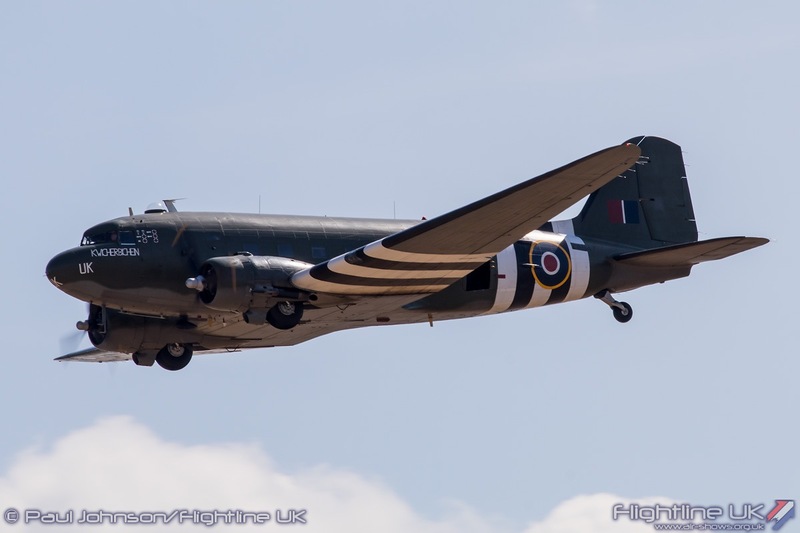 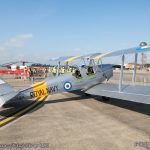 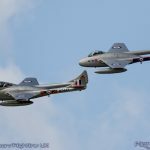 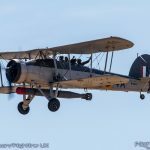 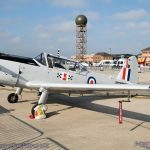 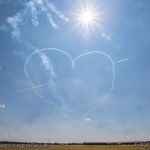 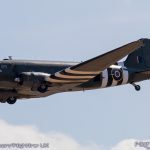 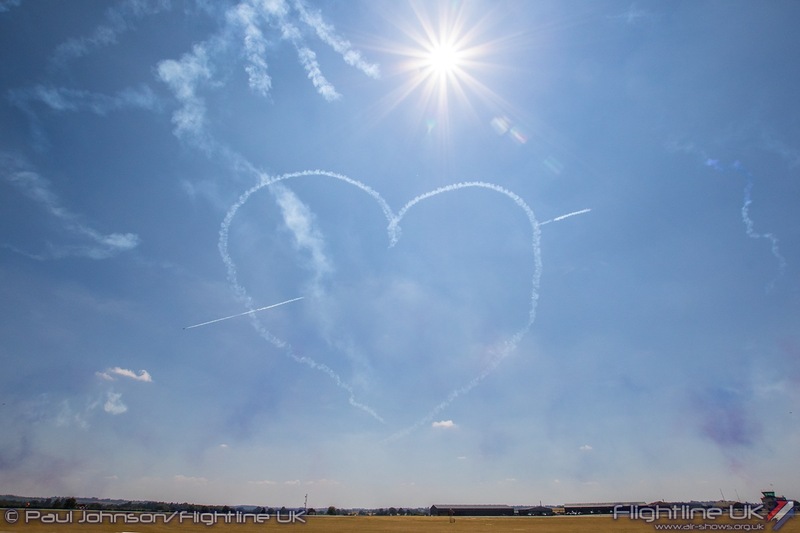 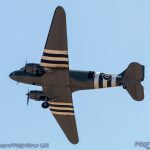 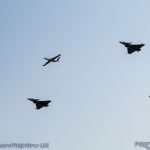 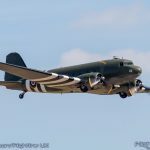 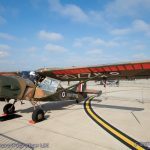 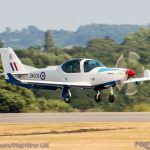 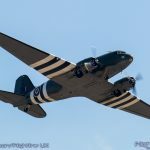 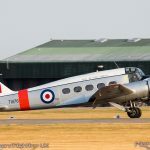 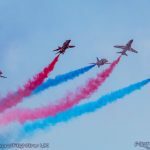 Air Day’s flying display paid tribute to the 100th Anniversary of the Royal Air Force with some snapshots of the services history.. 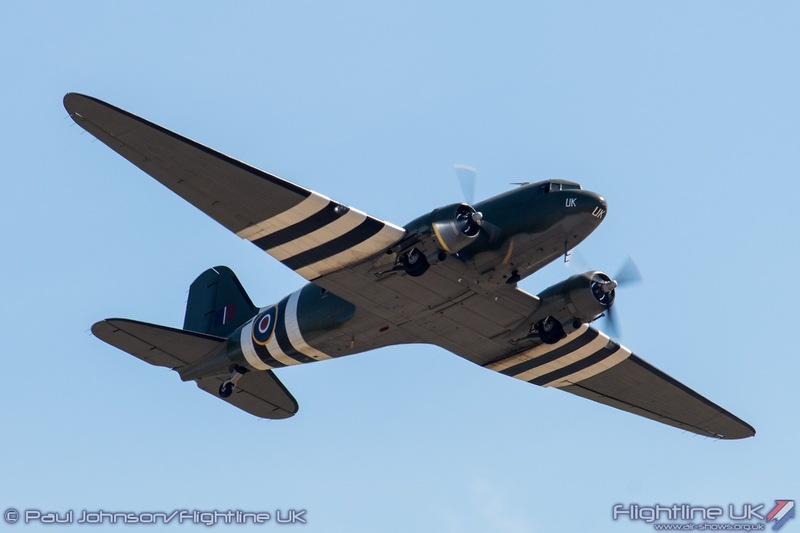 The first came from the Cold War and was one of the stars of Air Day, the Flying Bulls Bristol 171 Sycamore. 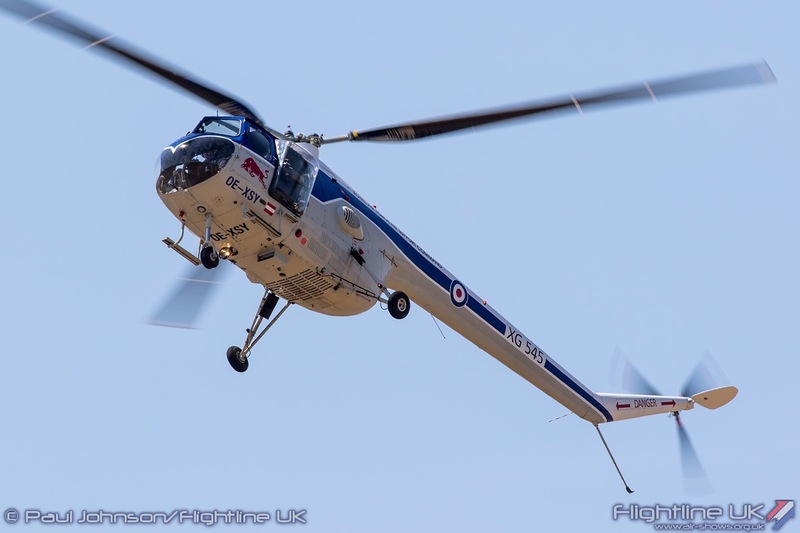 This particular machine is an ex-German Navy example and is the only Sycamore left in airworthy condition and Siegfried “Blacky” Schwarz put on a gentle routine of hovering and tight turns to show off the vintage helicopter. 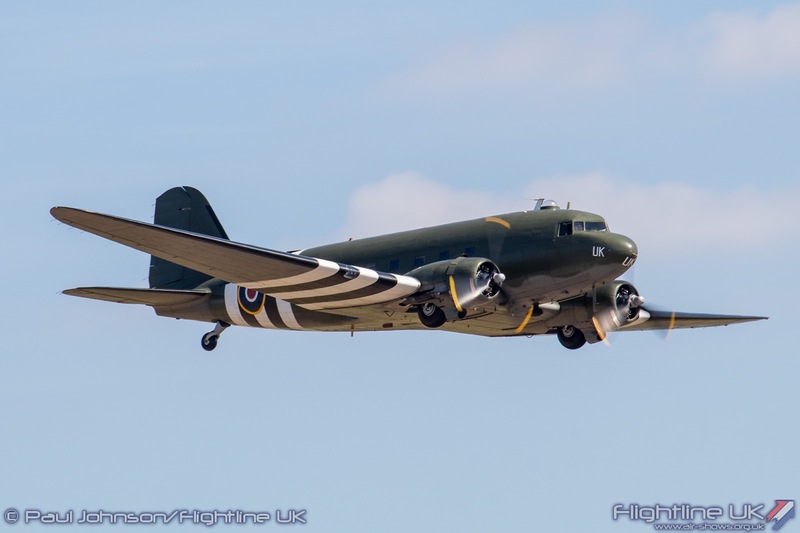 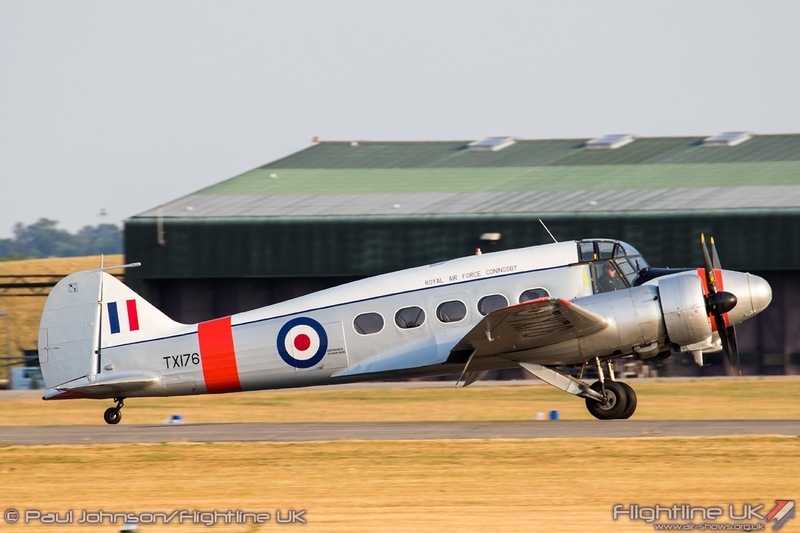 The Battle of Britain Memorial Flight represented the wartime Royal Air Force with the Douglas Dakota III. 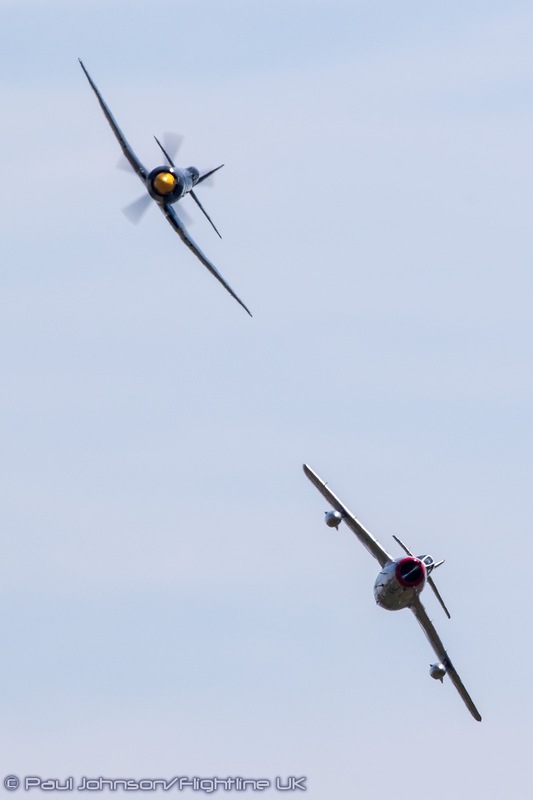 Sadly, the accompanying Spitfires were both unserviceable so their display was rather shortened. 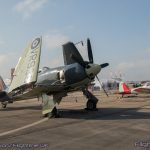 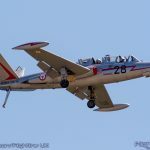 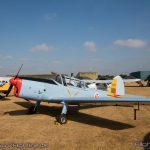 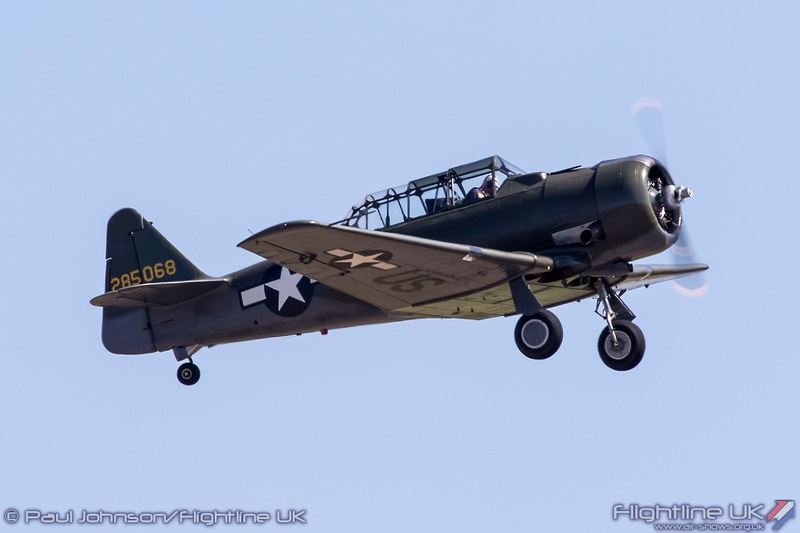 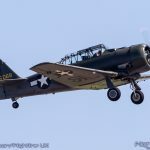 Organisers did try and plug the gap with Kennet Aviation’s AT-6D Texan but that suffered a technical problem oin take off so was forced to abandon its display. 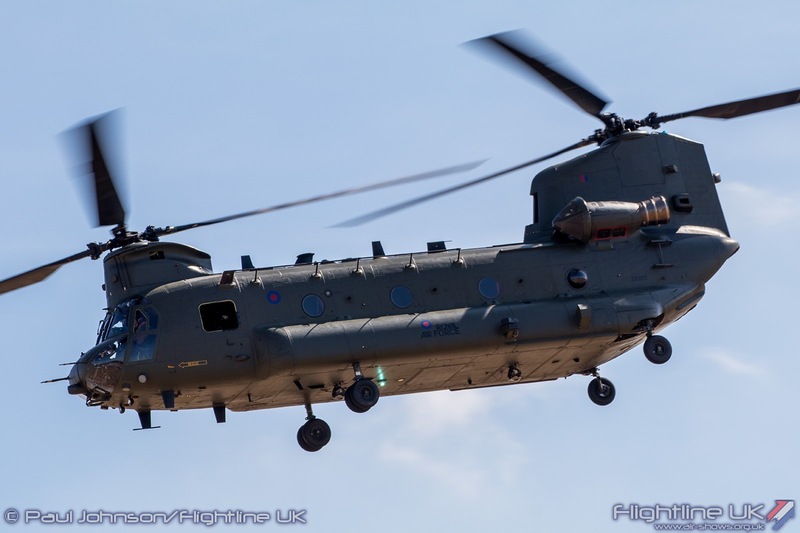 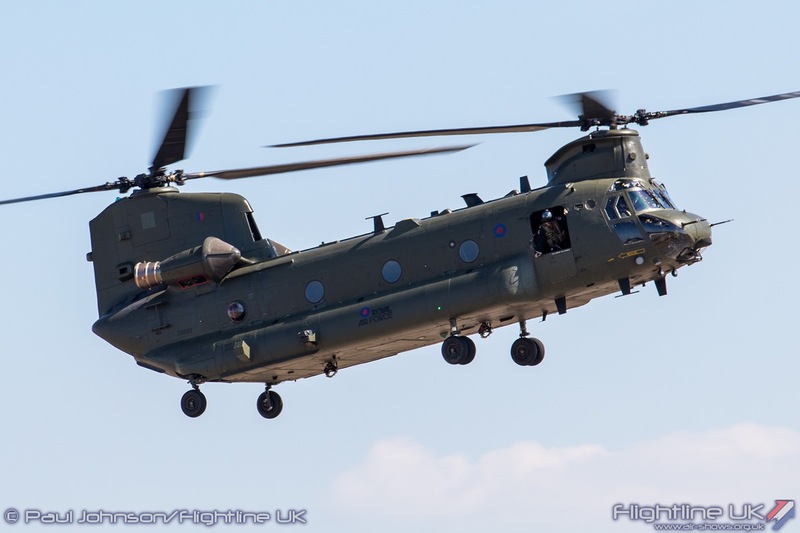 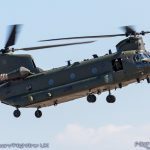 Bringing the story right up to date were solo displays from Flt Jim Peterson in the Eurofighter Typhoon FGR4 and the Boeing Chinook HC6A from the RAF Chinook Display Team. 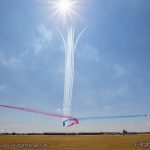 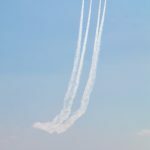 The highlight of the RAF participation however were the Red Arrows, the only big national jet team at this year’s Air Day. 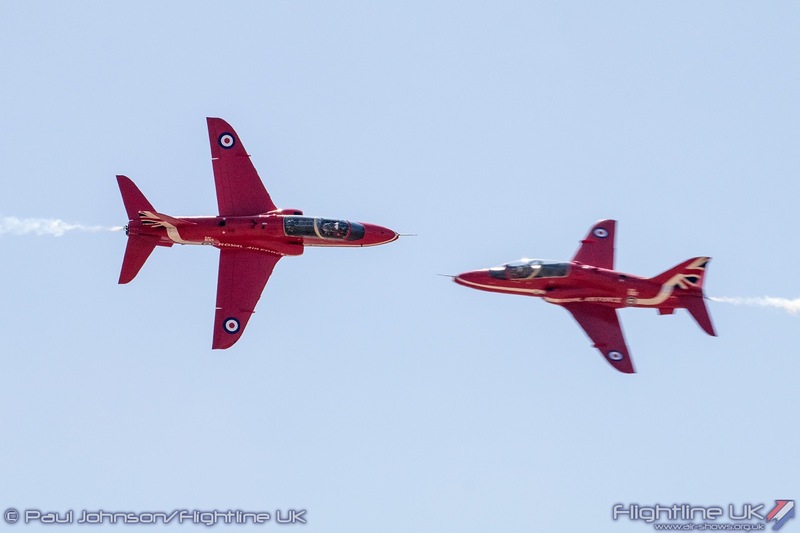 The team have highlighted the RAF100 theme with some new aerobatic shapes including “Lightning” which of special significance to the Fleet Air Arm as the F-35s are jointly operated by the RAF and Royal Navy and will fly from the new aircraft carriers. 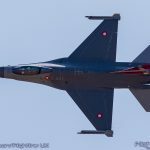 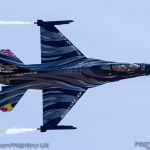 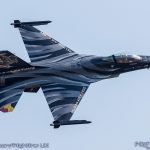 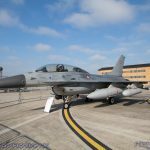 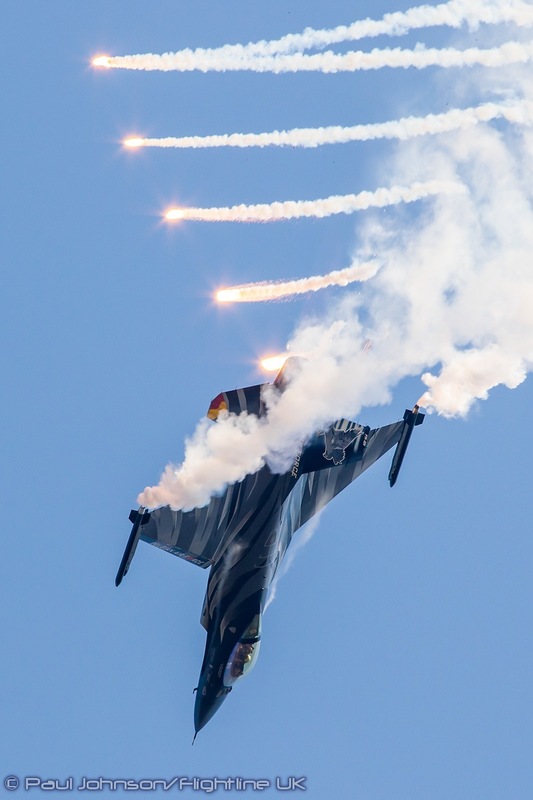 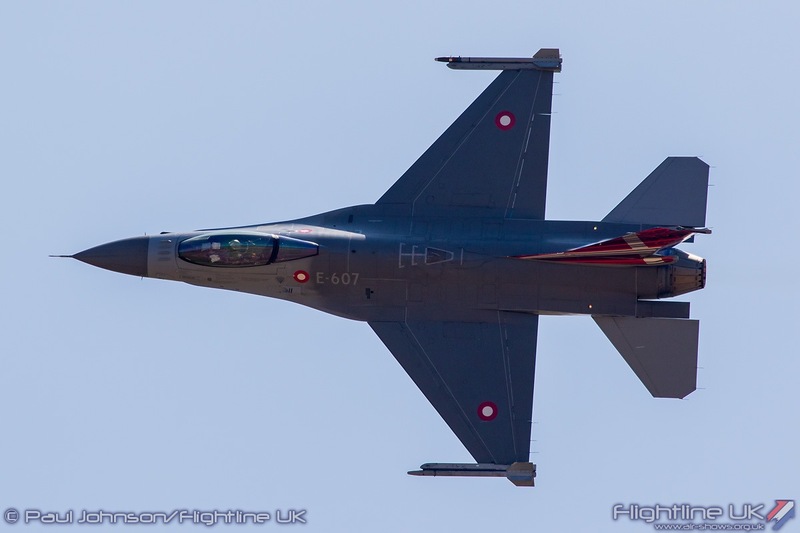 The Belgian F-16 was just one of three different F-16 solo displays at Air Day. 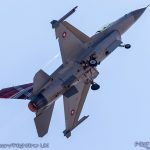 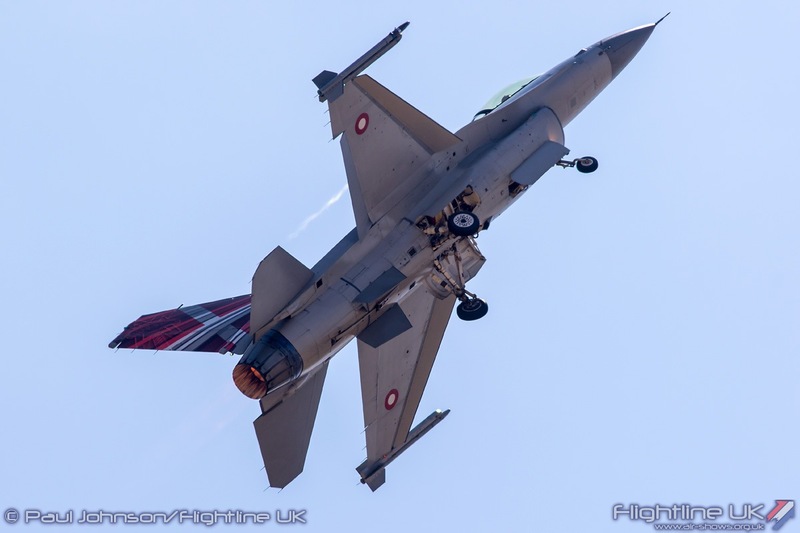 The Royal Danish Air Force’s F-16AM Fighting Falcon solo display was one of the most popular of Air Day 2017 so it was great to see them return. 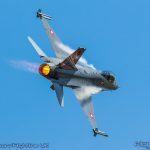 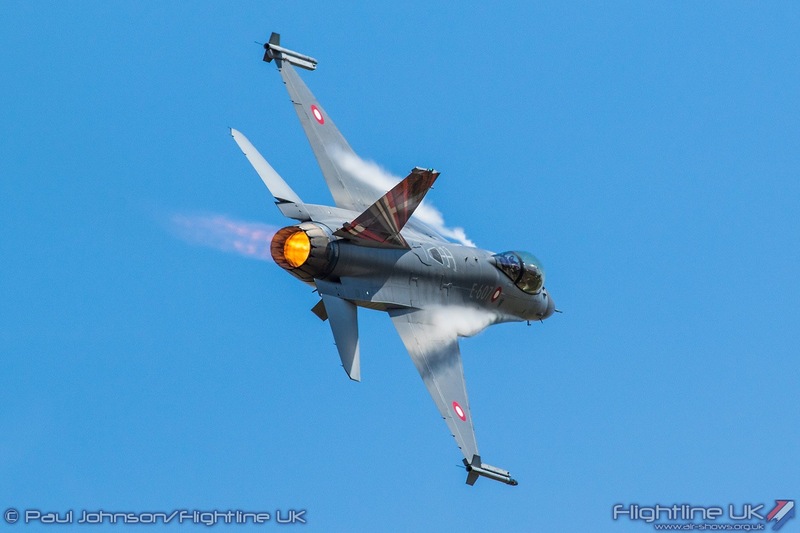 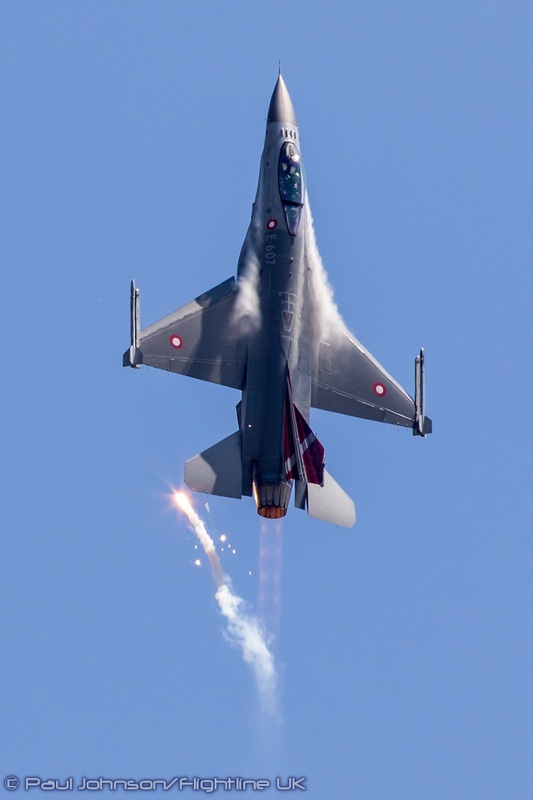 Unlike the other F-16 displays, the Danes don’t use smoke-winders but do give a very powerful performance showing the F-16 at both low and high speed with some wing-flexing tight turns and zoon climbs! 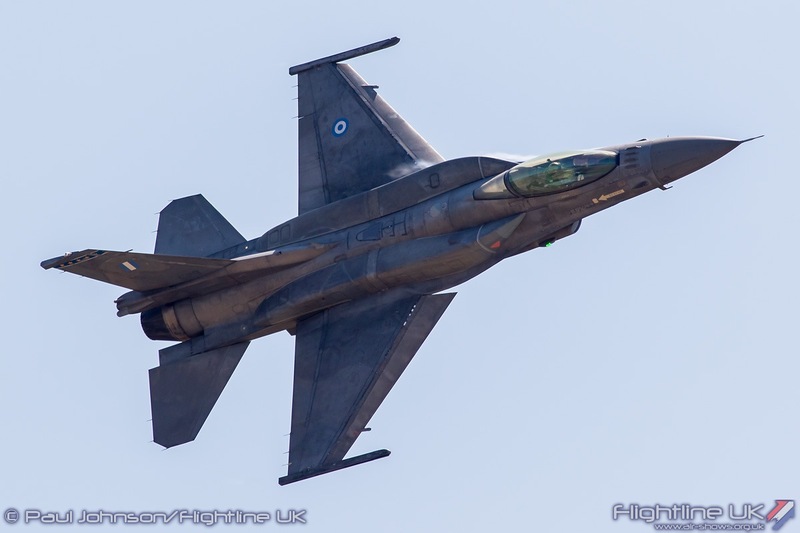 The Hellenic Air Force made their Air Day debut with the F-16C Fighting Falcon “Zeus” solo display. 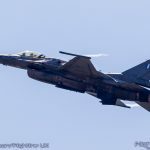 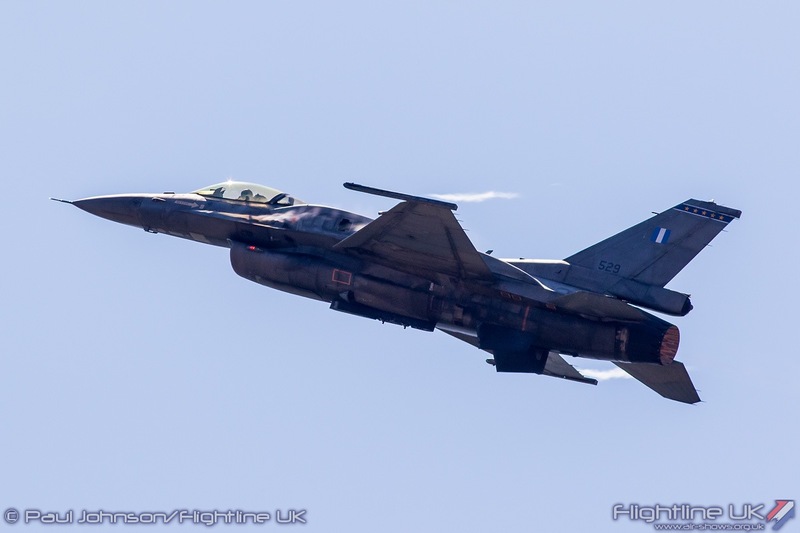 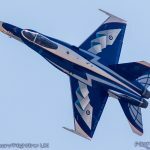 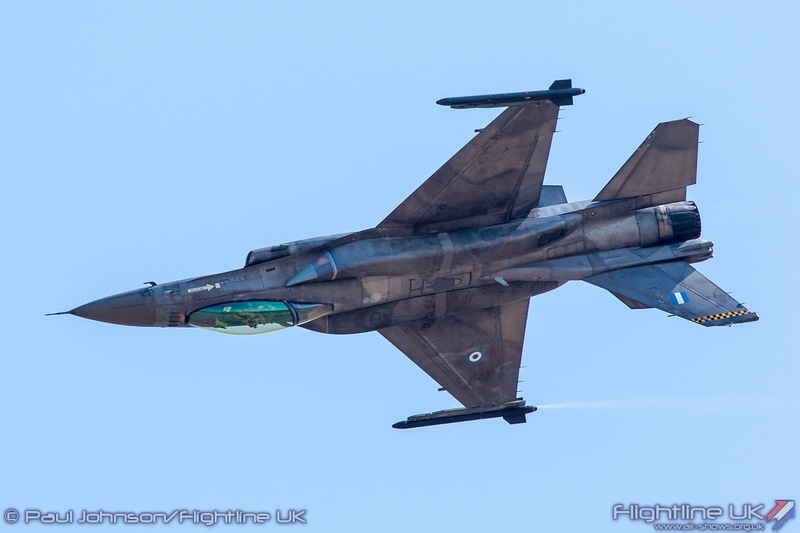 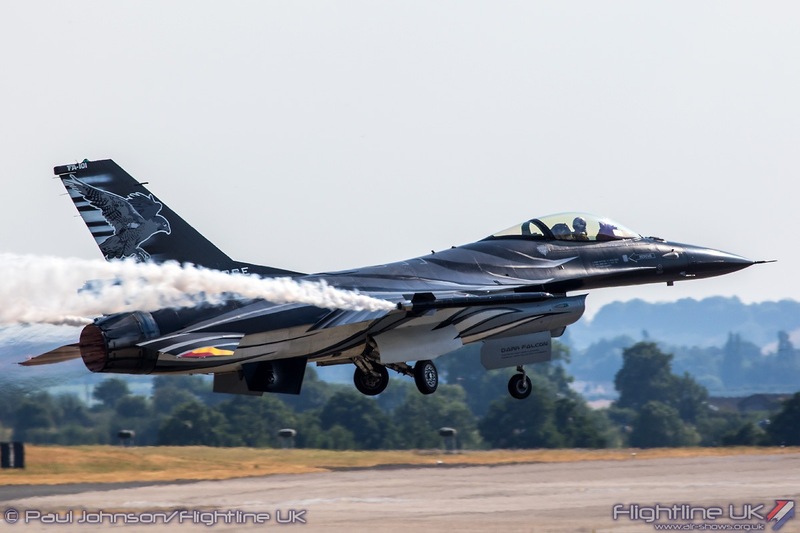 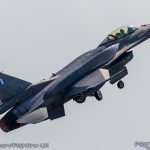 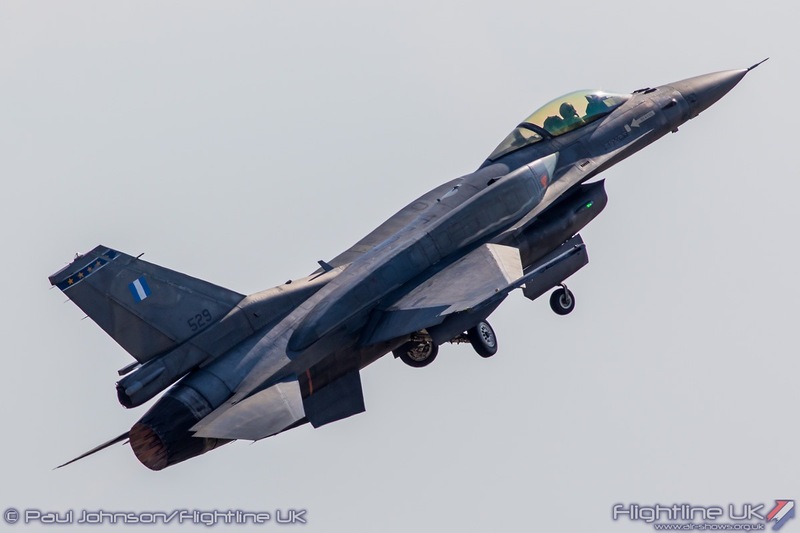 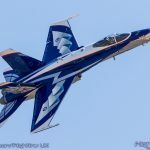 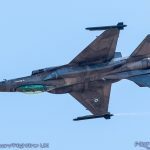 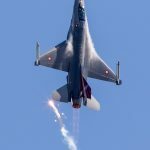 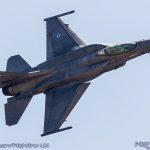 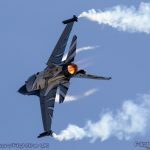 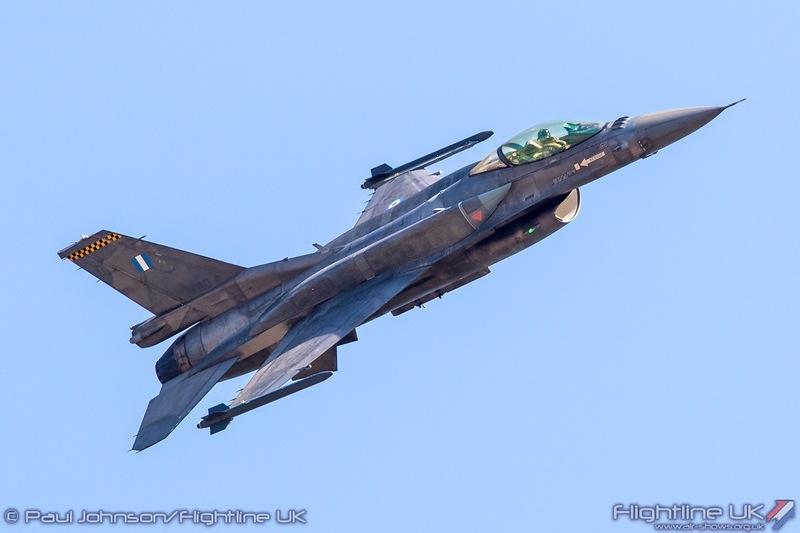 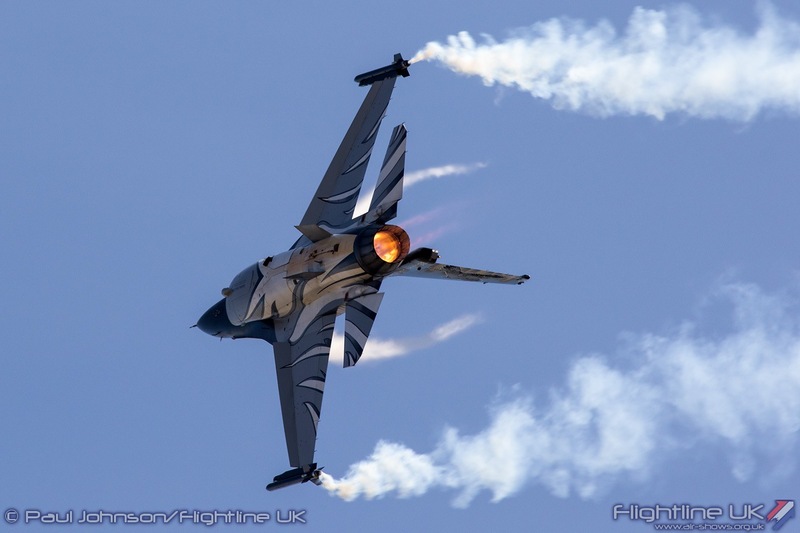 The Hellenic display is very different from the Belgian and Danish displays as initially the team were trained by the United States Air Force’s F-16 demo team with more emphasis on set piece figures. 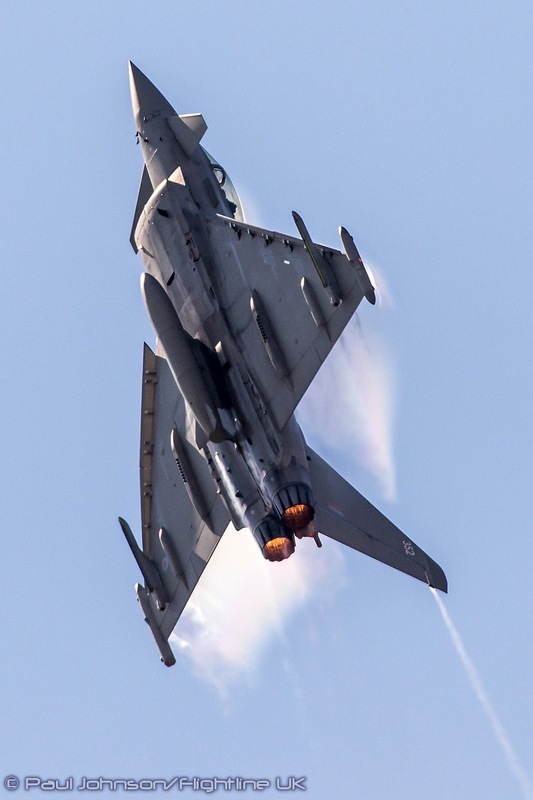 Their aircraft also looks much more purposeful as it is displayed with conformal fuel tanks mounted on the upper surfaces of the fuselage. 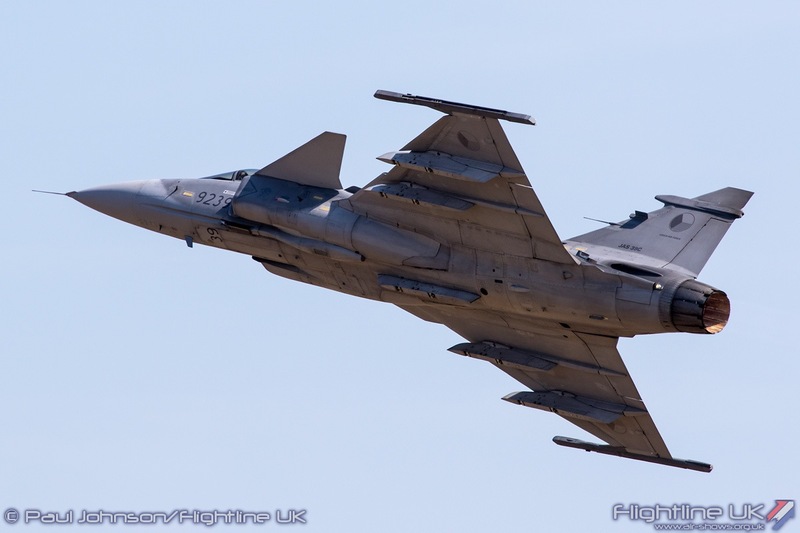 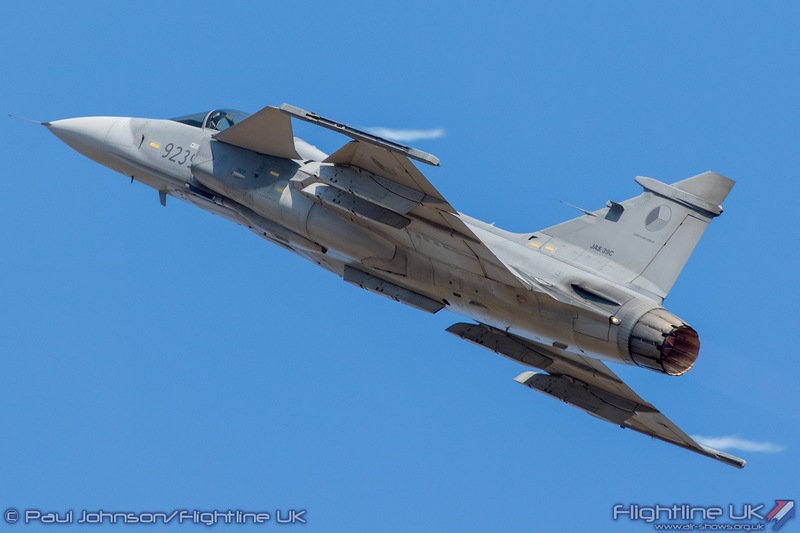 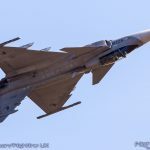 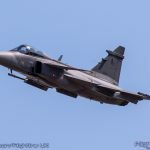 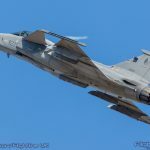 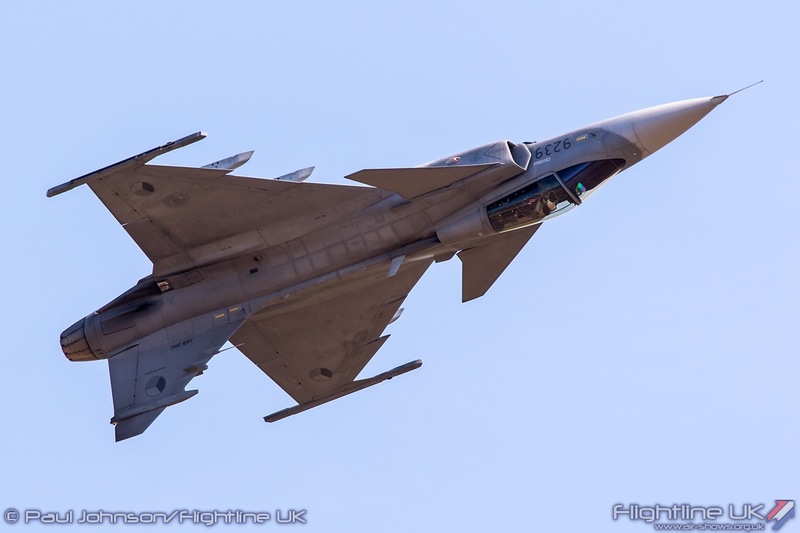 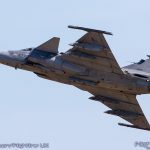 The Czech Air Force have also been good supporters of Air Day and this year saw the return of their SAAB JAS-39C Gripen solo. 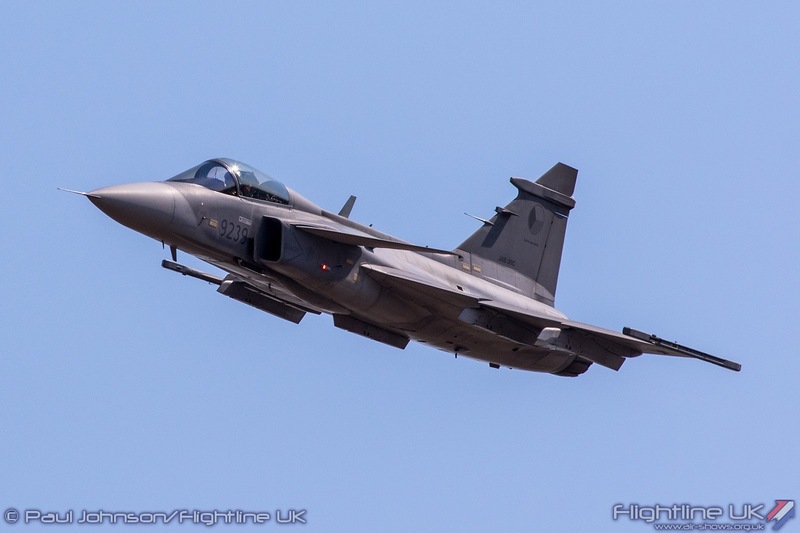 Gripens are always eye-catching performers at airshows with the aircraft boasting impressive agility at high and low speeds. 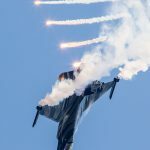 The display also made good use of flares to punctuate the routine. 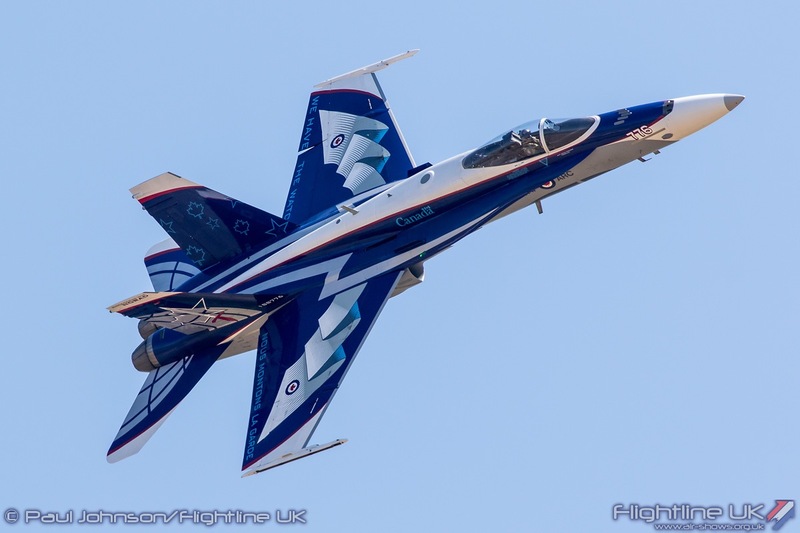 One of the stand out stars of the international line-up was the Royal Canadian Air Force’s CF-18 Demo Team. 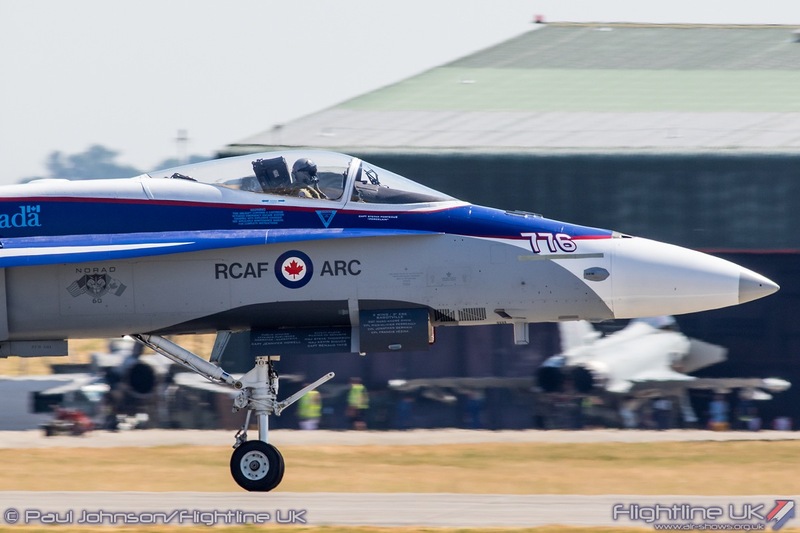 The team were conducting a mini UK tour in July visiting Yeovilton and the Royal International Air Tattoo as part of Canadian efforts to mark the 100th Anniversary of the Royal Air Force. 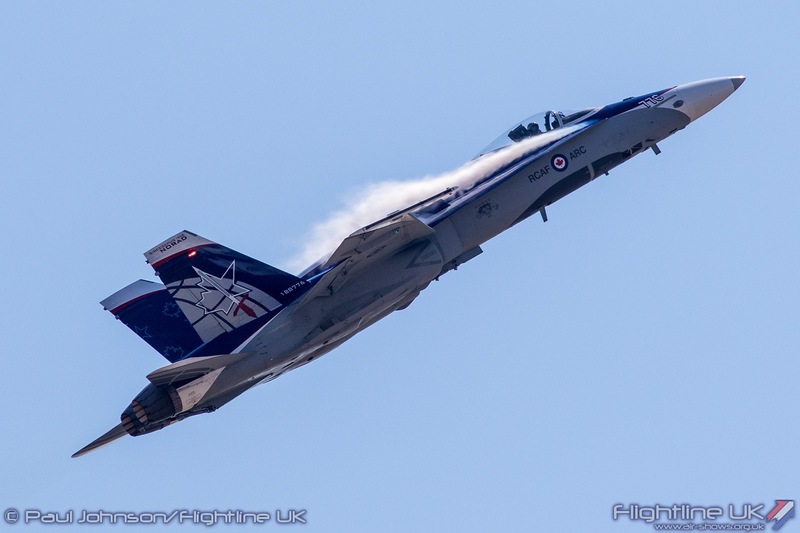 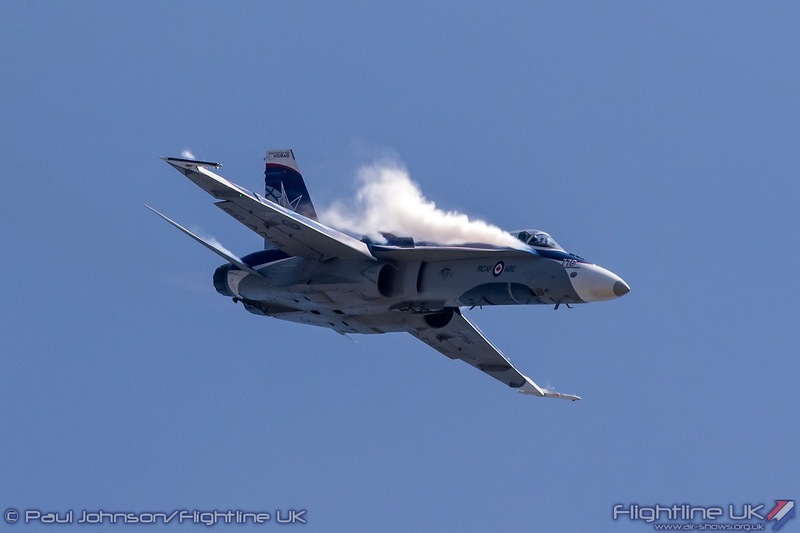 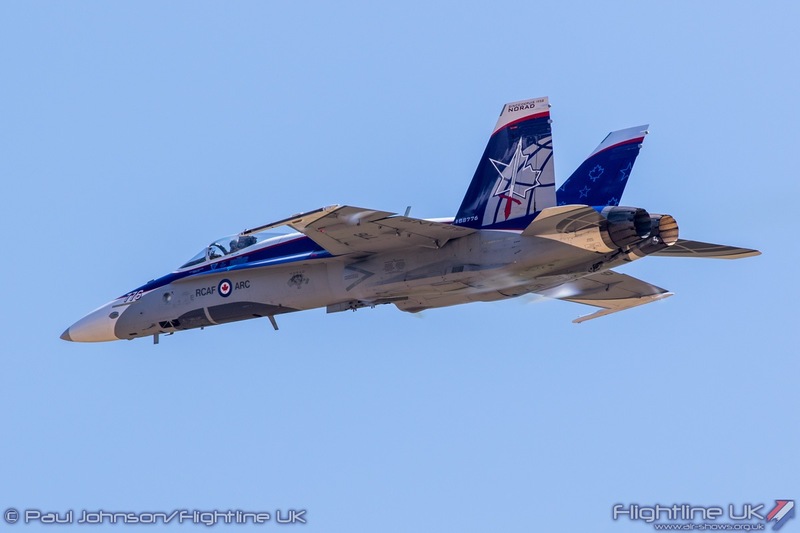 Captain Stefan Porteous is the 2018 display pilot and he gave a thunderous account of the McDonnell Douglas CF-188 Hornet. 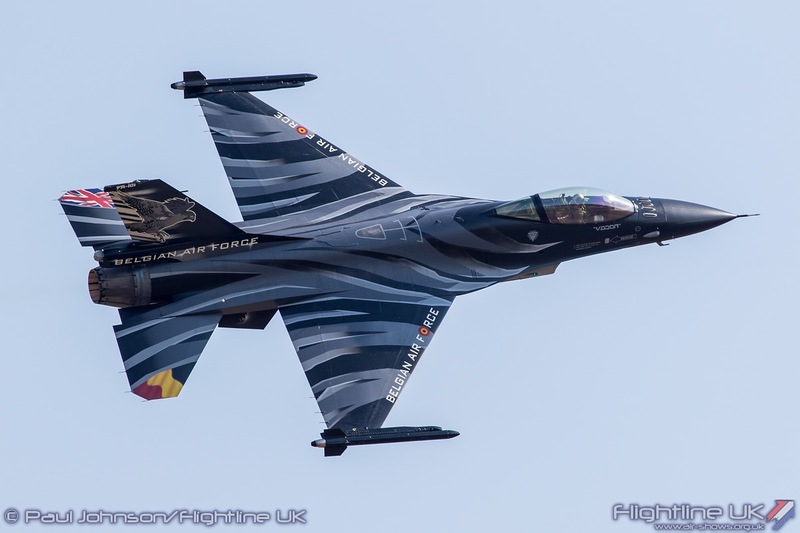 The team have become well known in recent years for applying some remarkable special schemes to their aircraft and this year’s scheme is nicknamed “Blue Steel.” The scheme celebrates the 60th anniversary of NORAD (North American Aerospace Defense Command) NOARD is a joint US and Canadian organisation which oversees airspace early warning and control for the North American continent. 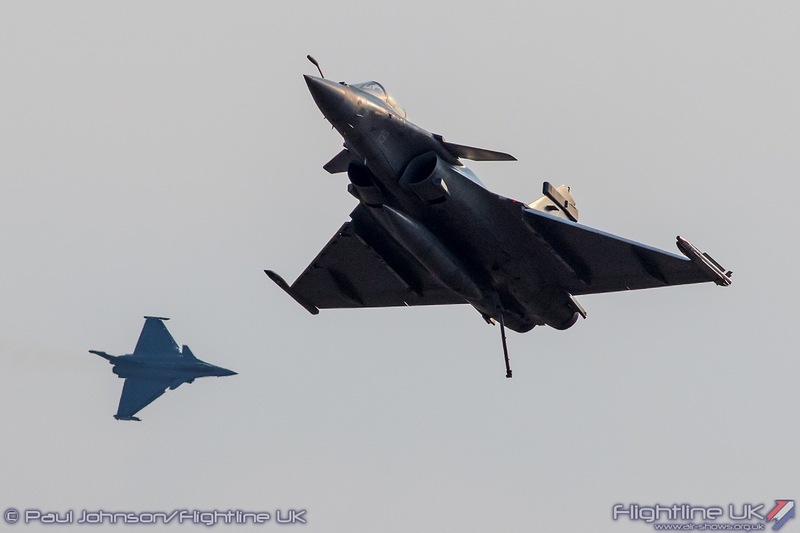 The other outstanding display came from the French Navy. 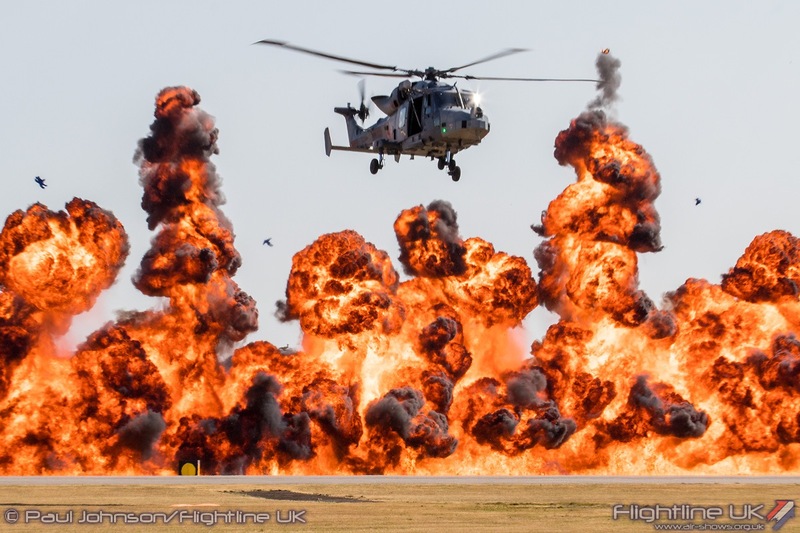 Yeovilton has become the place in the UK to see unique displays and role demonstrations from the French Navy. 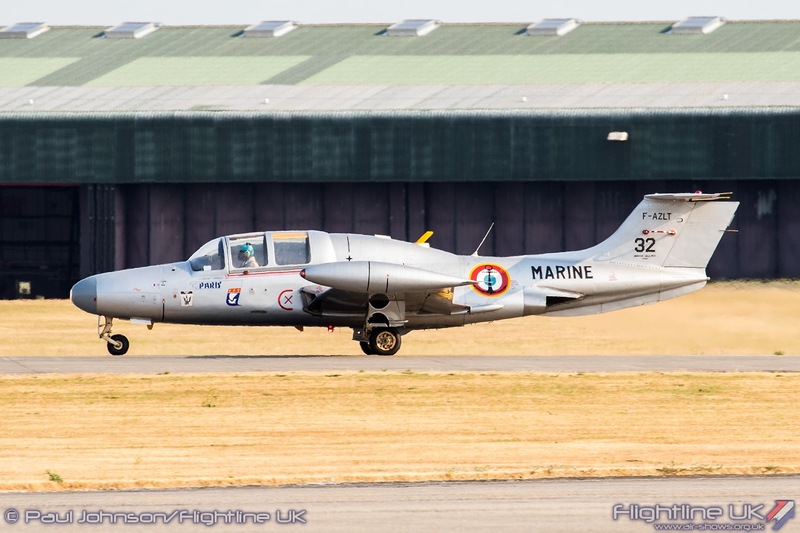 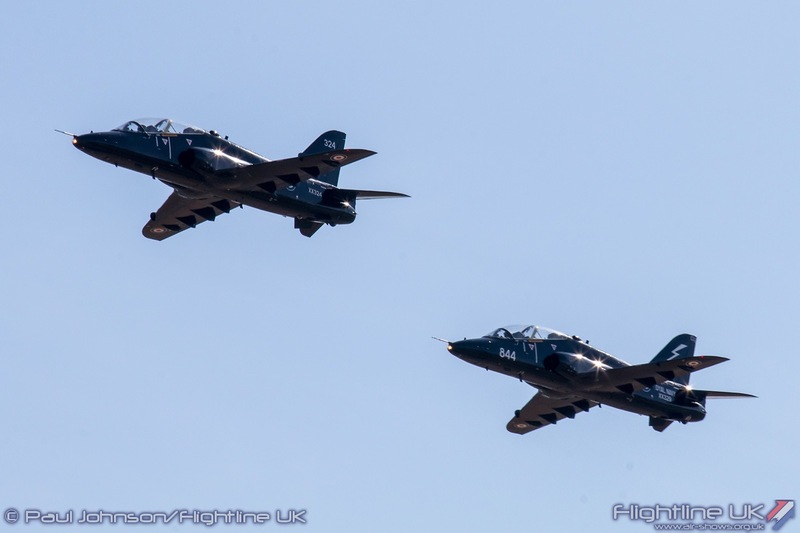 This year’s set-piece honoured not only current French Navy aviation, but also that of the Cold War with the ‘Corcardes Marine’ formation flypast. 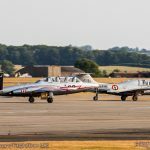 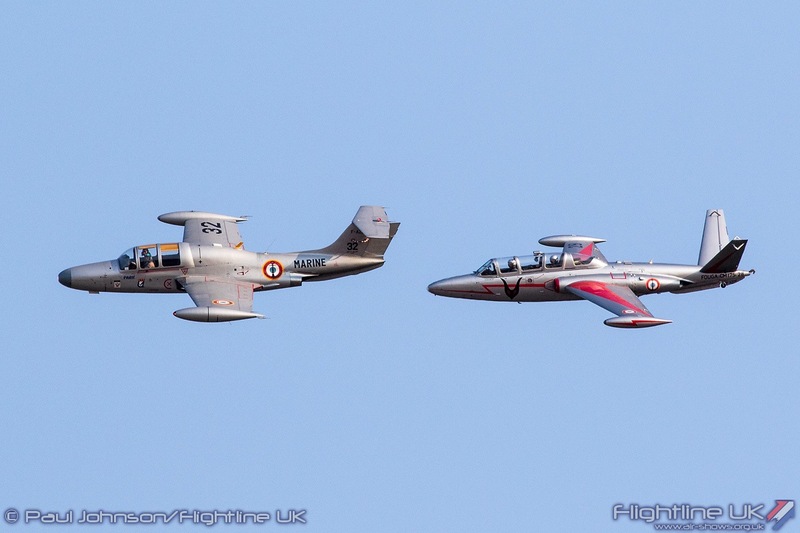 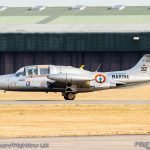 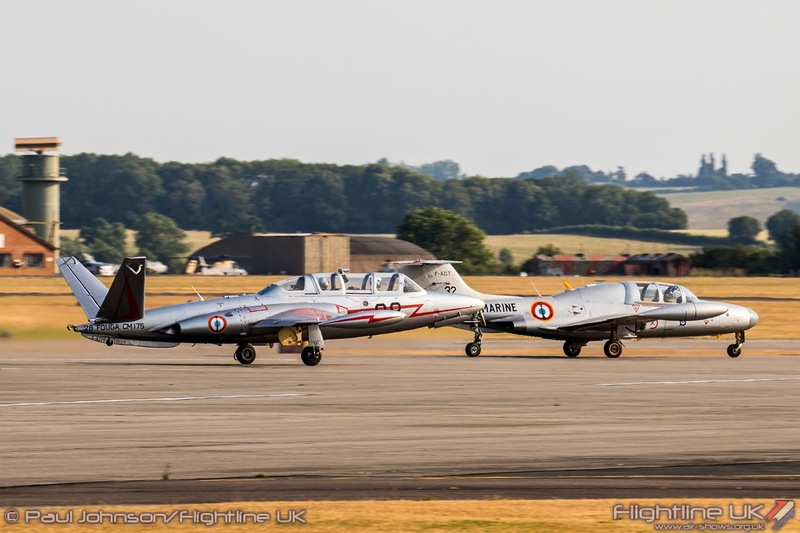 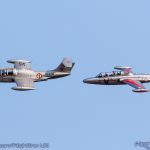 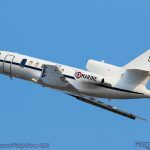 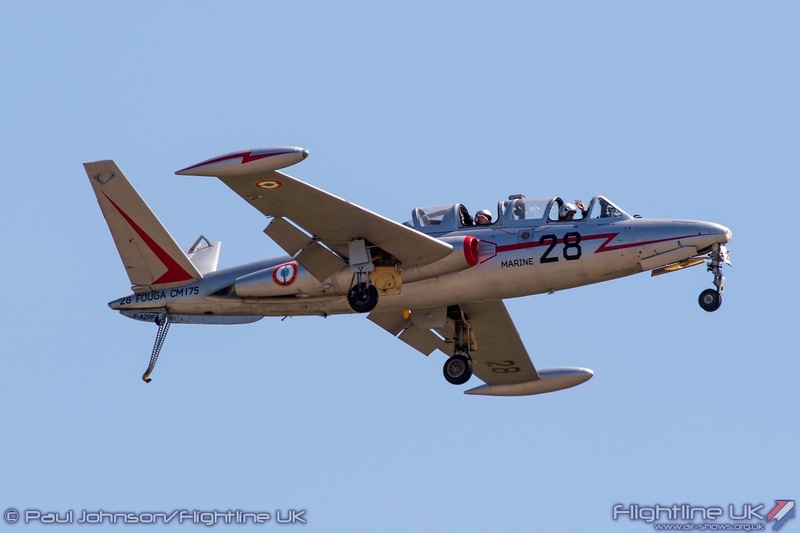 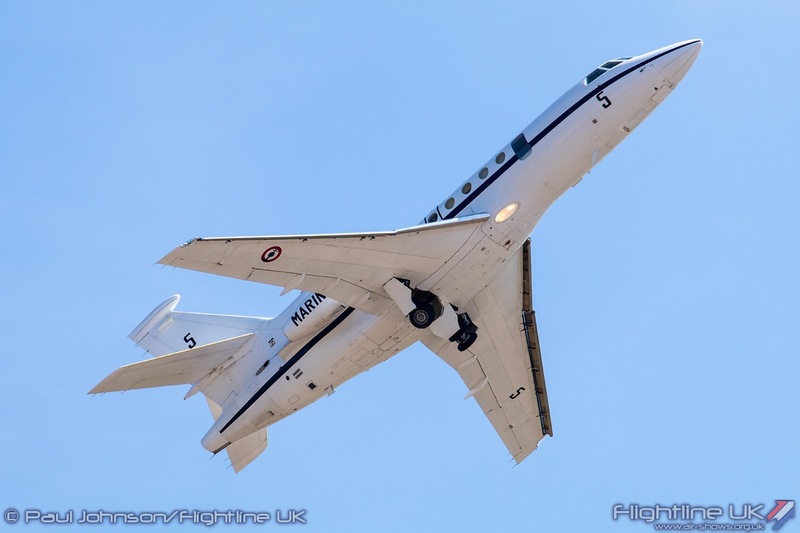 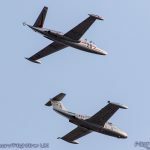 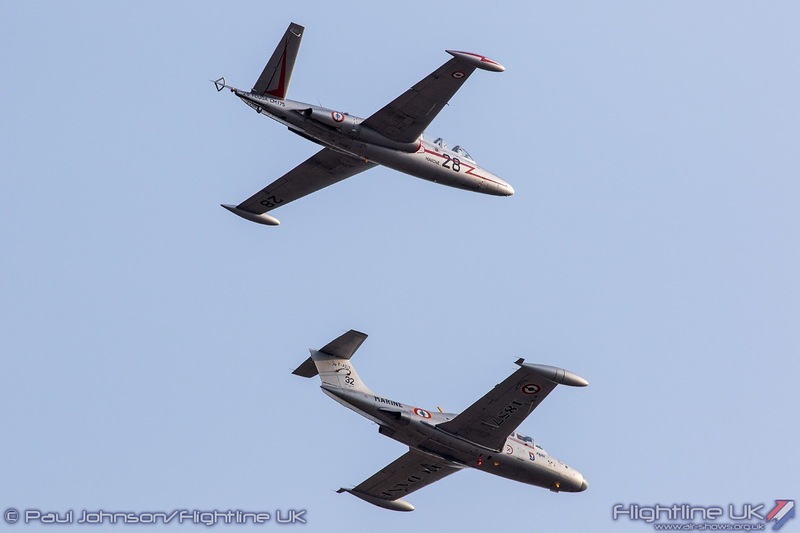 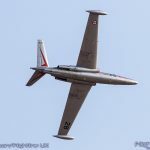 This was the first time such a formation had been seen outside of France and saw a modern day Dassault Falcon 50M maritime lead a Fouga CM175 Zéphyr from Association Zéphyr 28 , Morane Saulnier MS760 Paris from Armor Aéro Passion and a pair of Dassault Rafale Ms. 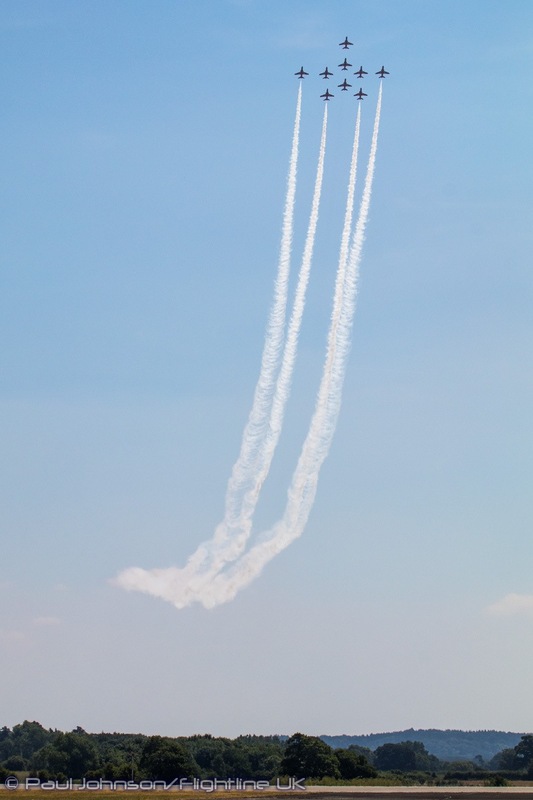 Following their formation pass, each element gave its own solo displays. 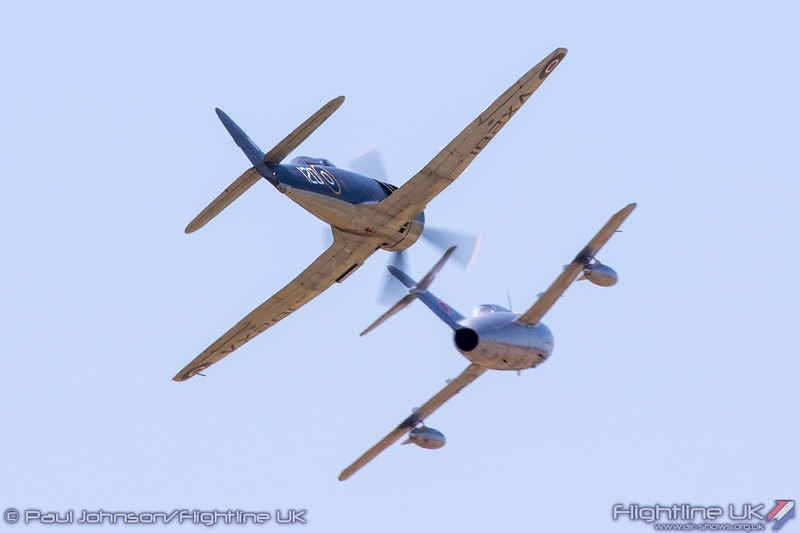 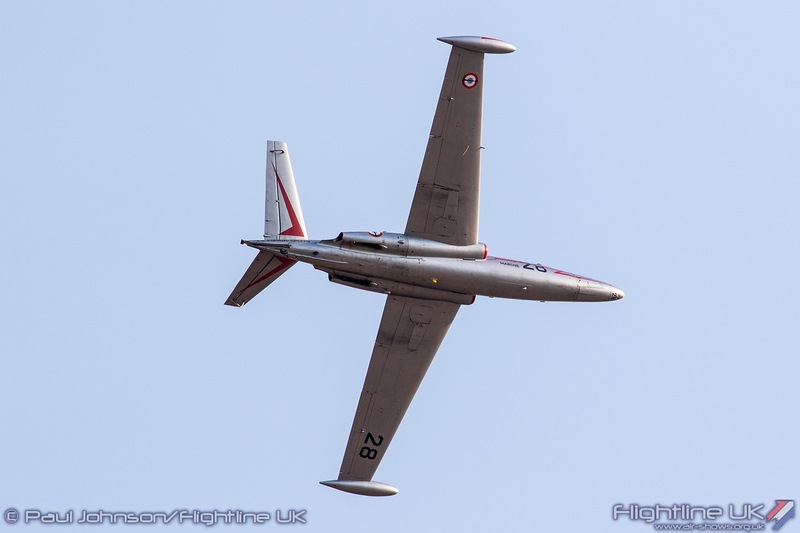 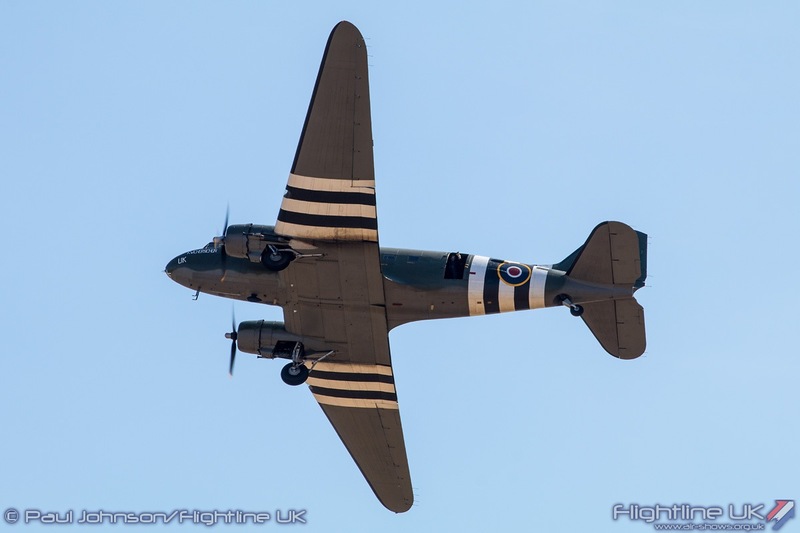 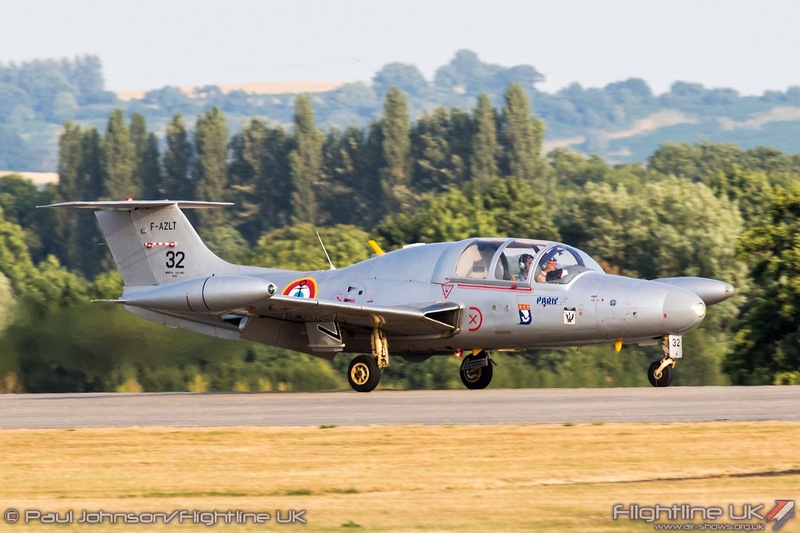 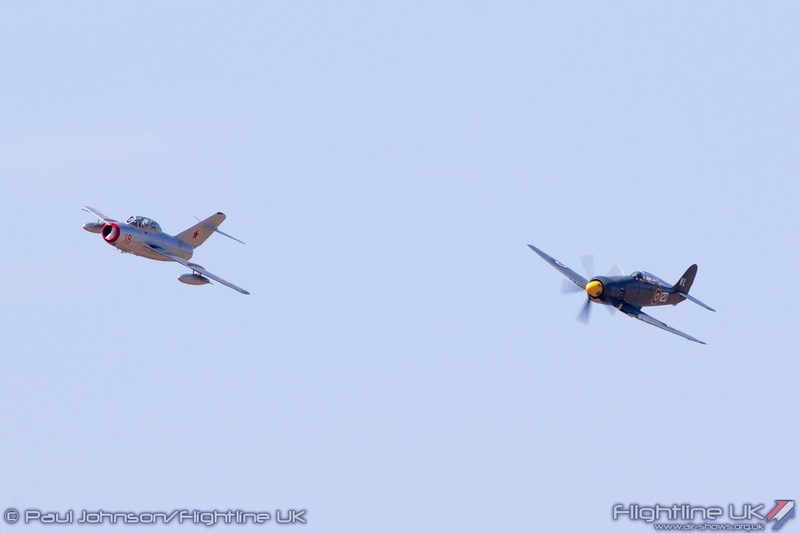 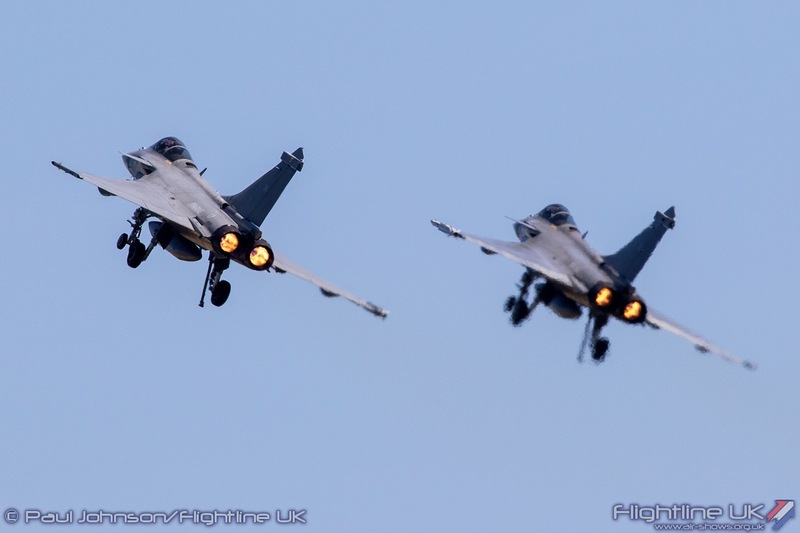 For the Paris and the Zéphyr, Air Day marked their first displays on the UK mainland (both have appeared in Jersey) and were highlights of the flying display in their own right. 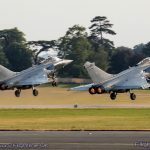 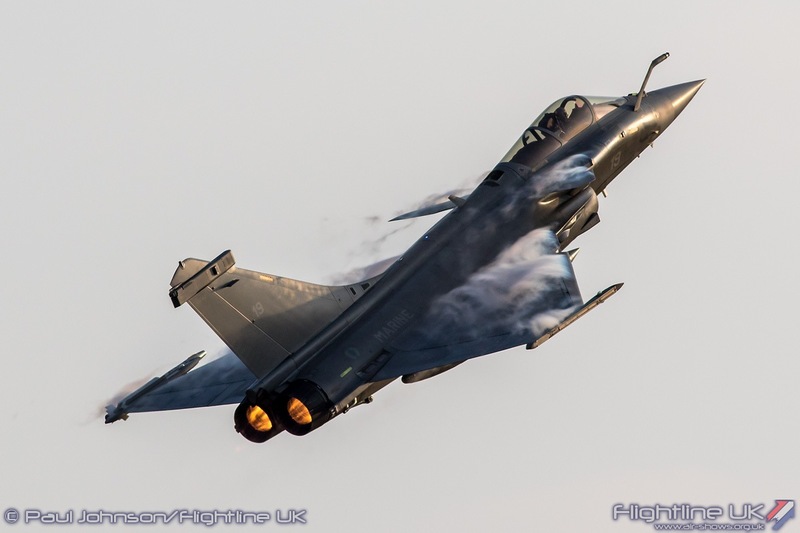 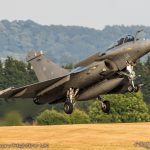 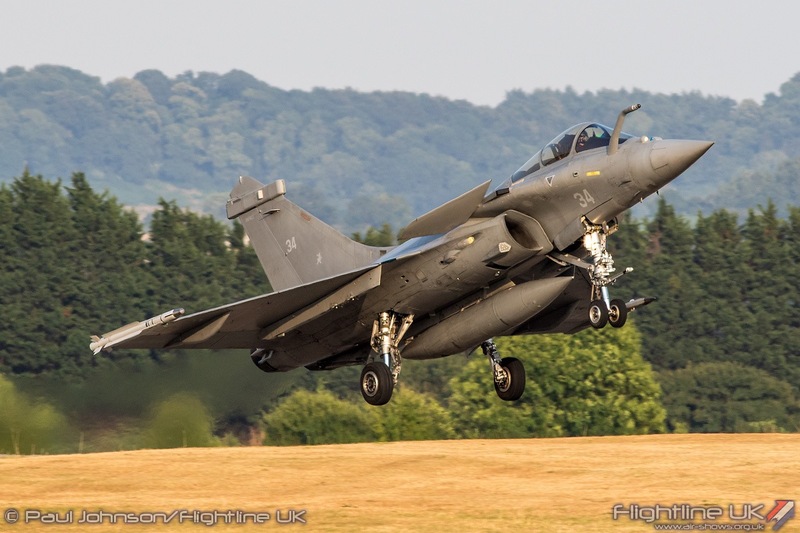 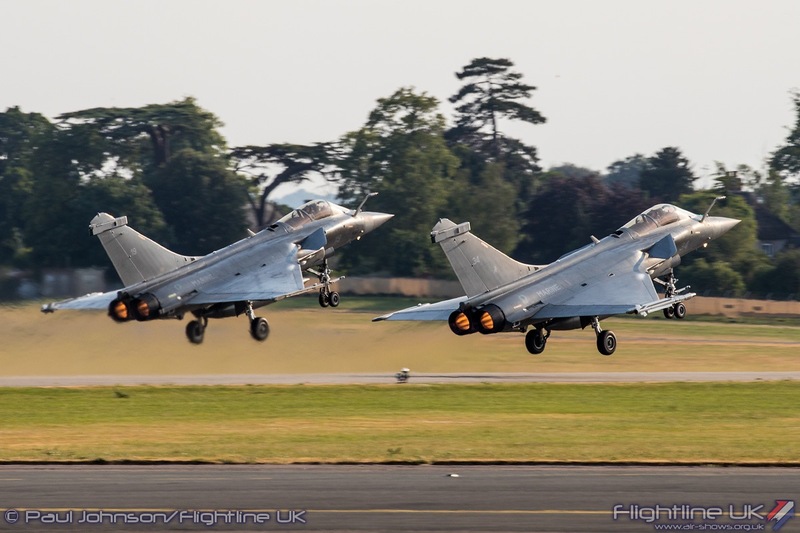 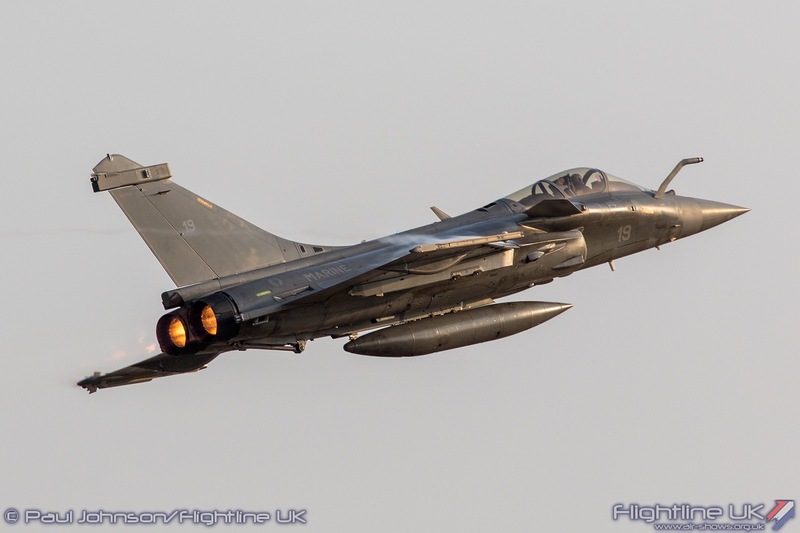 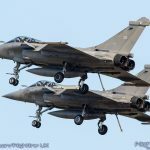 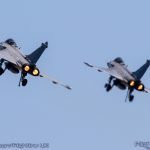 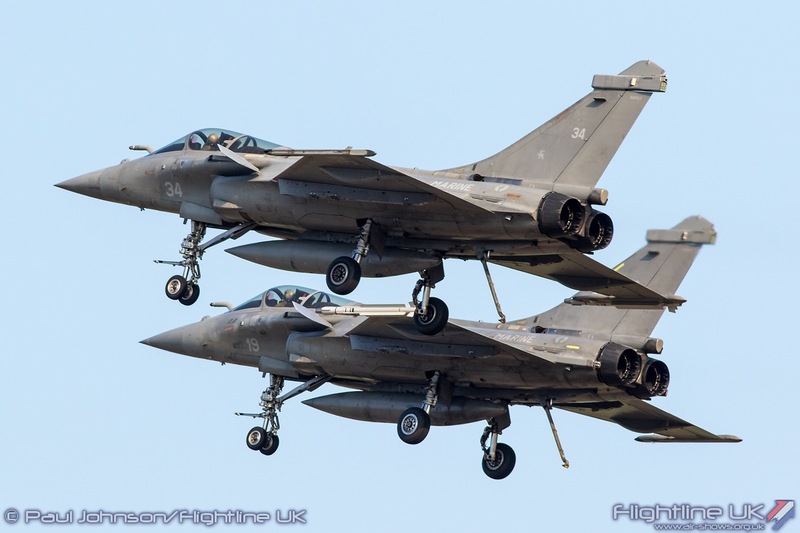 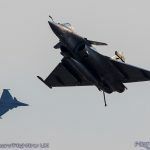 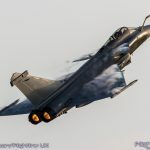 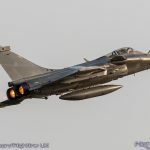 The pair of Rafale Ms also gave their now traditional noisy role demonstration not only showing off the combat potential of the aircraft but also its ability to operate from France’s aircraft carrier with some missed approaches and go-arounds with tailhooks extended. 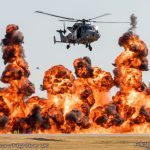 RNAS Yeovilton International Air Day will go down in the record books as one of the finest editions of the show. 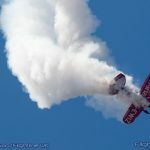 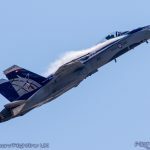 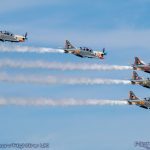 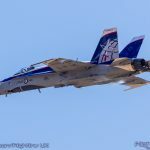 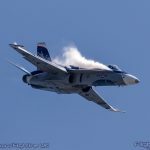 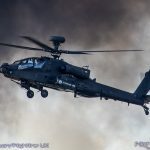 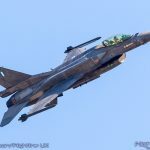 As always the home team put in a lot of effort to show their own capabilities off at their very best with some very engaging displays in the air and on the ground. 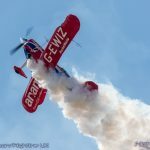 But this year it was the international element that really stood out and made this one of the very best airshows of the year in Europe. 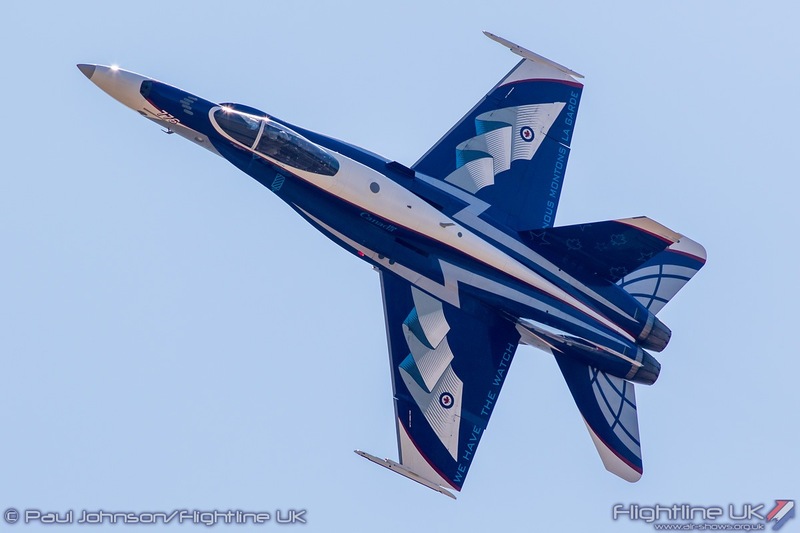 In particular the stand out contributions from Canada and France will live long in the memory.